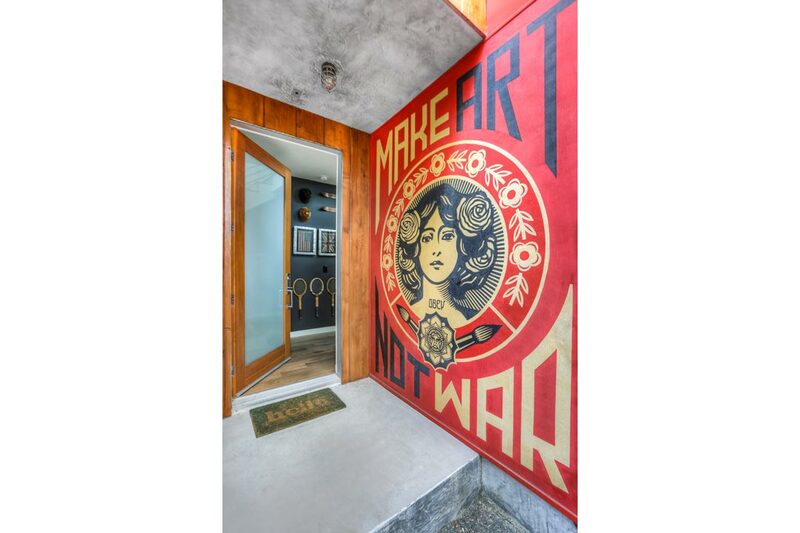 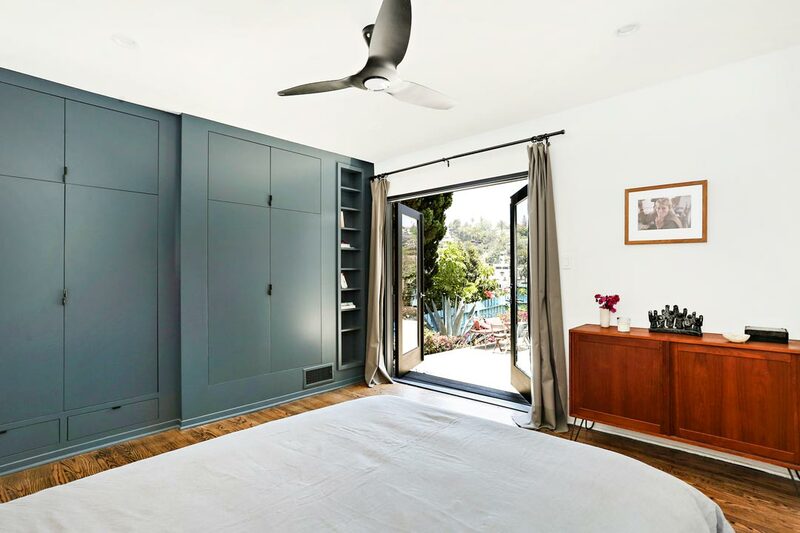 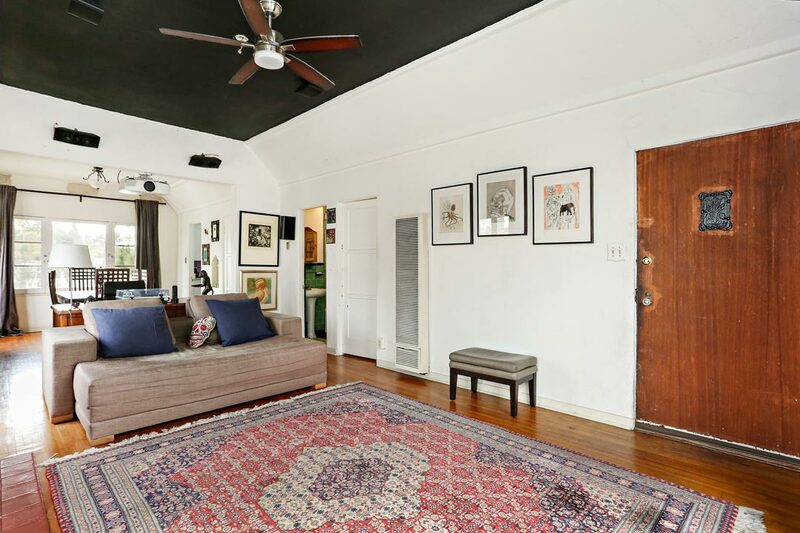 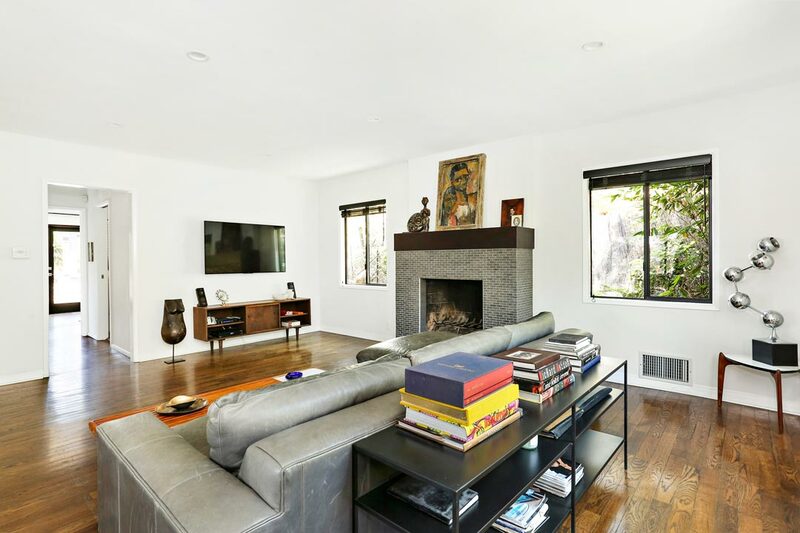 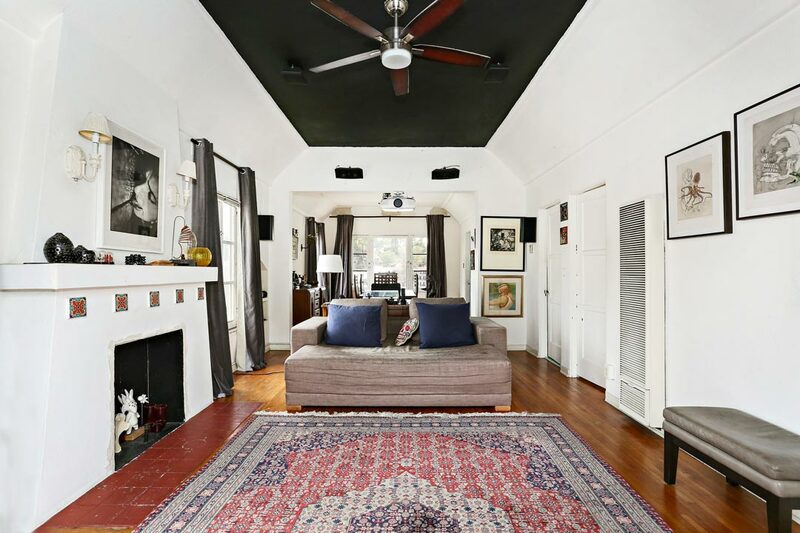 Well located in Silver Lake, this private and serene residence is an art lover’s dream with bright, open spaces to inspire creativity. 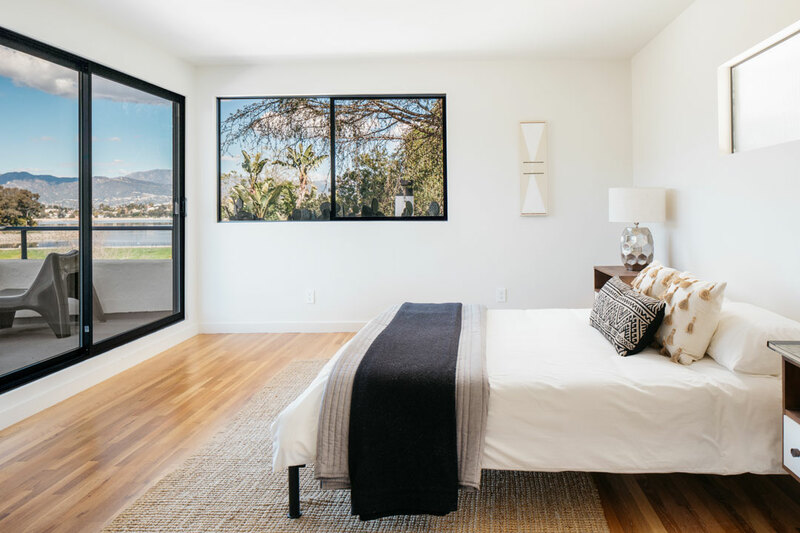 The Contemporary-style residence presents a light-filled open layout synthesizing stylish design with dramatic architectural elements including high ceilings, oversized windows and sliding glass doors. 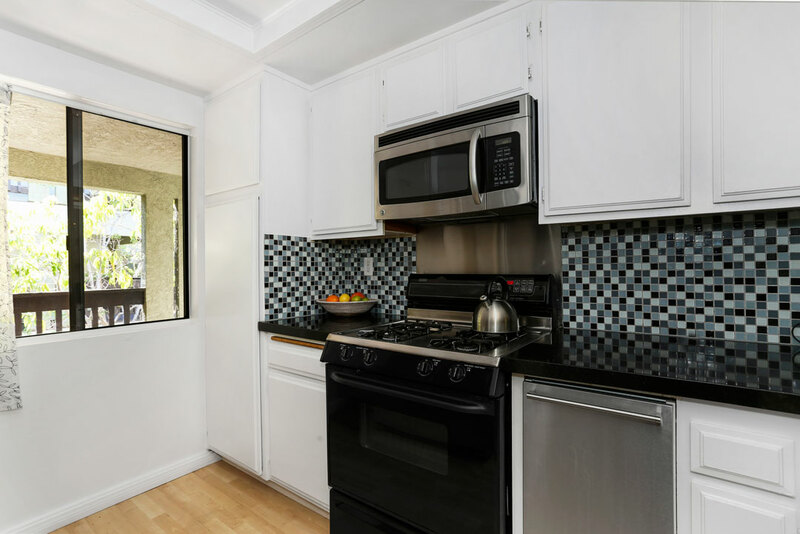 The kitchen is finished with a full-wall penny tile backsplash and stainless appliances; French oak flooring flows throughout. 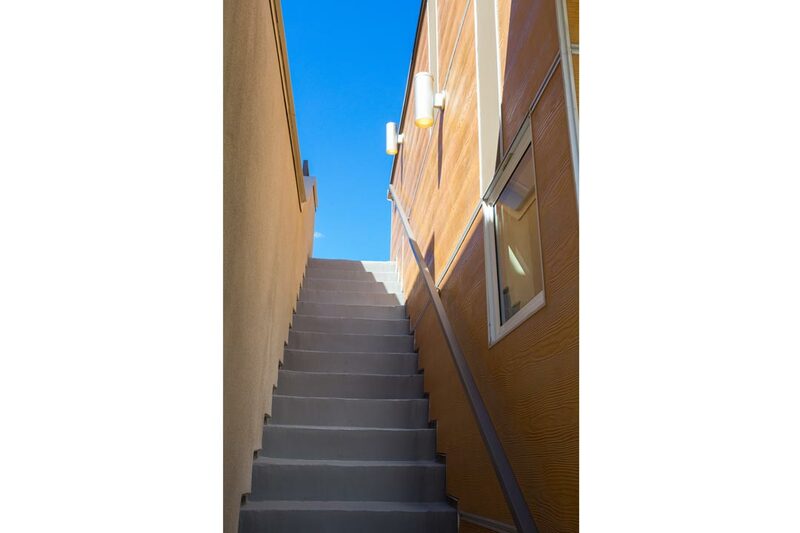 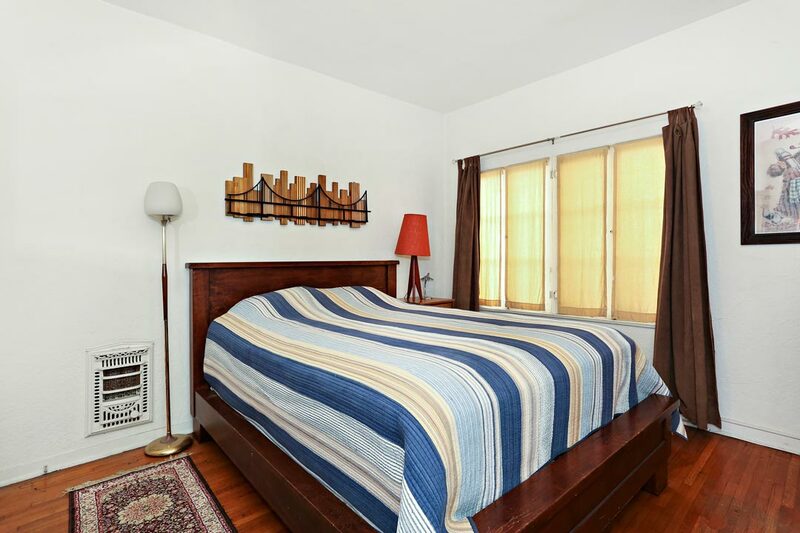 Upstairs, three bedrooms include the ensuite Master with hillside views and a spacious walk-in closet. 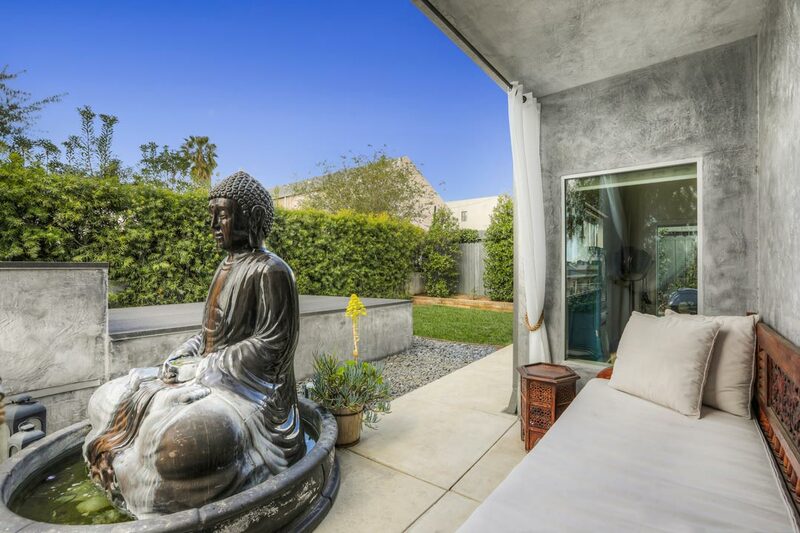 A high hedge and fence create a gracious outdoor environment with a wraparound porch, tranquil Buddha fountain and flat yard, ideal for relaxation and open-air dining. 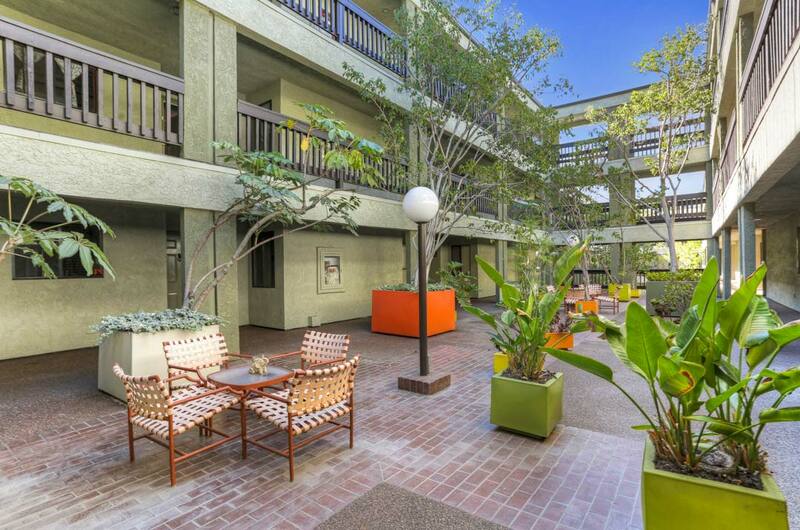 Amenities include gated access, central heat+air and a two-car garage. 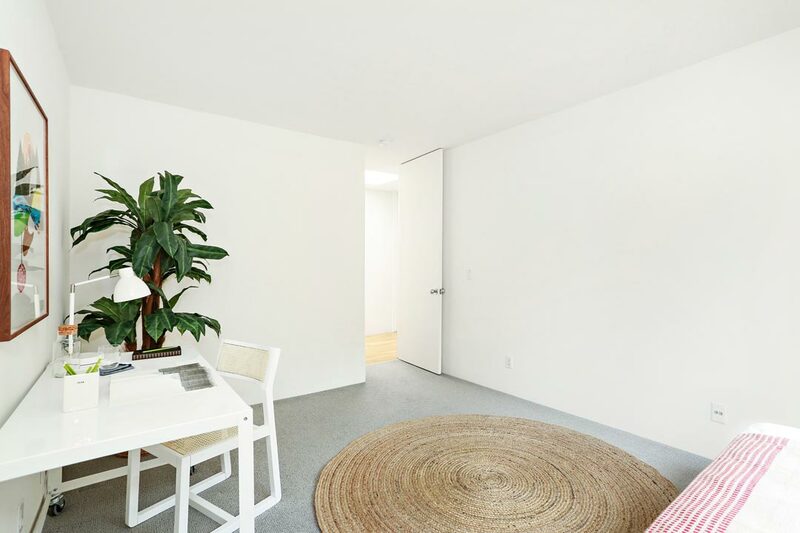 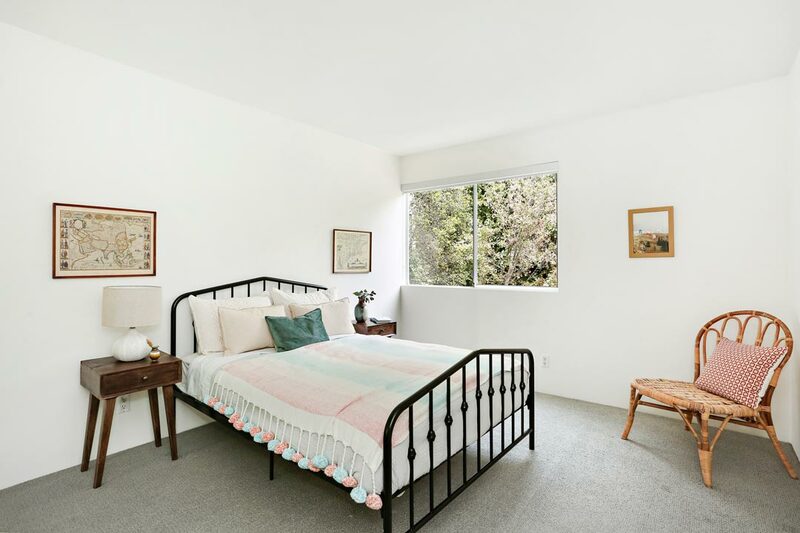 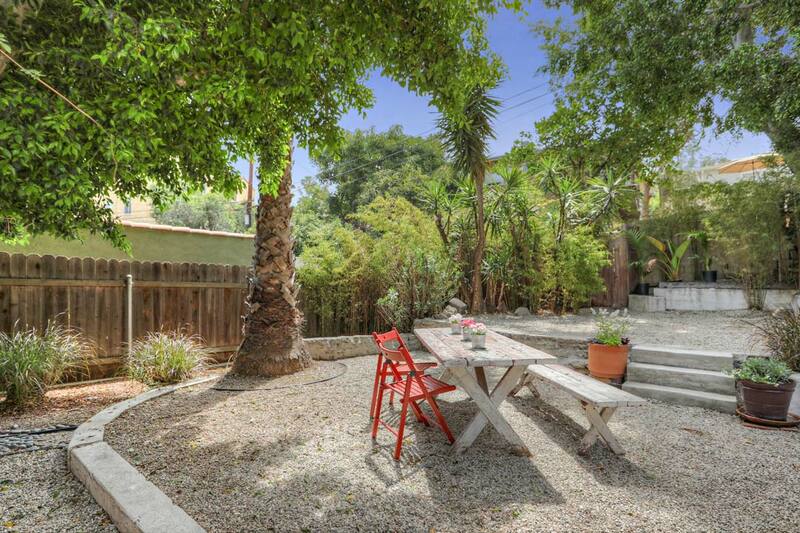 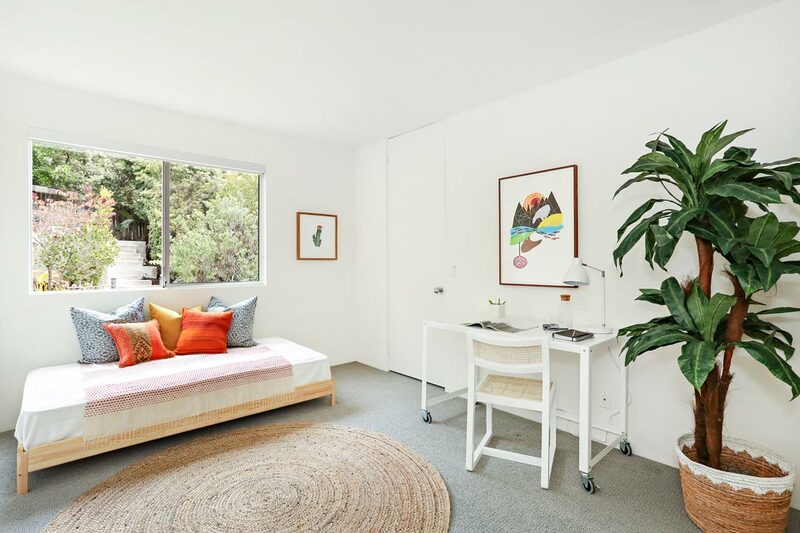 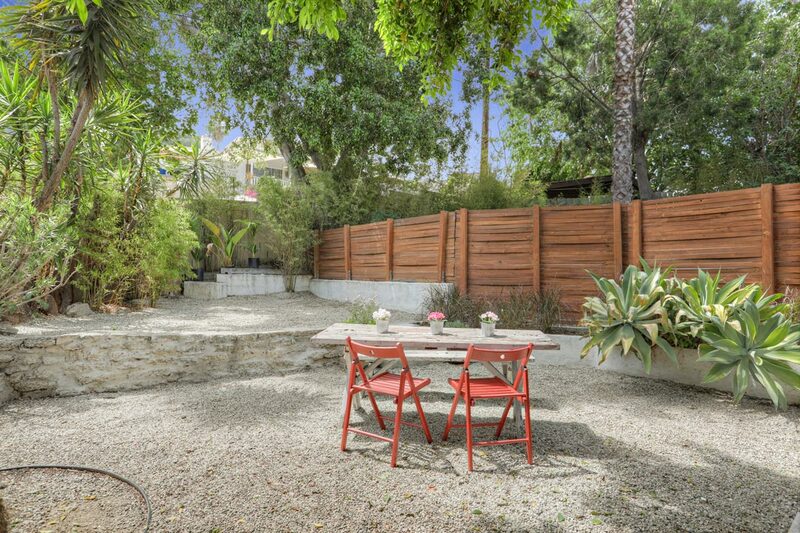 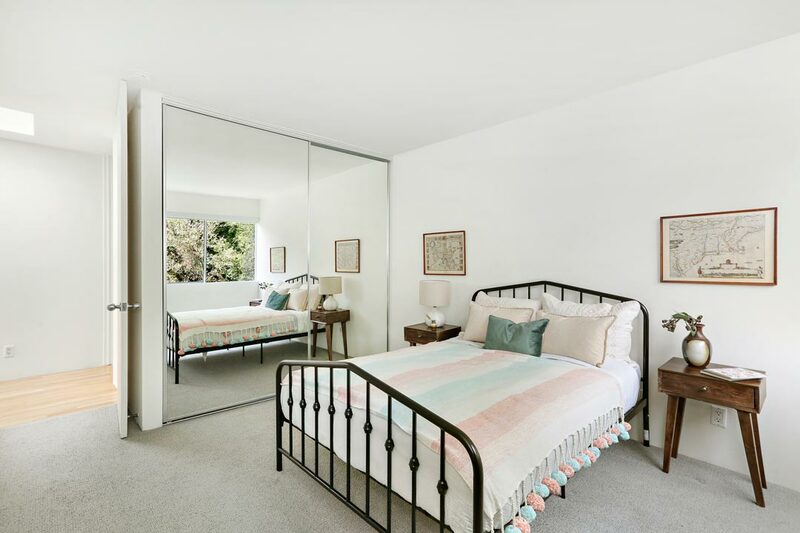 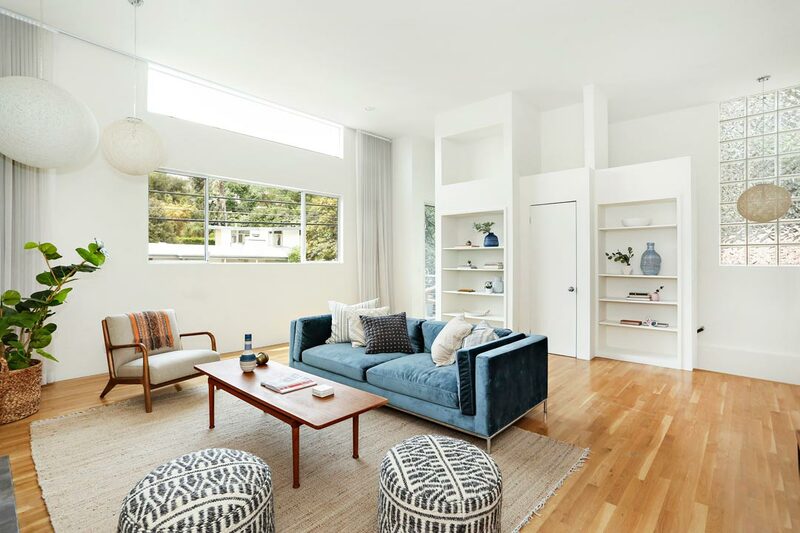 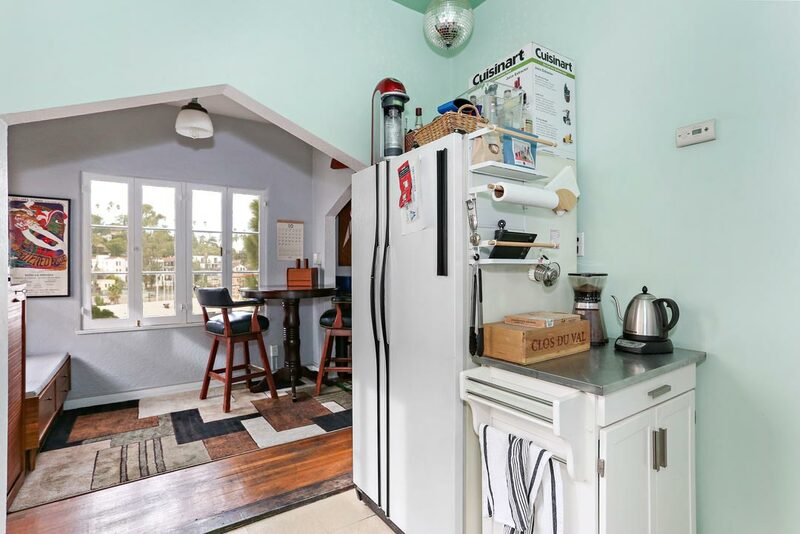 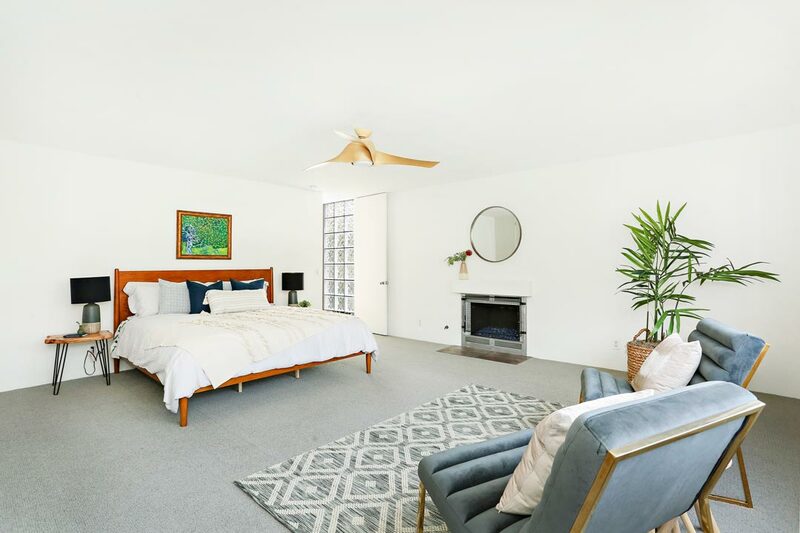 This great location is just a stone’s throw from Sunset Junction offering easy access to the twice-weekly Silver Lake Farmer’s Market, Alfred Coffee, Night+Market Song and so much more. 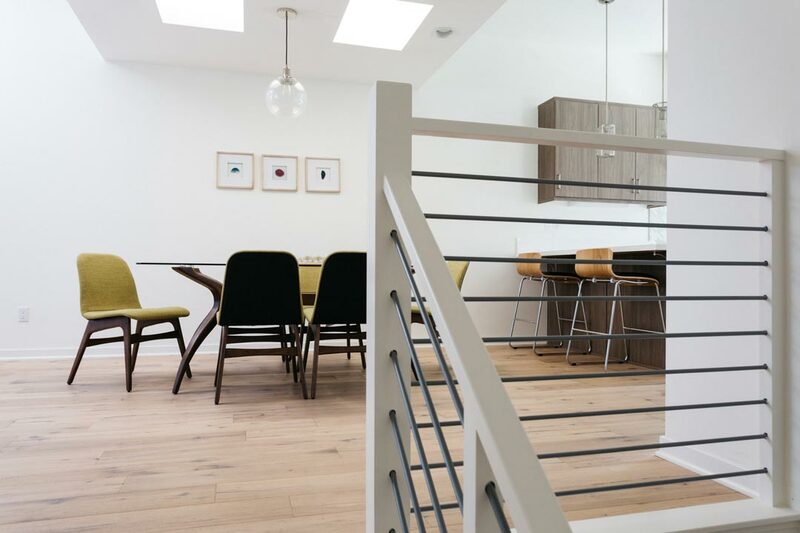 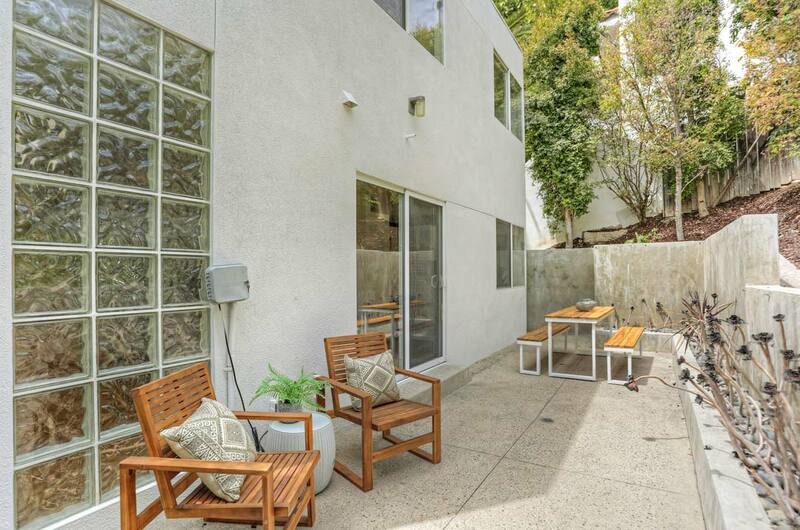 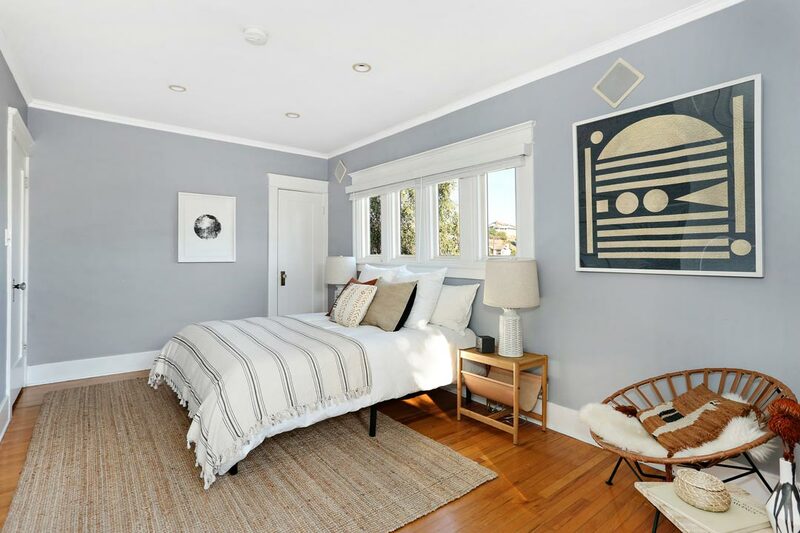 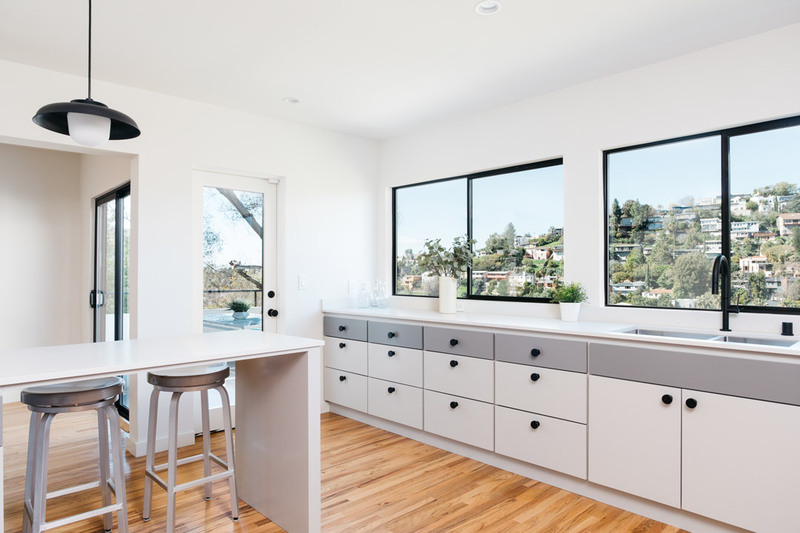 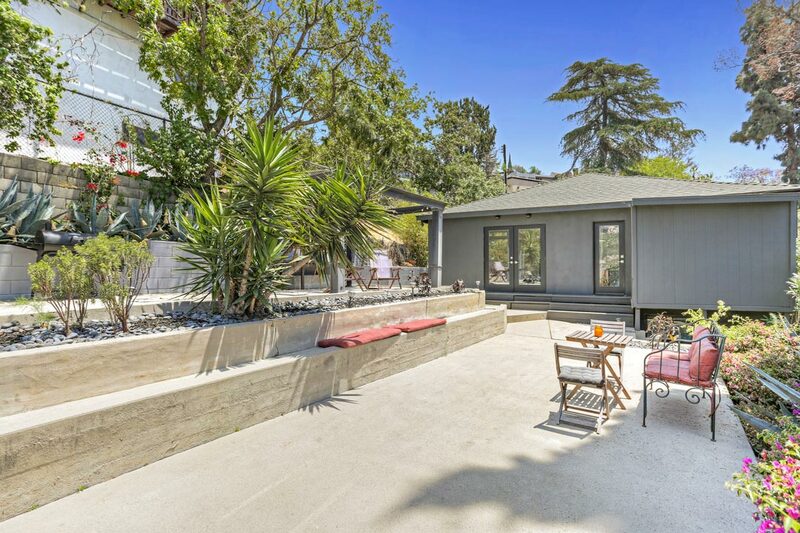 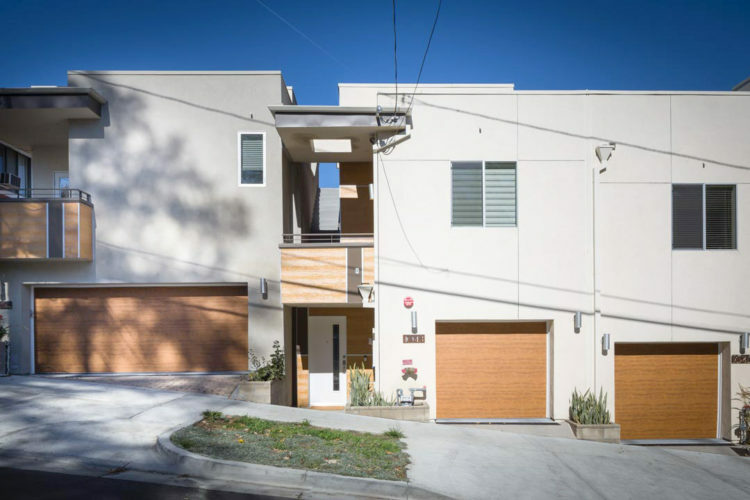 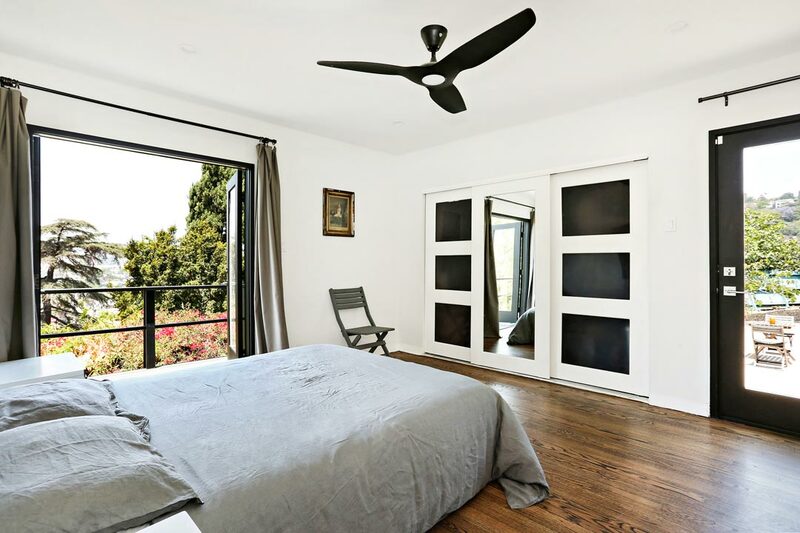 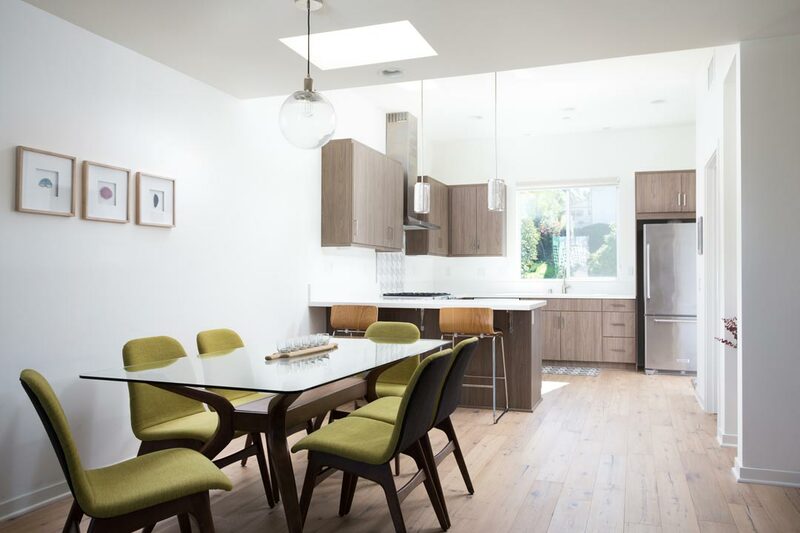 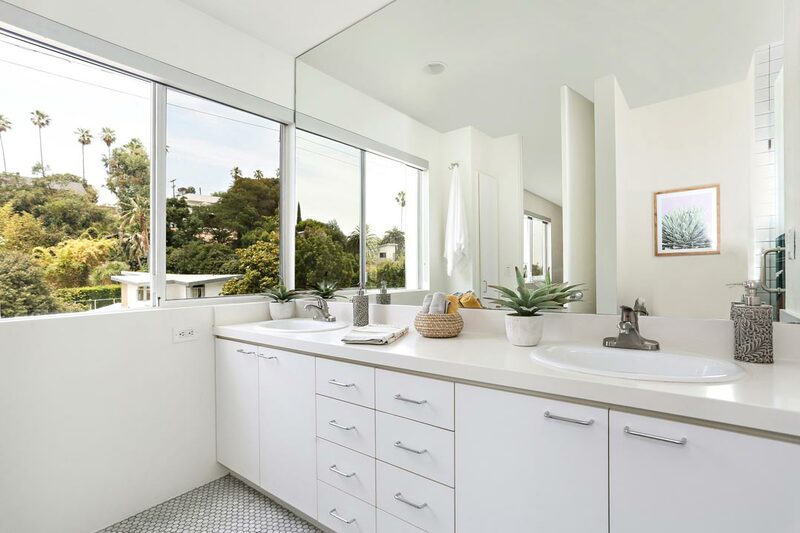 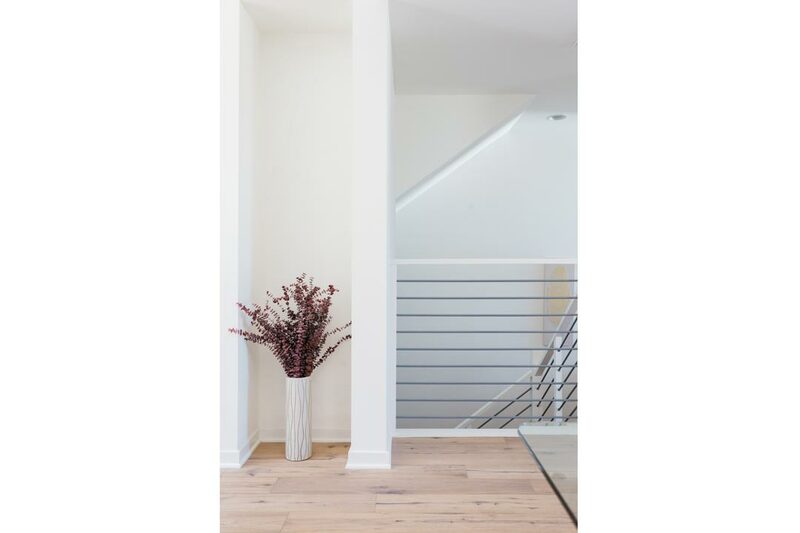 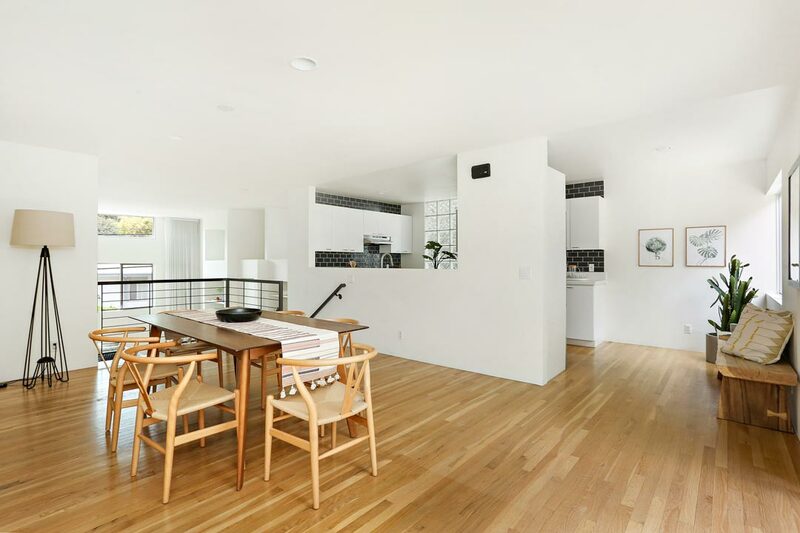 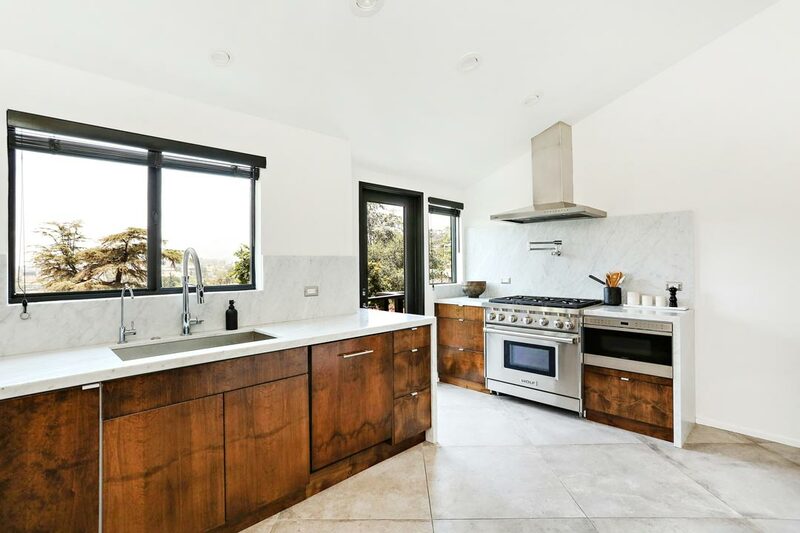 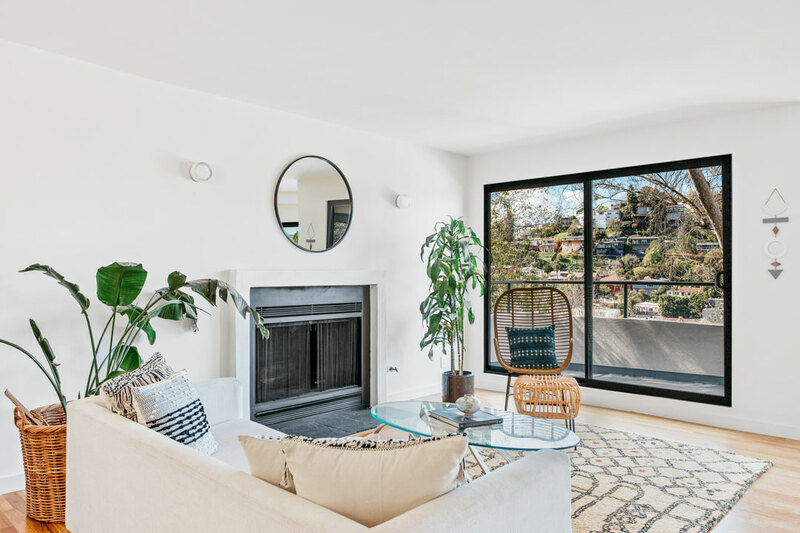 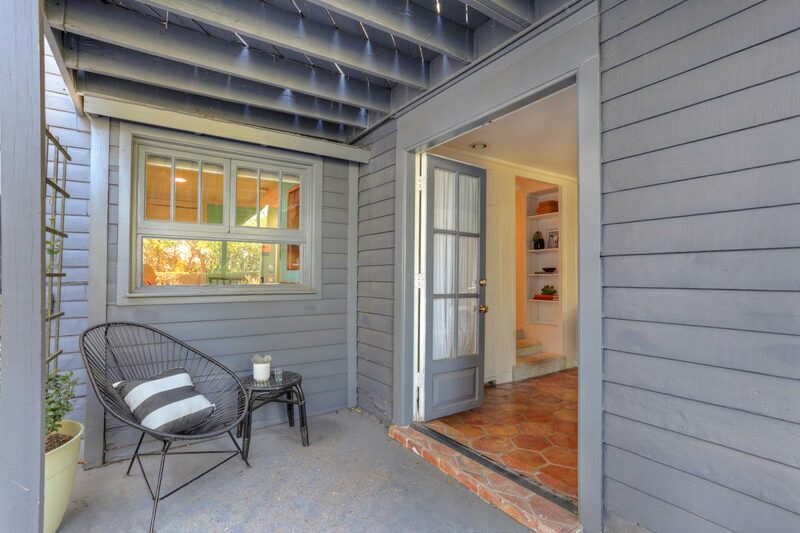 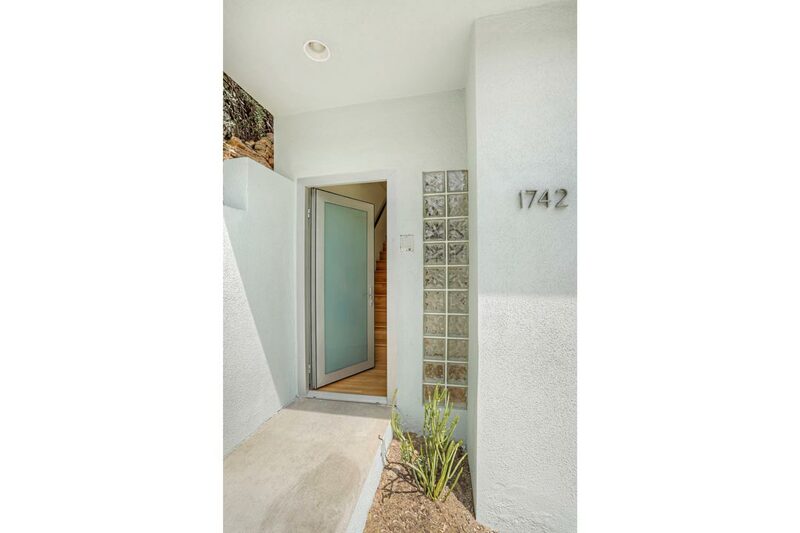 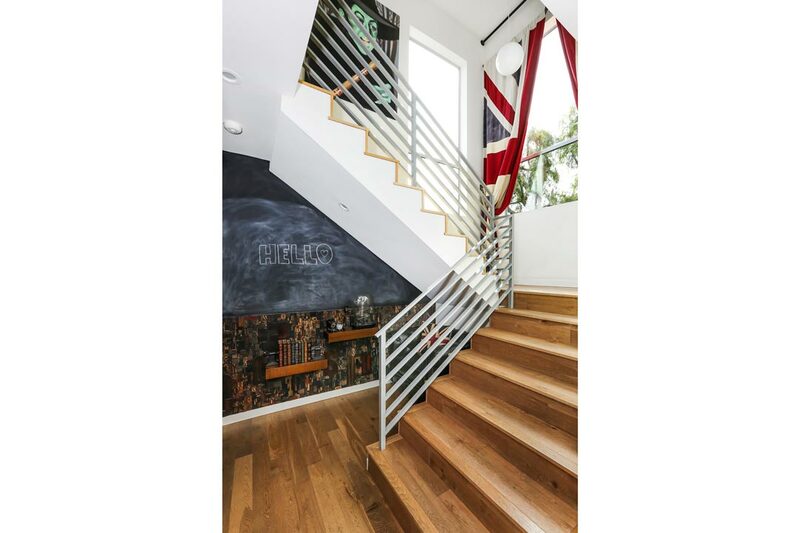 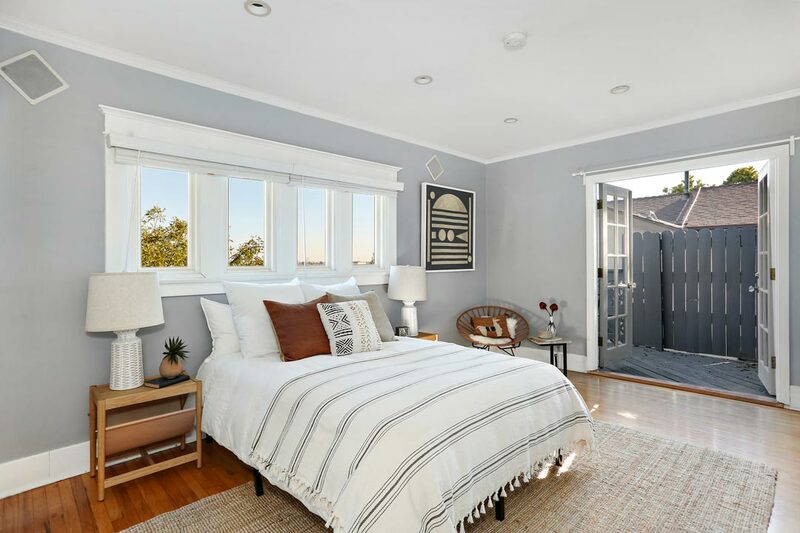 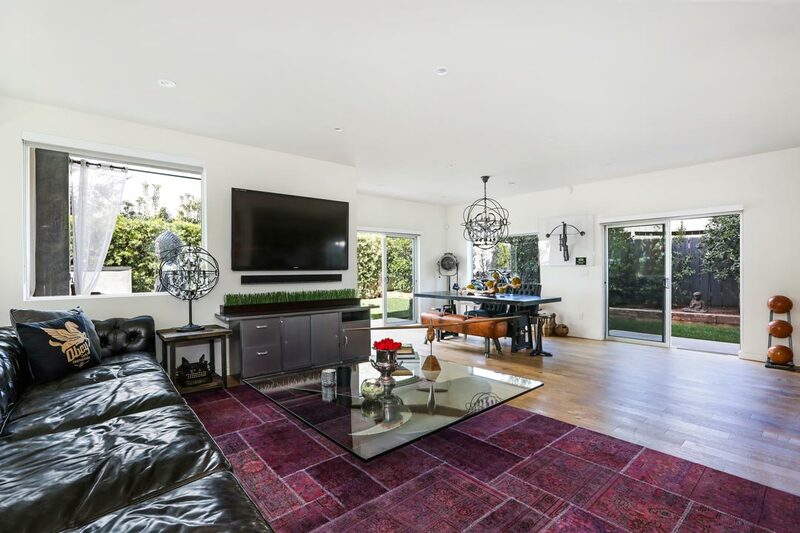 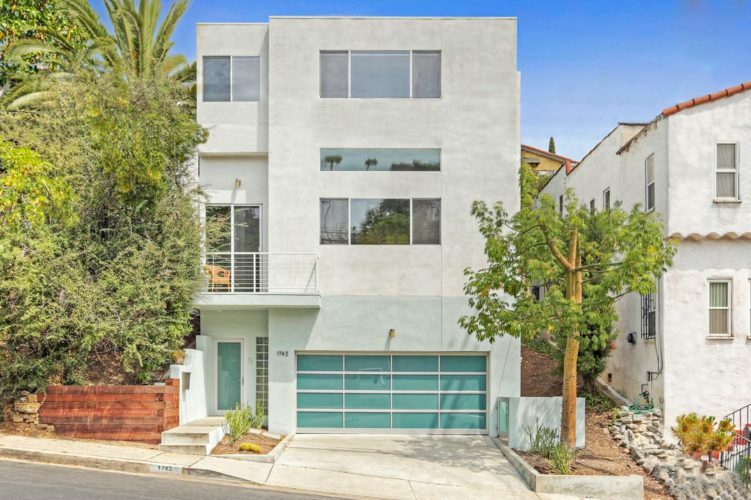 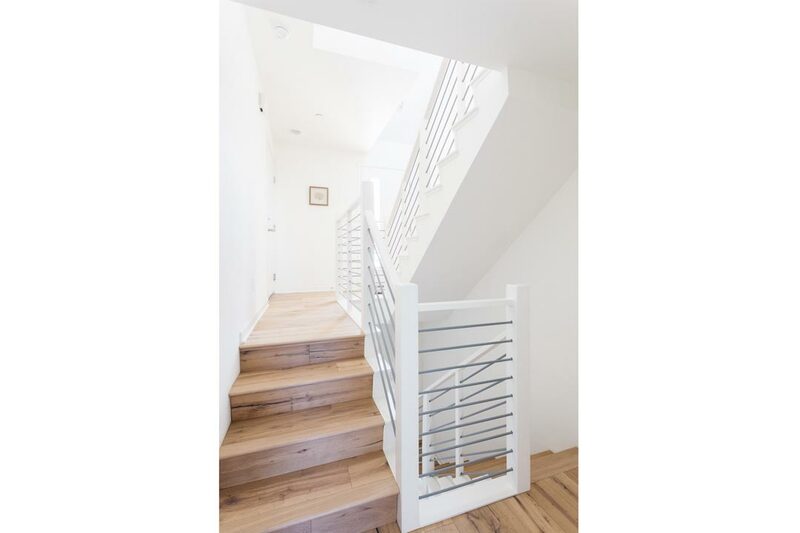 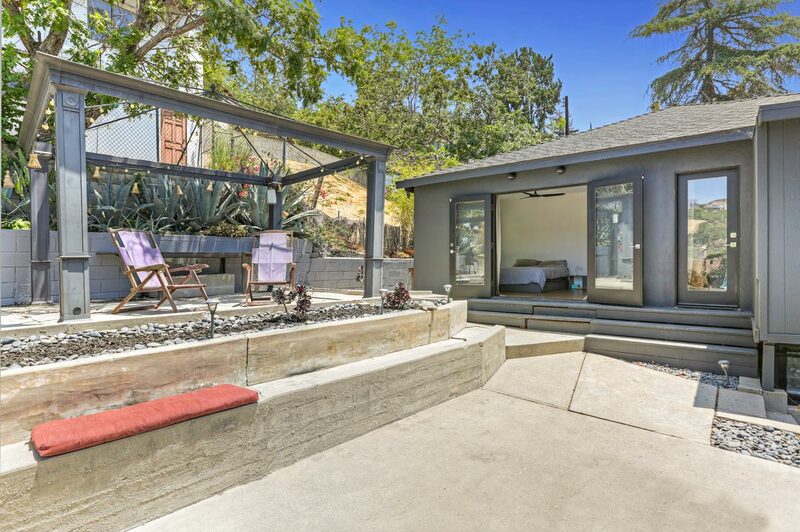 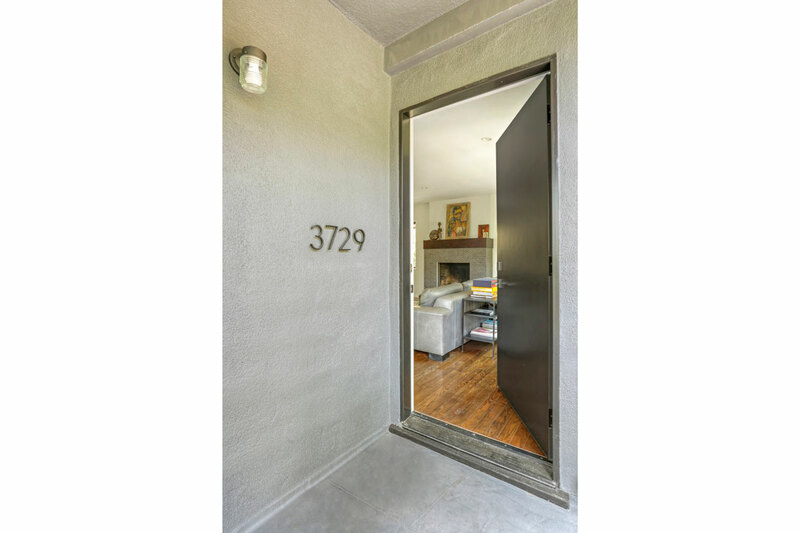 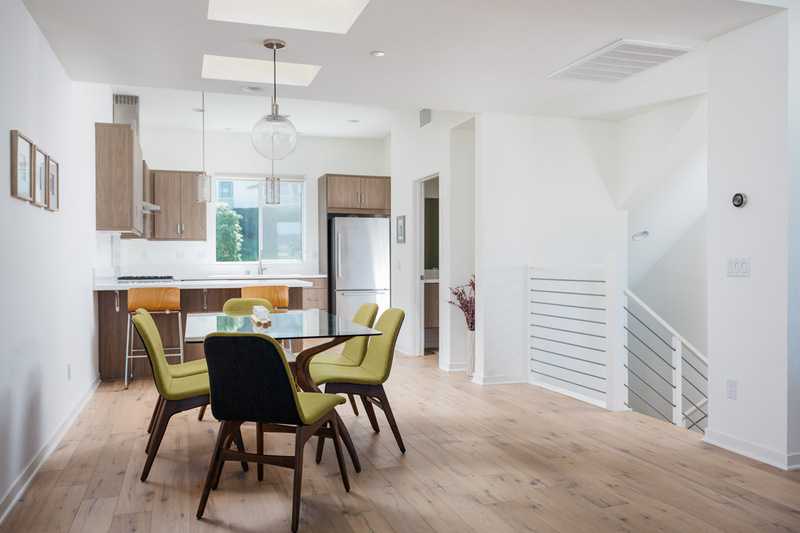 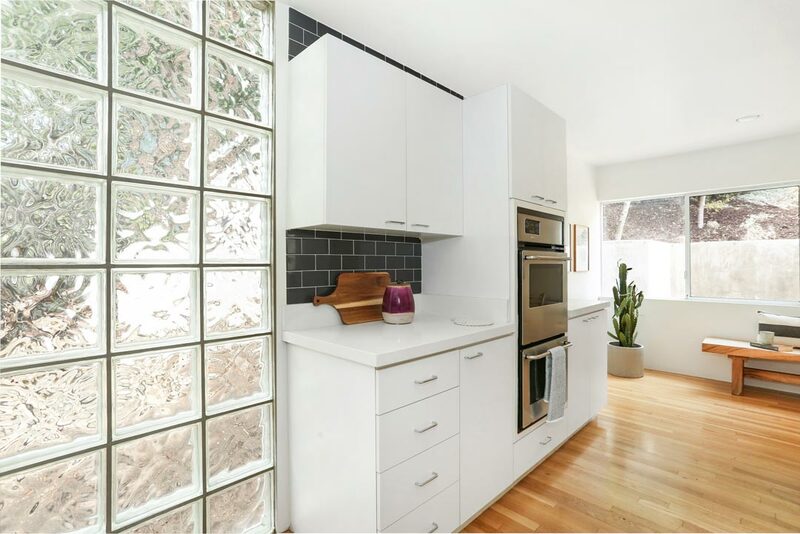 Built in 2016, this spacious three-level home is available for lease in Sunset Junction, the beating heart of Silver Lake. 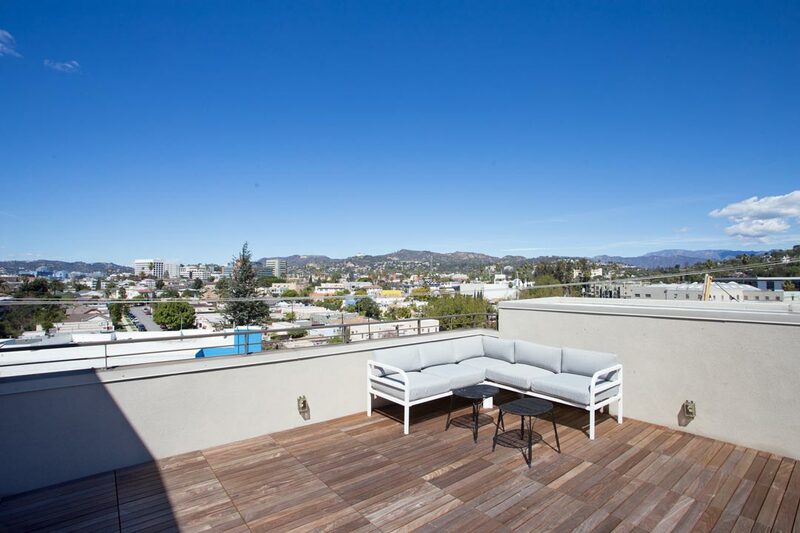 Enjoy seamless city access and panoramic views from the private rooftop deck. 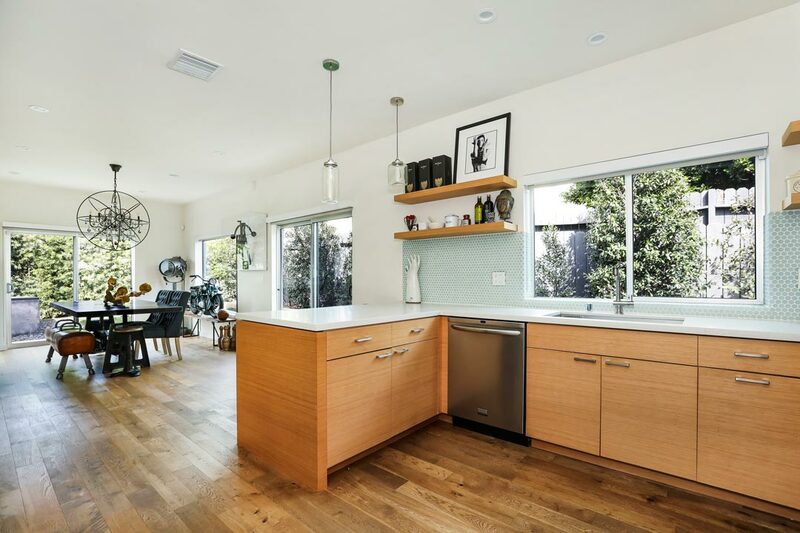 Three levels of light-filled living space culminate in the dramatic great room finished with beautiful oak flooring, and an open kitchen featuring quartz countertops, a custom tile backsplash and stainless appliances by Bosch. 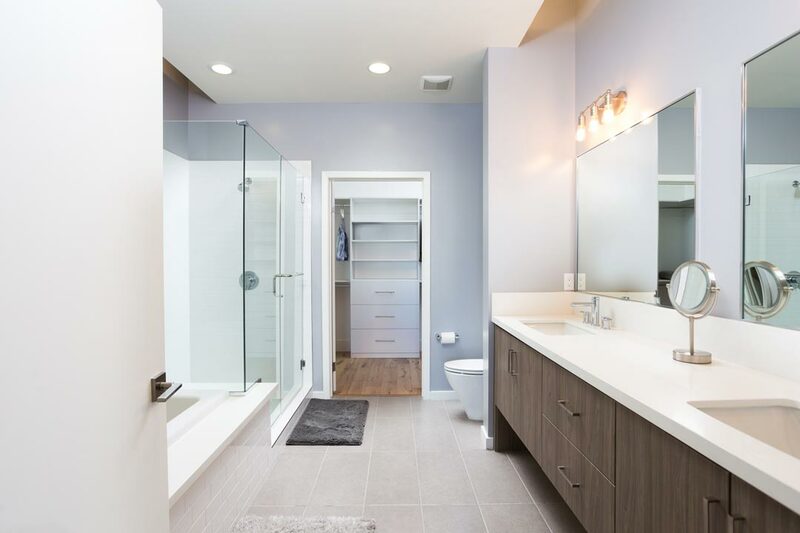 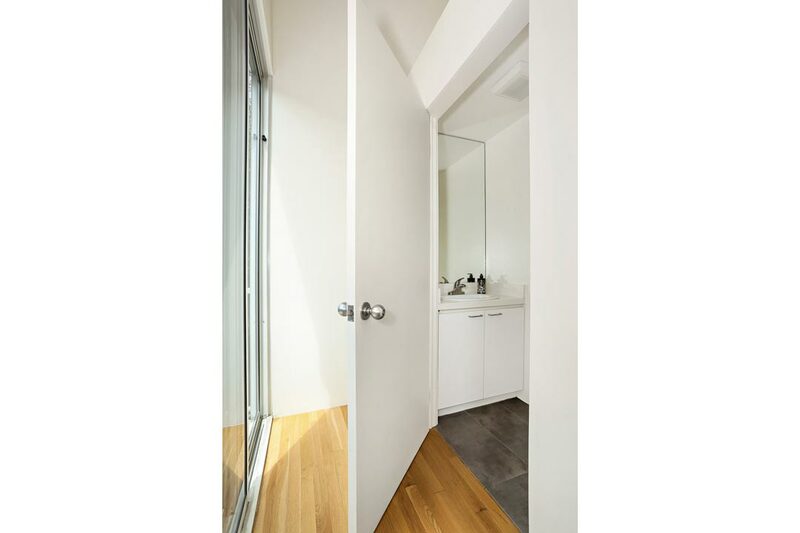 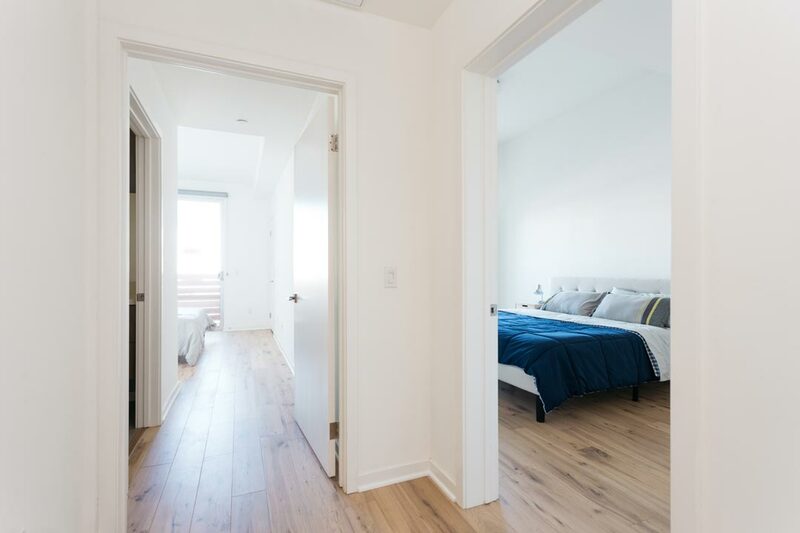 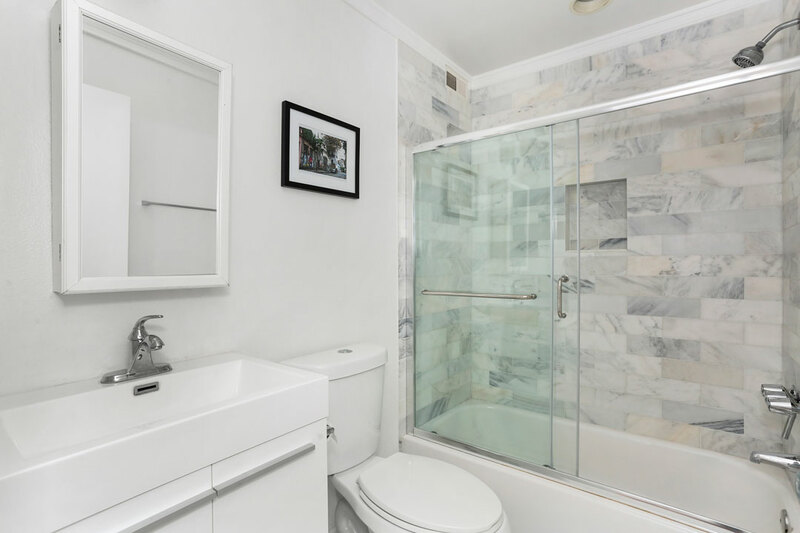 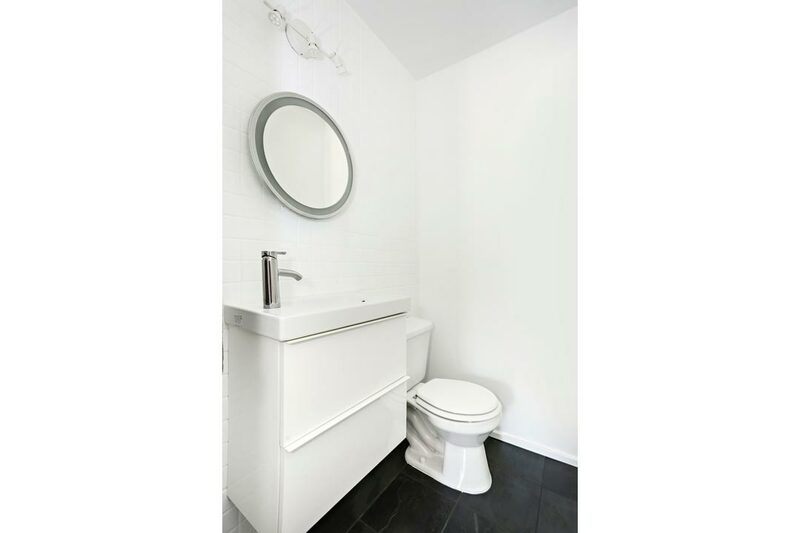 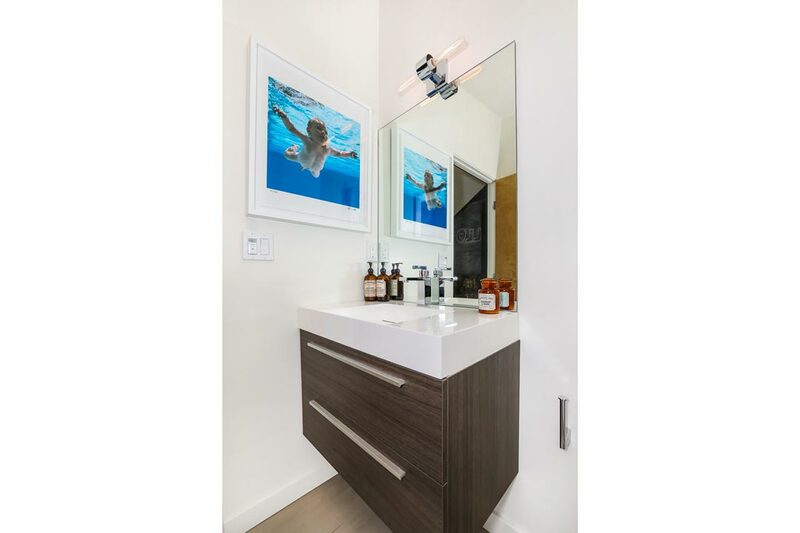 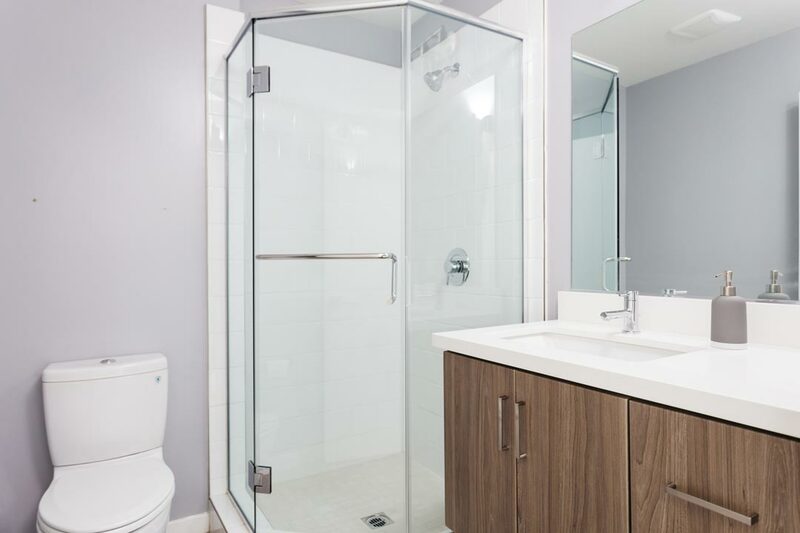 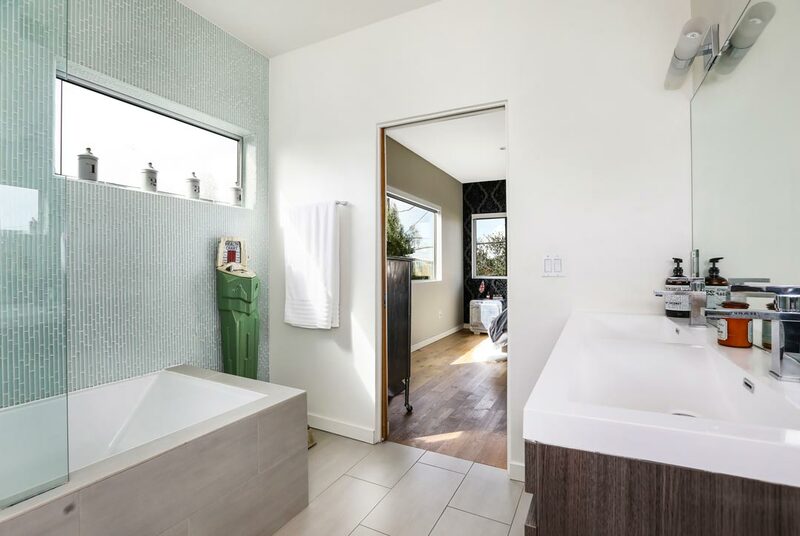 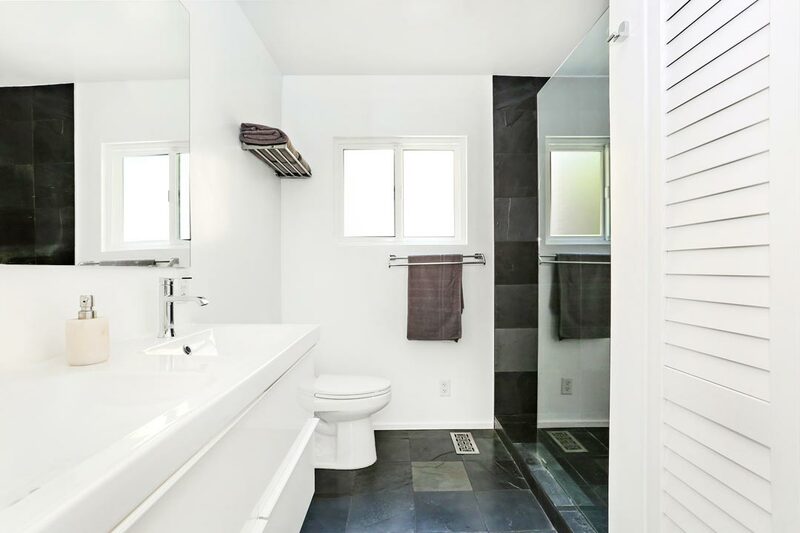 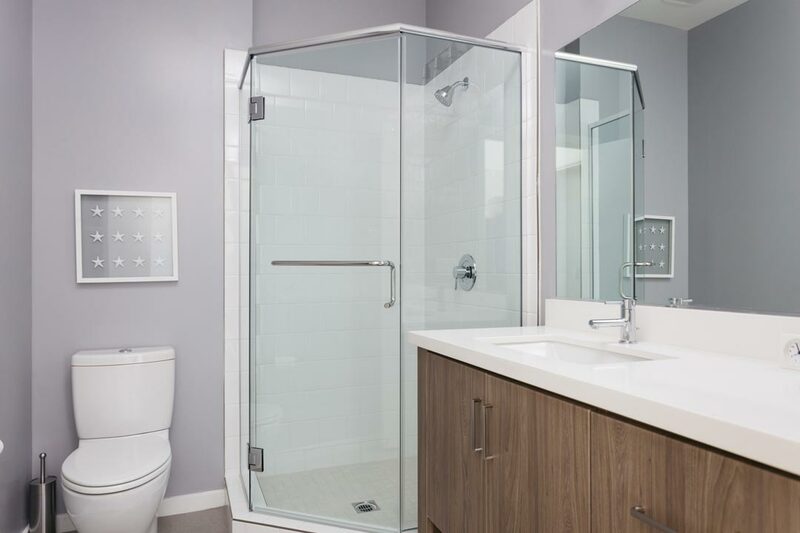 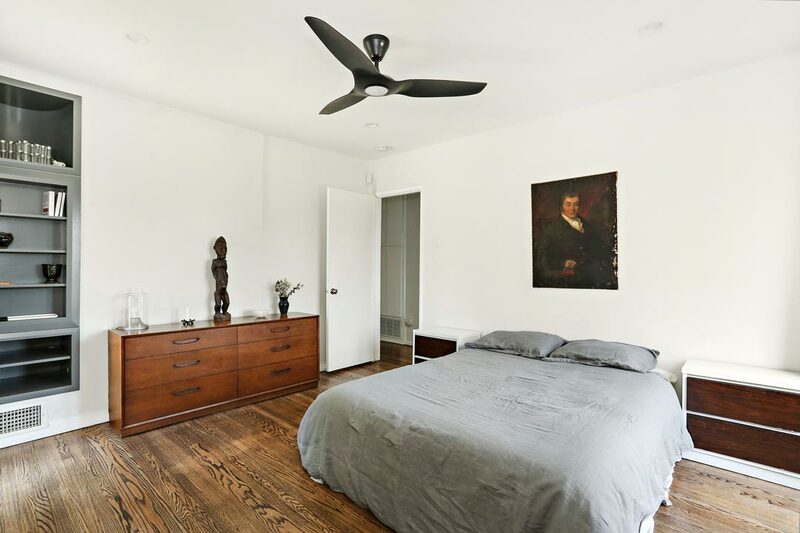 Well-proportioned bedrooms include the Master with attached bathroom featuring dual vanities, separate shower + soaking tub and a walk-in closet. 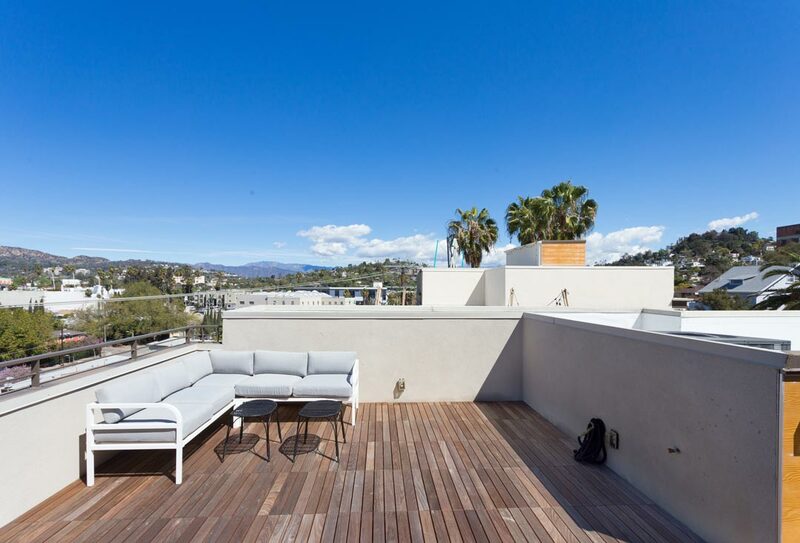 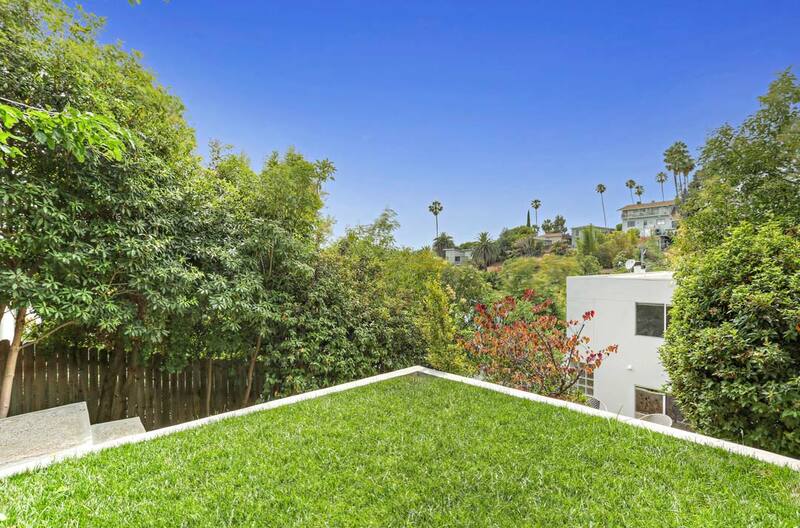 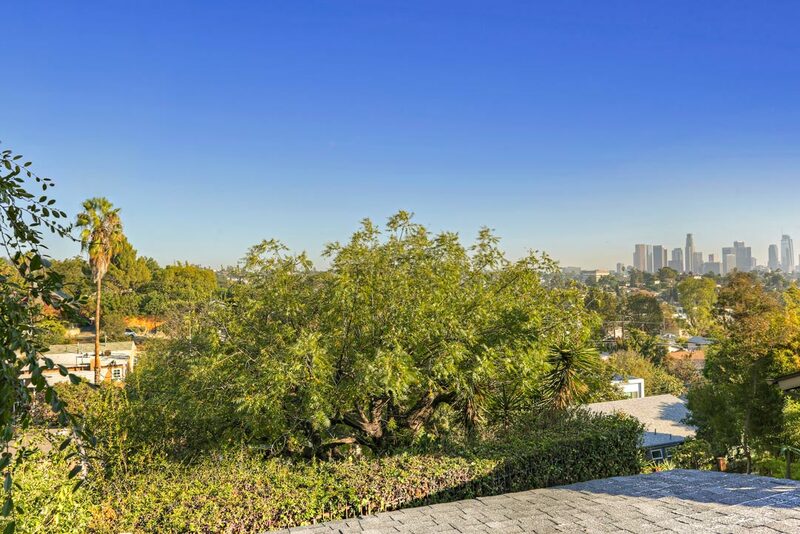 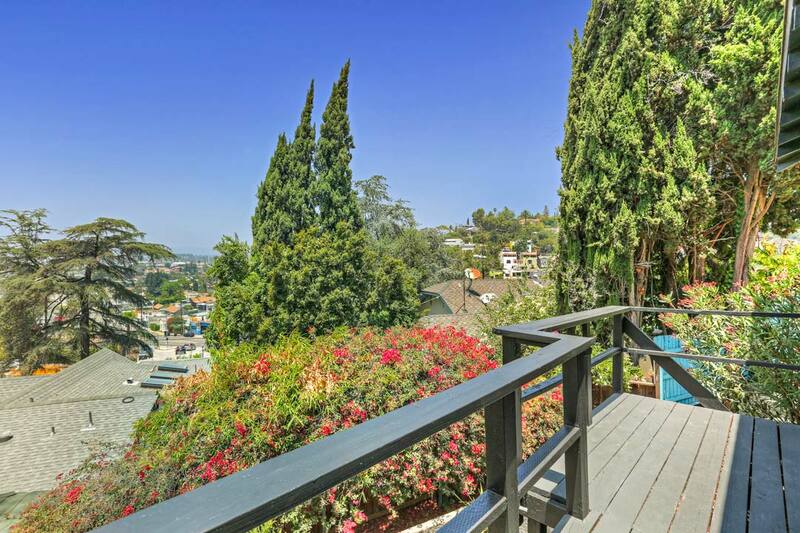 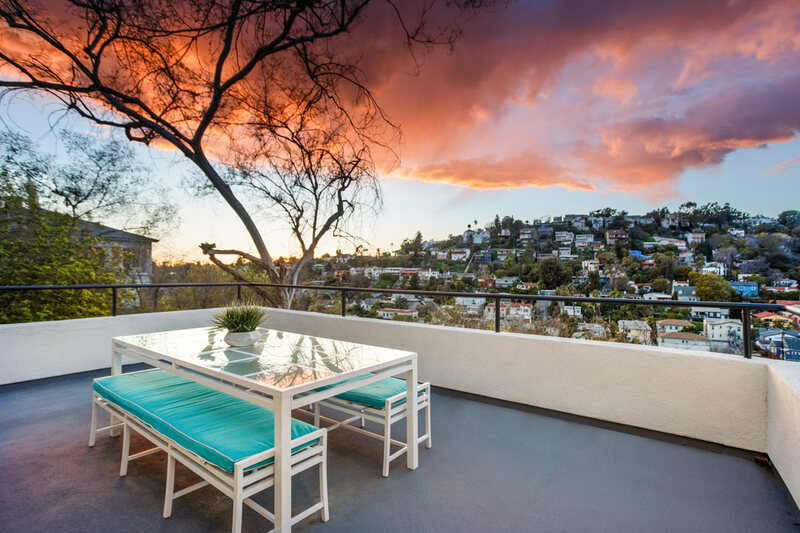 From the rooftop deck find sweeping views of the Hollywood Sign, Griffith Park Observatory and nightly sunsets. 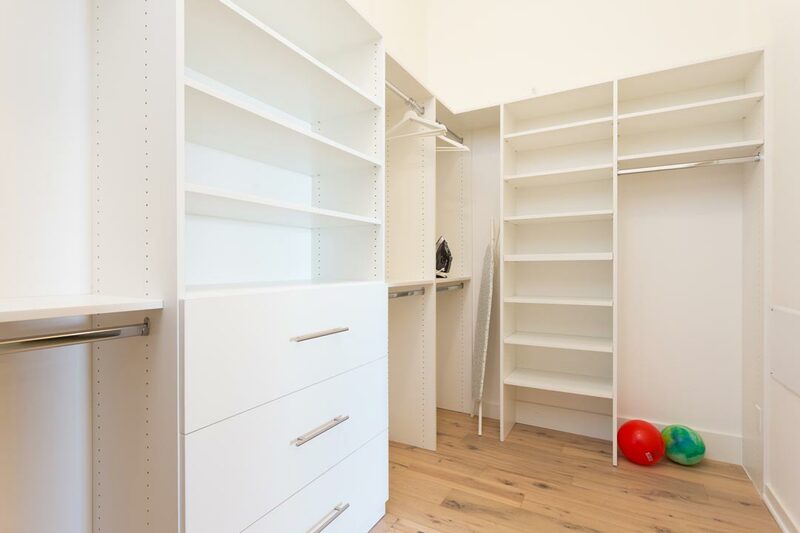 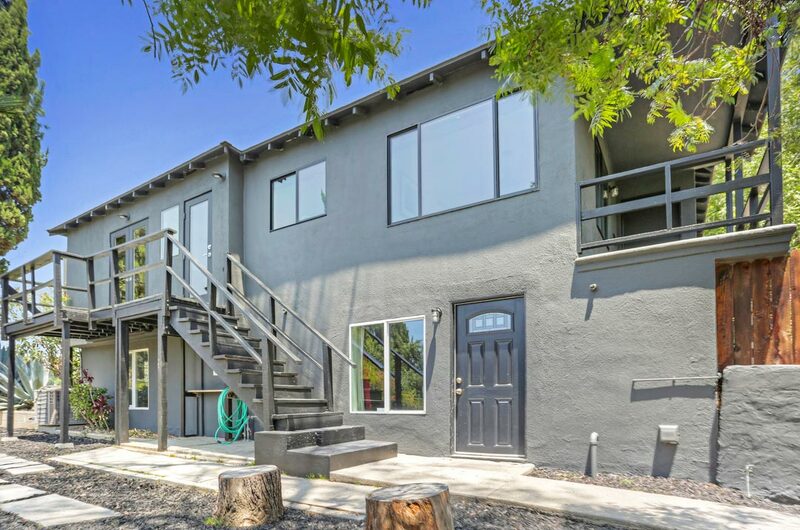 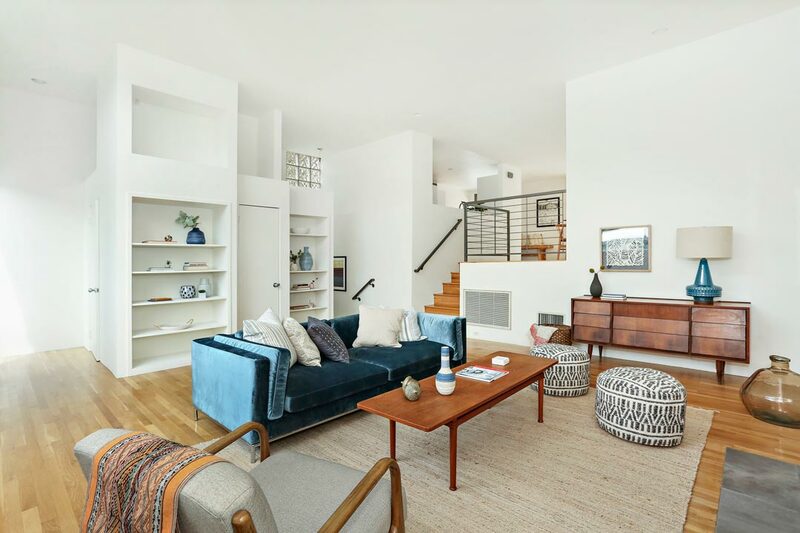 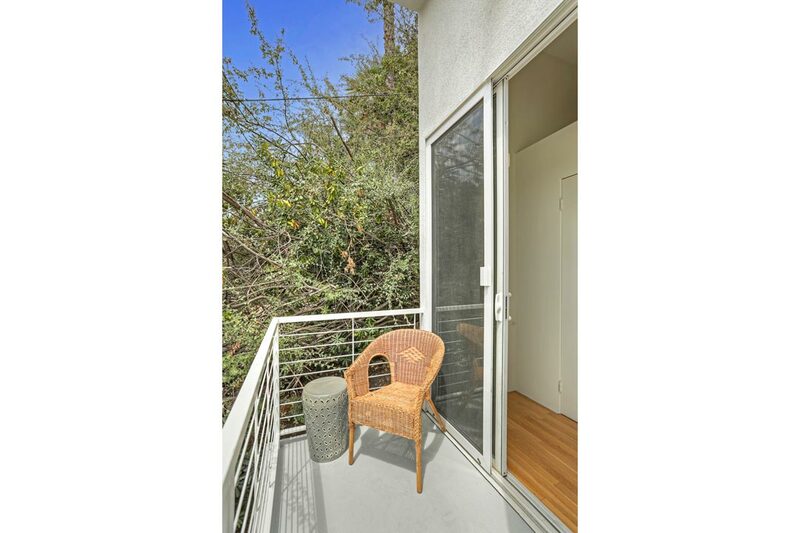 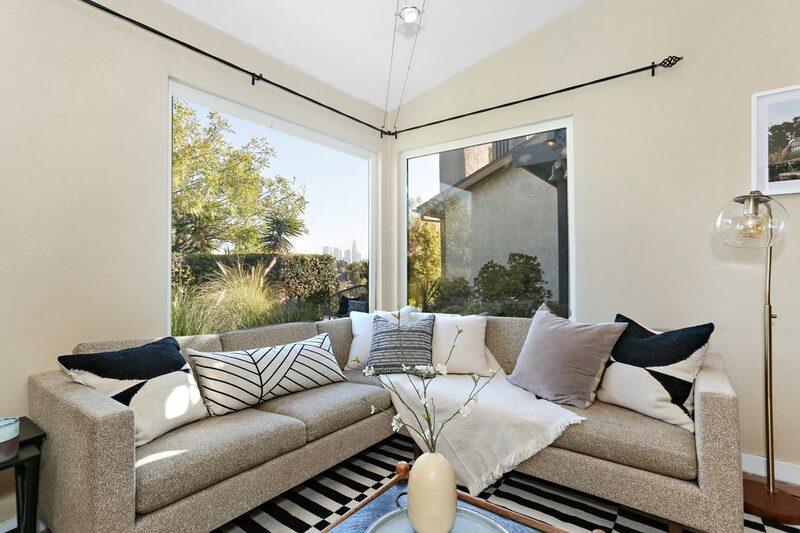 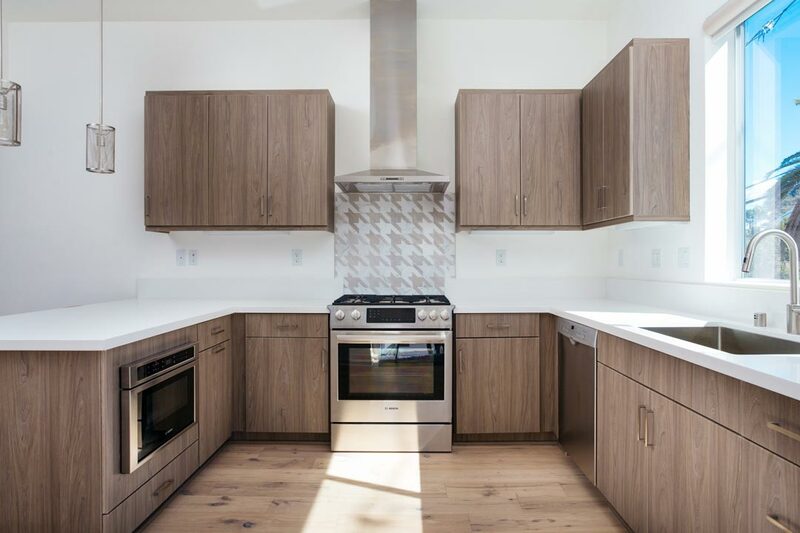 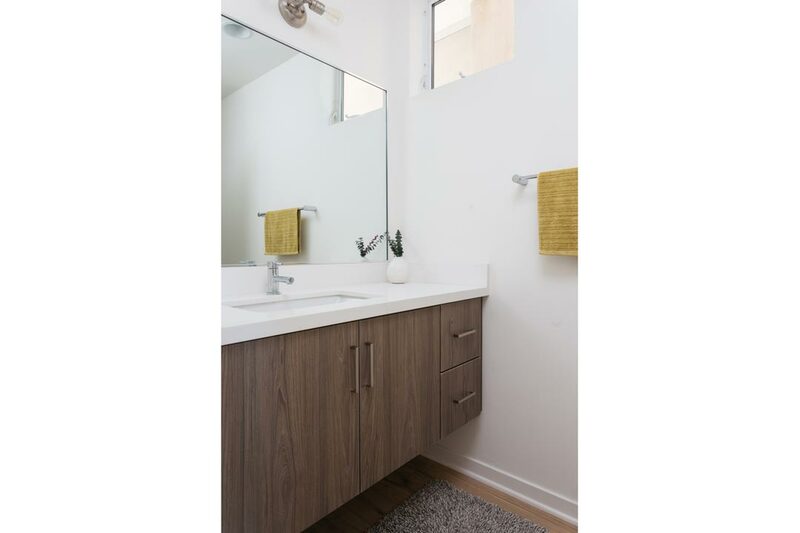 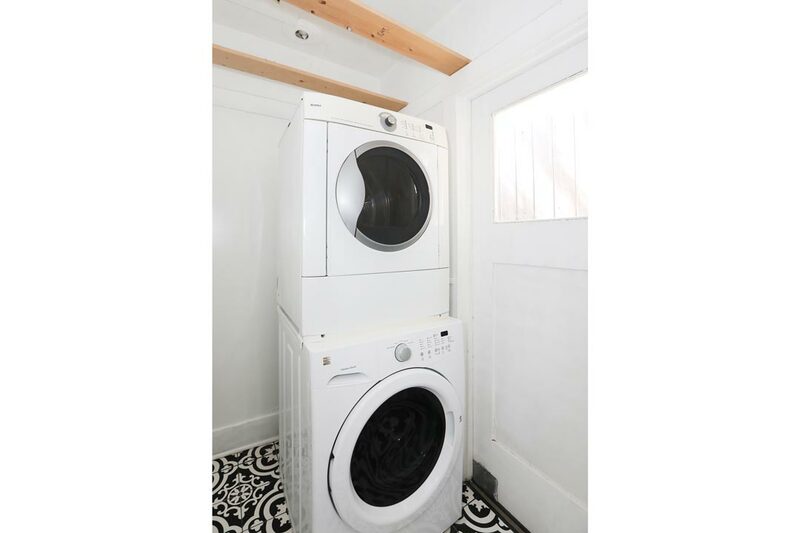 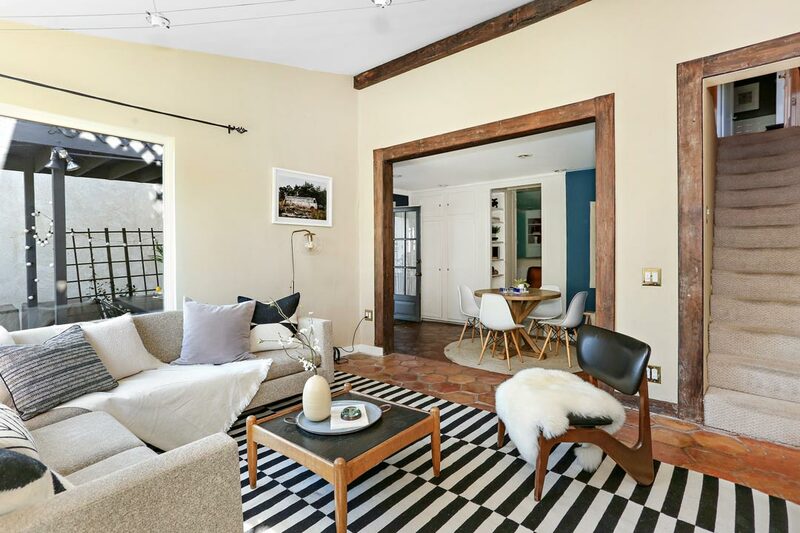 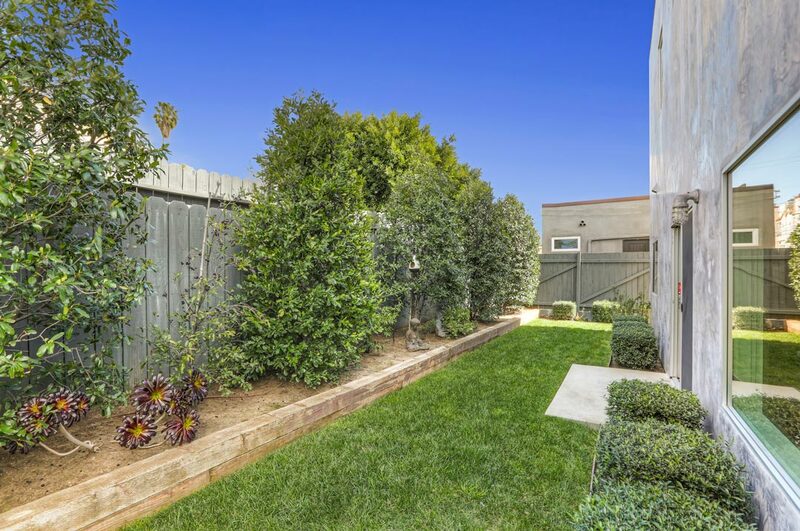 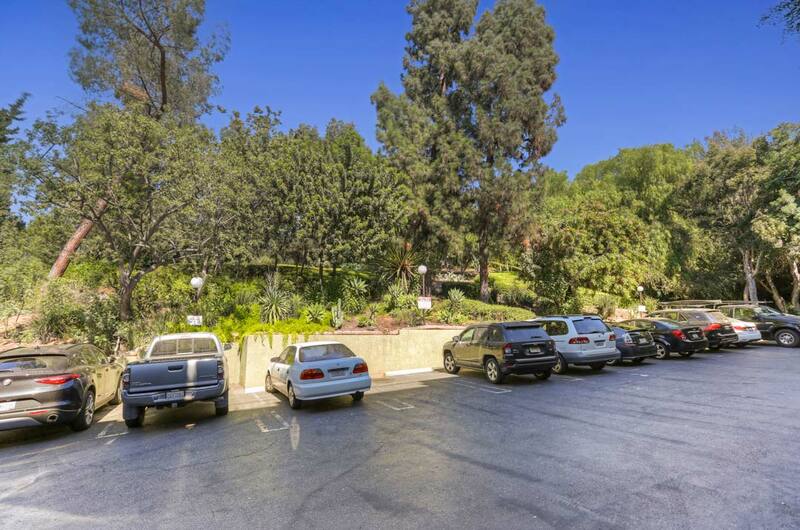 The attached two-car garage provides direct access, or leave your ride at home and take advantage of an amazing location near local hot-spots Intelligentsia, Stella, Forage, Sawyer, The Black Cat and popular twice-weekly Farmer’s Market. 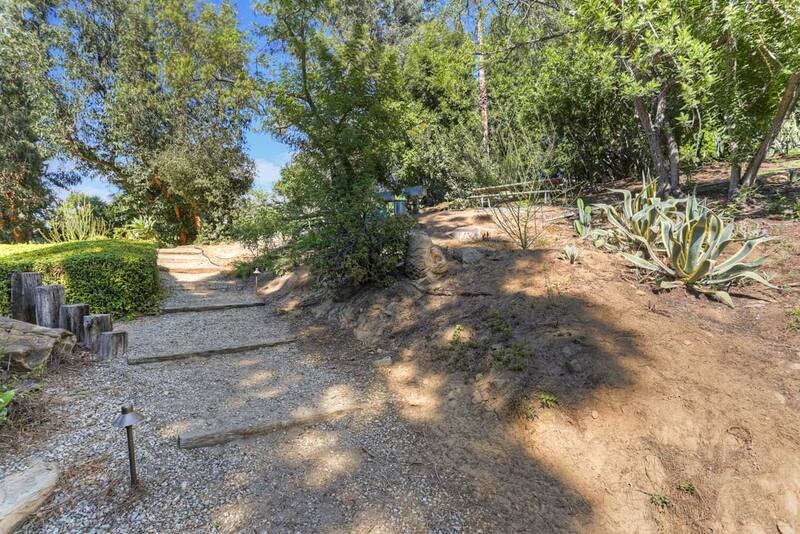 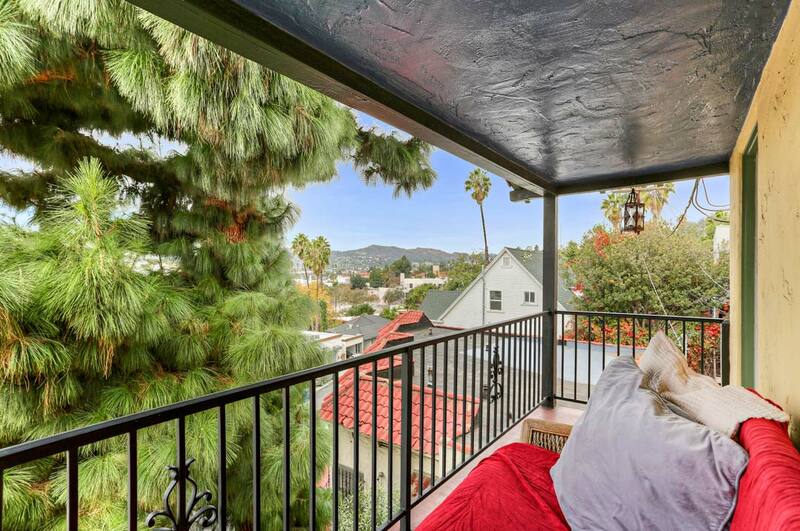 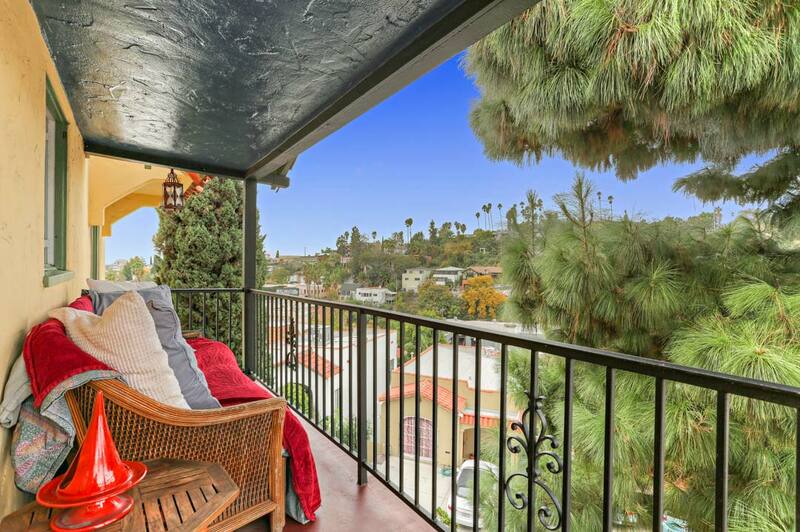 The Silver Lake Reservoir, Echo Park and Downtown LA are within easy reach. 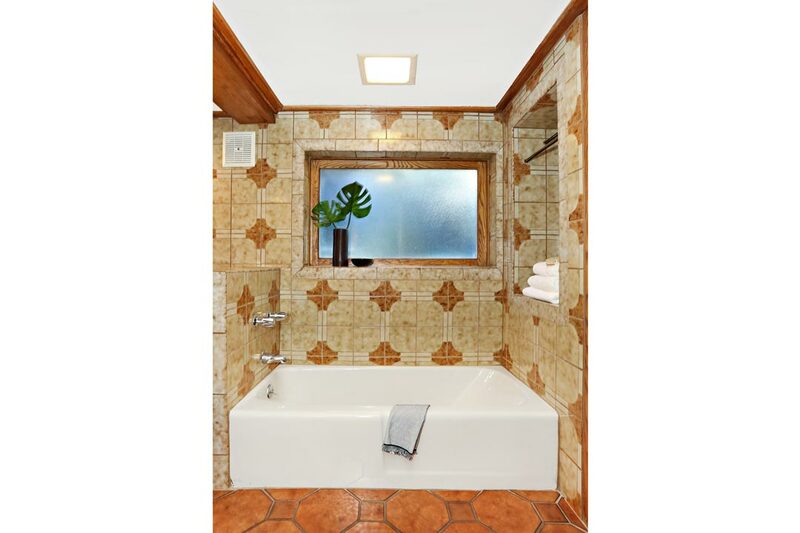 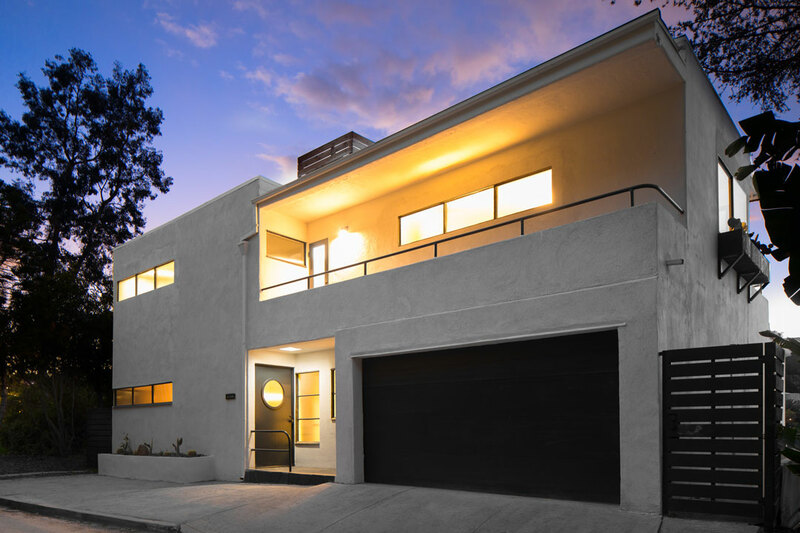 The sexiest house in Silver Lake, The Hunter Residence, is a remarkable example of the Moderne style. 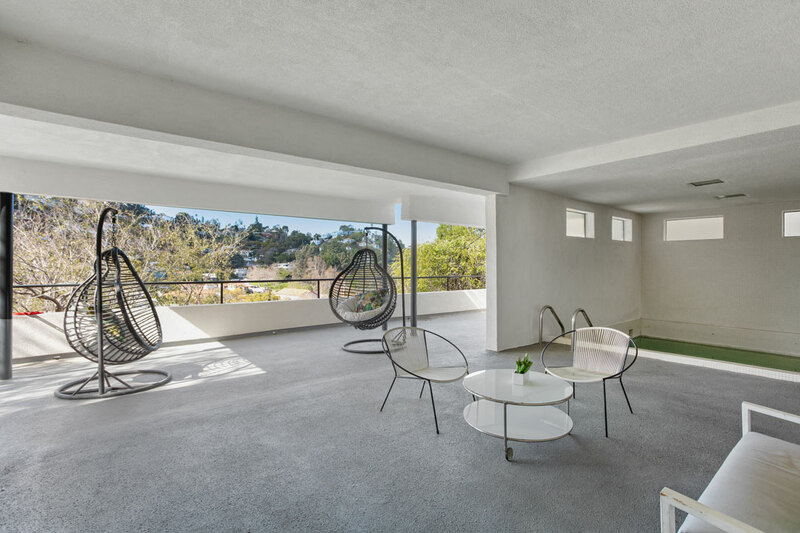 Designed by renown architect William Kesling in 1936, this exquisite home represents an important early example of modernist residential architecture in Southern California, and has been artfully renovated for the 21st century. 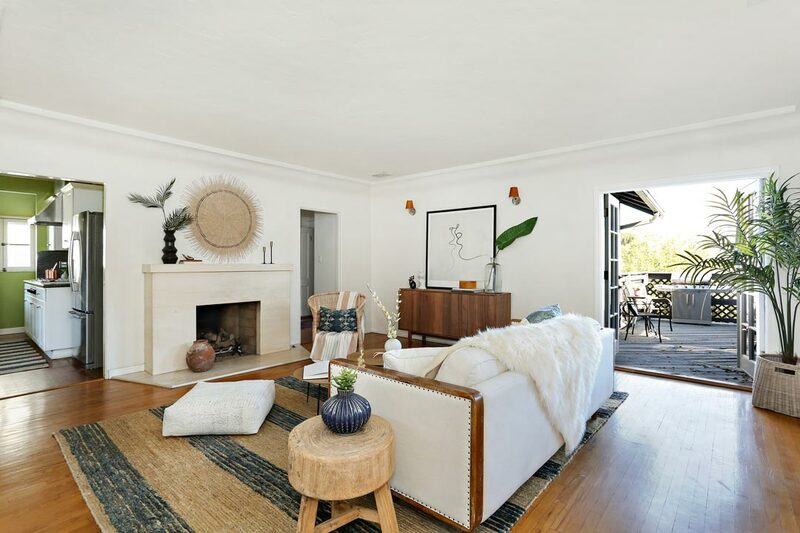 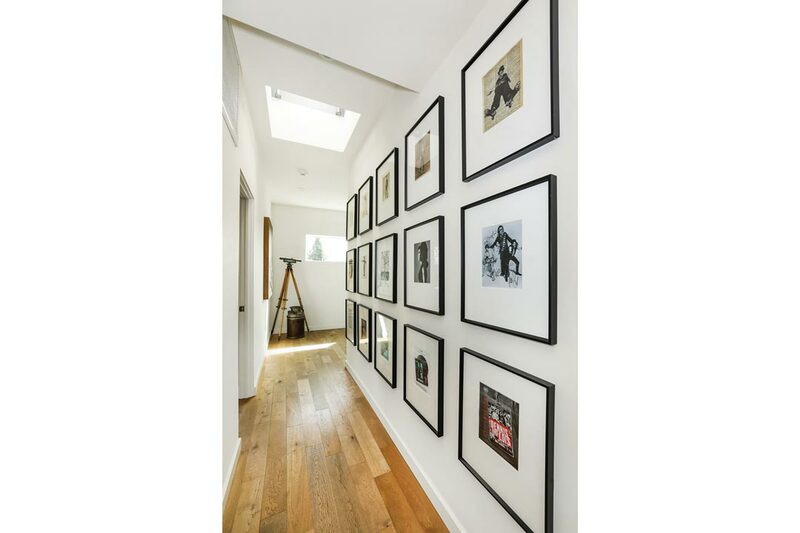 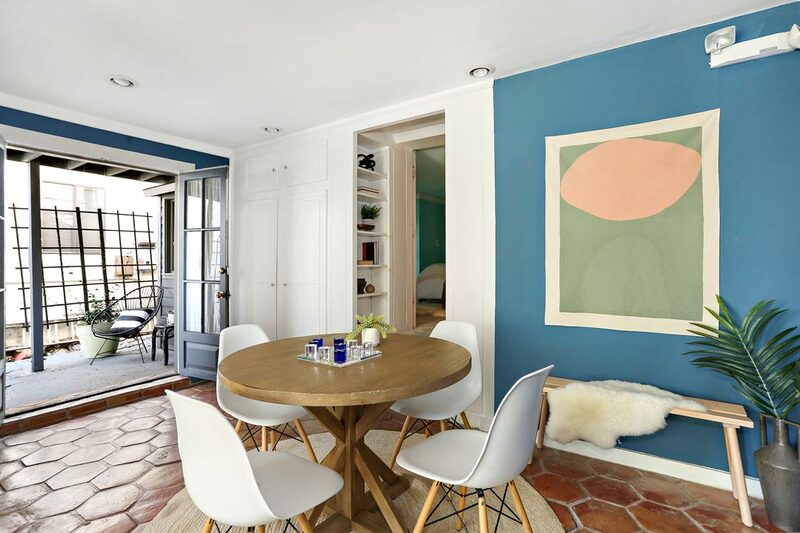 The home was the longtime residence of 20th century philanthropists and socialites Nadia and Norman Kaplan, celebrated members of the Silver Lake community and founders of “Wayfinder,” a non-profit foundation. 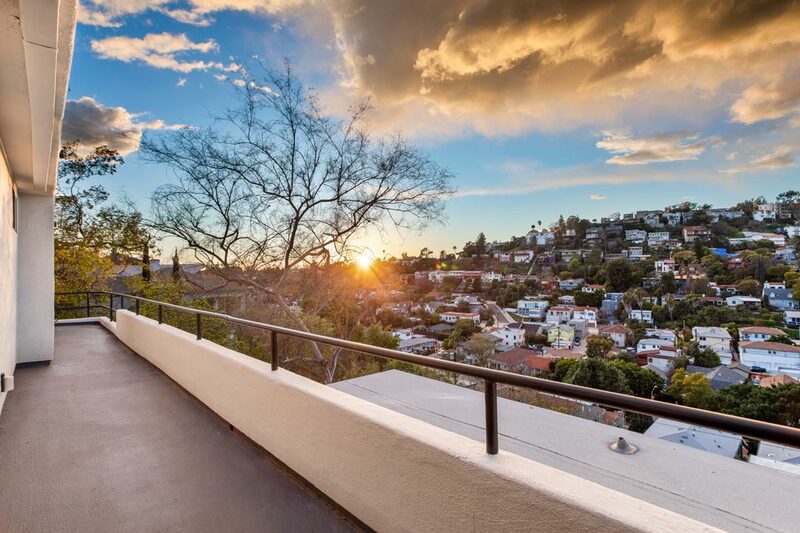 Set on a large and verdant hillside lot, the home presents an elegant and striking facade with long horizontal lines reminiscent of the steamship — a hallmark symbol of the glamorous Art Deco style and a 1930’s emblem of progress and modernity. 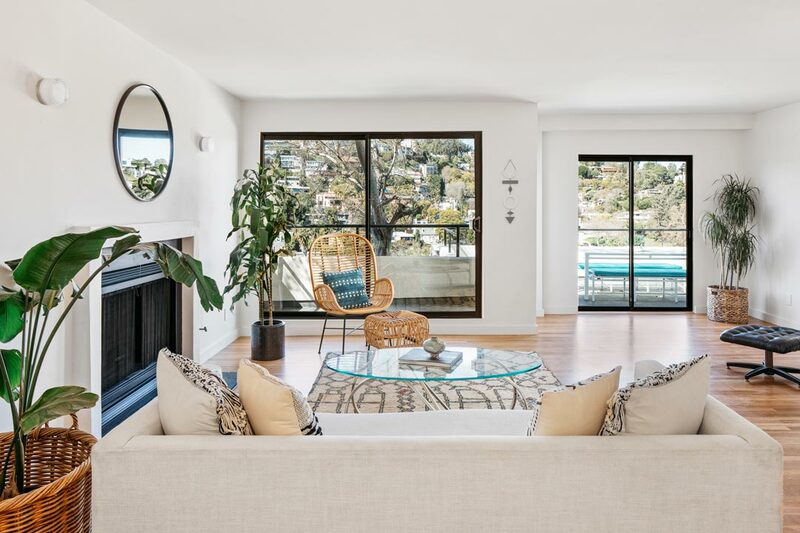 An expansive living room is beautifully detailed with a geometric hearth, a row of street-facing textured glass windows that soften the sunlight, and sliding glass doors that open to the viewing deck, revealing a splendid panorama of the Silver Lake hills. 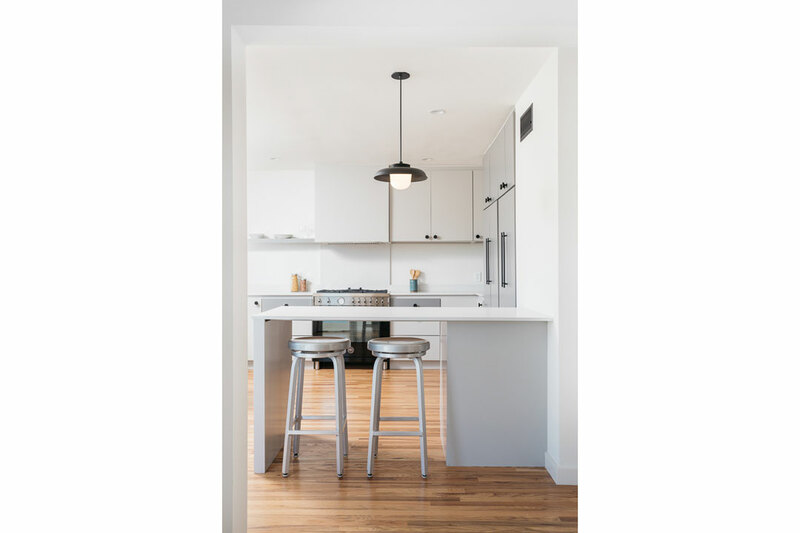 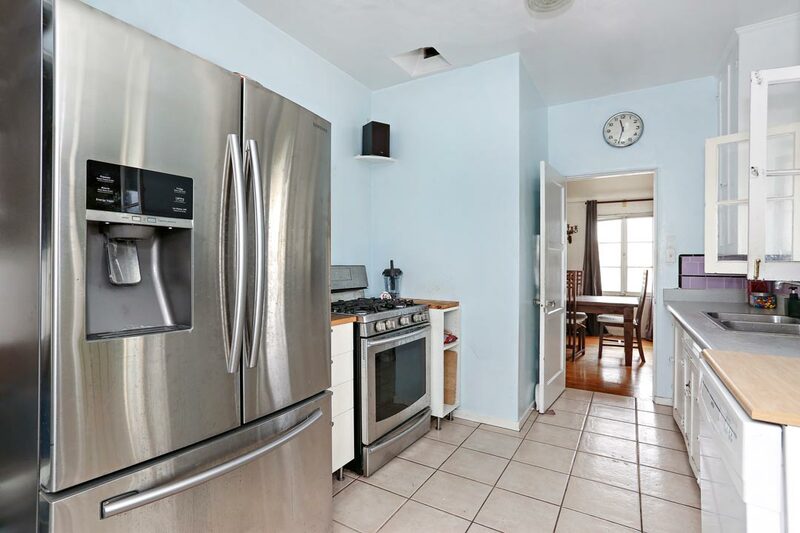 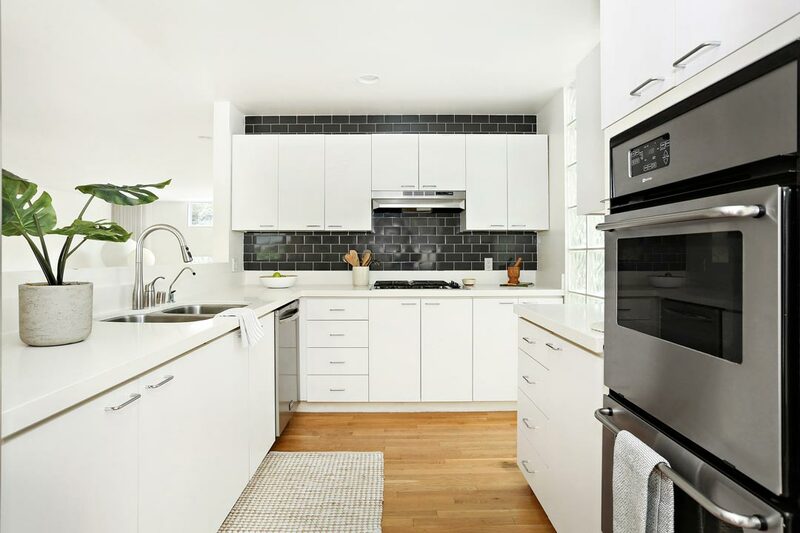 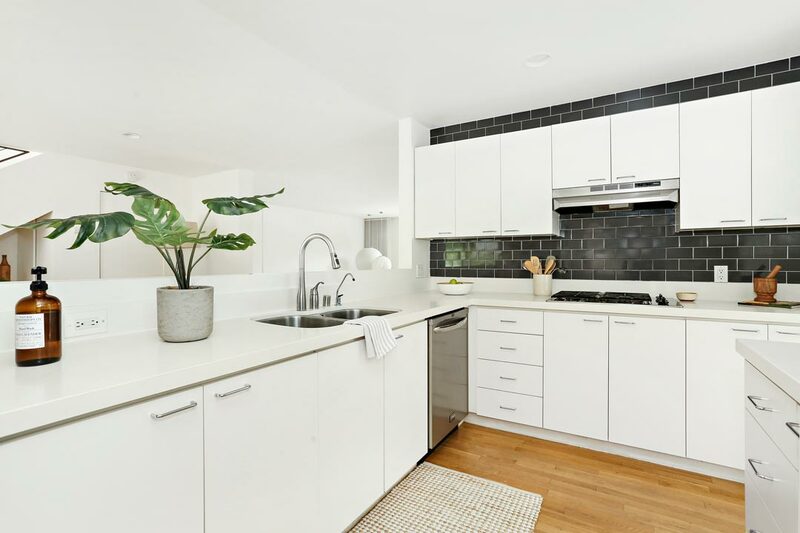 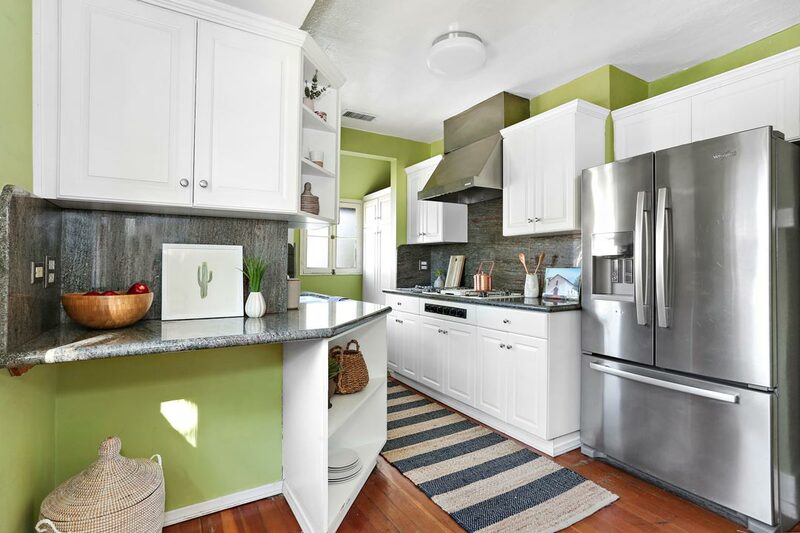 The spacious kitchen has been entirely remodeled and updated with stylish cabinetry and all-new appliances, creating a sophisticated atmosphere that harmonizes with this architecturally significant home. 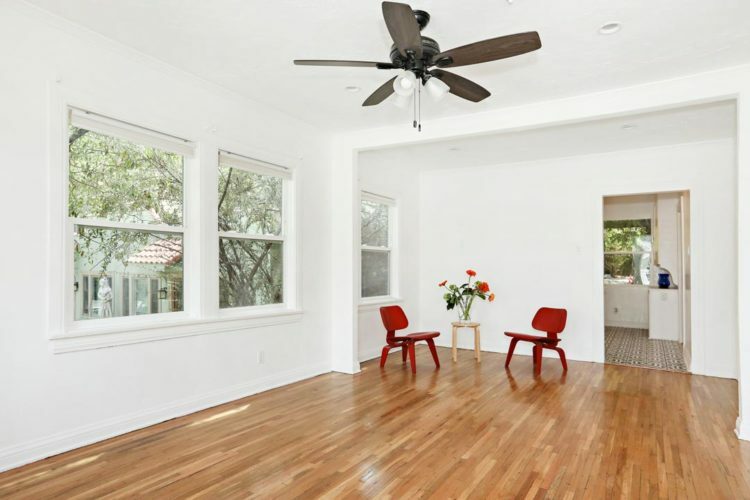 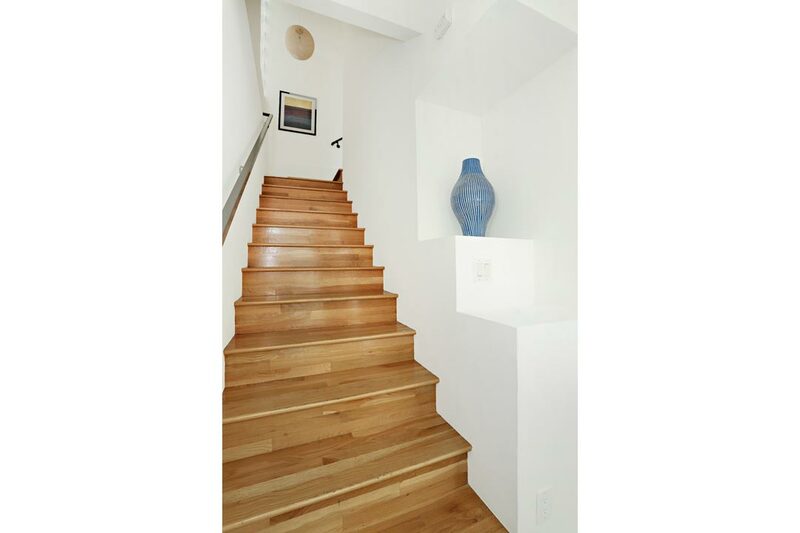 Gorgeous hardwood floors flow throughout; system improvements include lighting, electrical upgrades, and more. 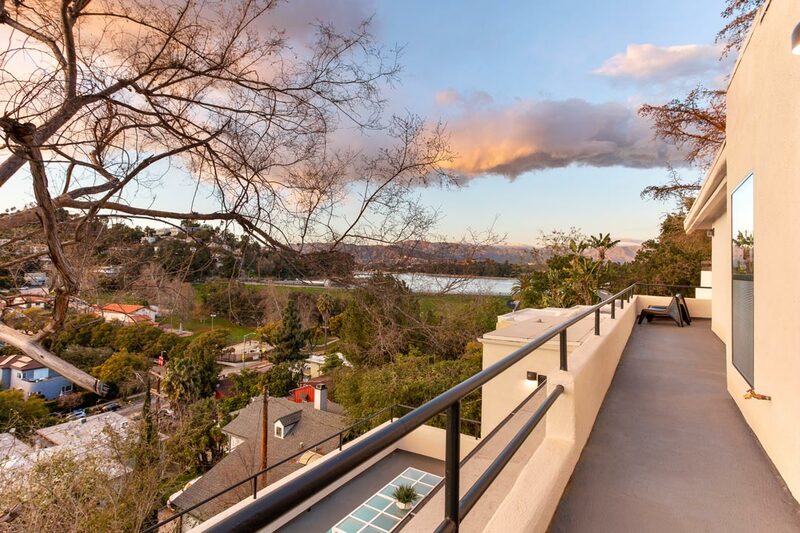 A curving staircase transports you upstairs where two ensuite bedrooms await, each with deck access and abundant light; the Master enjoys brilliant views of the Silver Lake Reservoir. 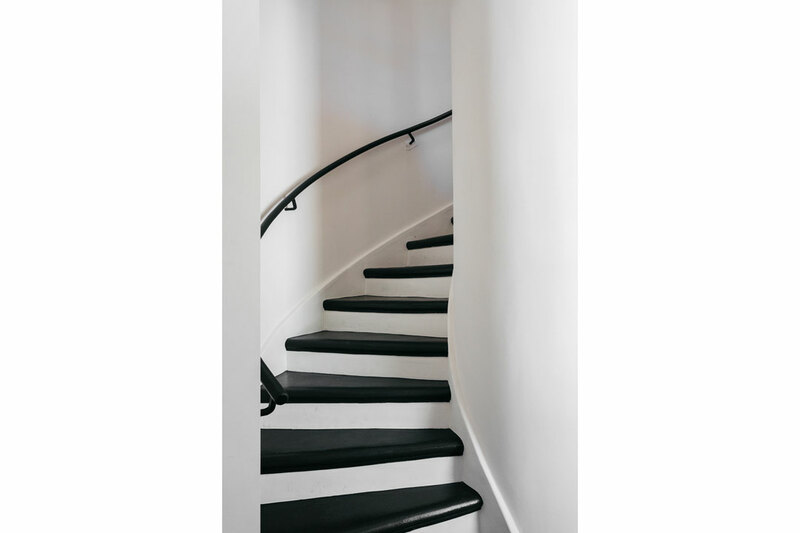 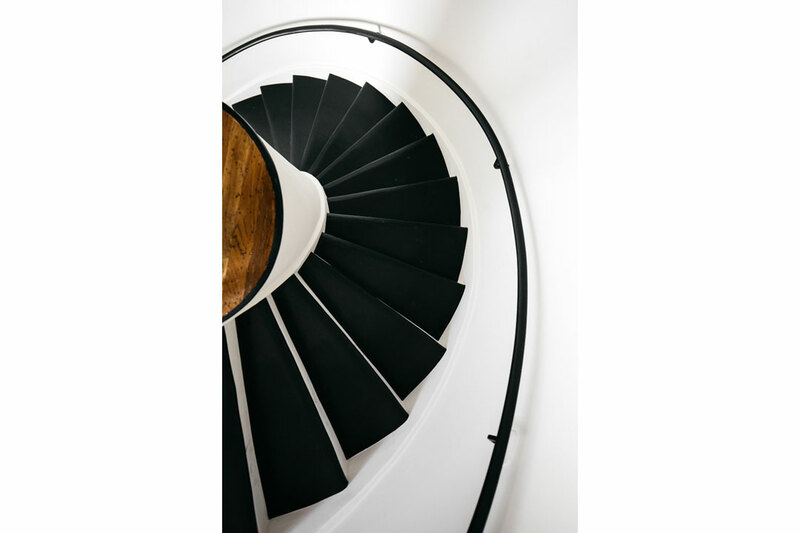 A sequence of rounded walls, iconic elements of the Streamline style, usher you toward the second bedroom. 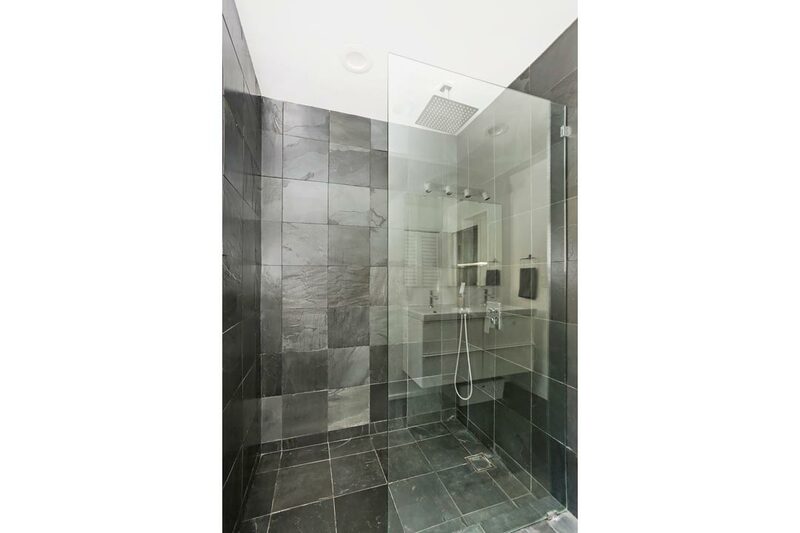 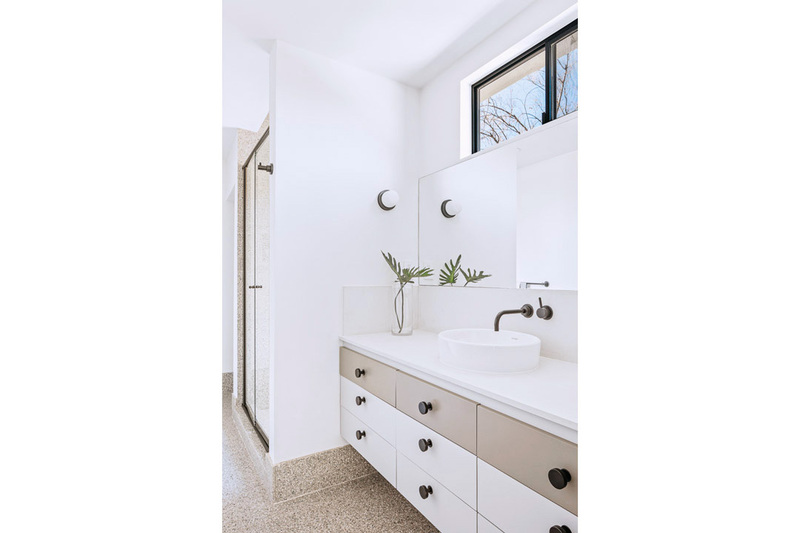 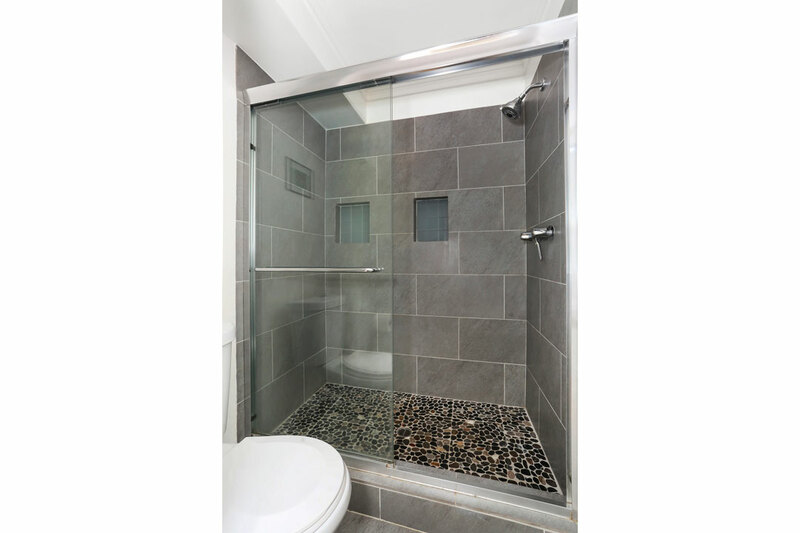 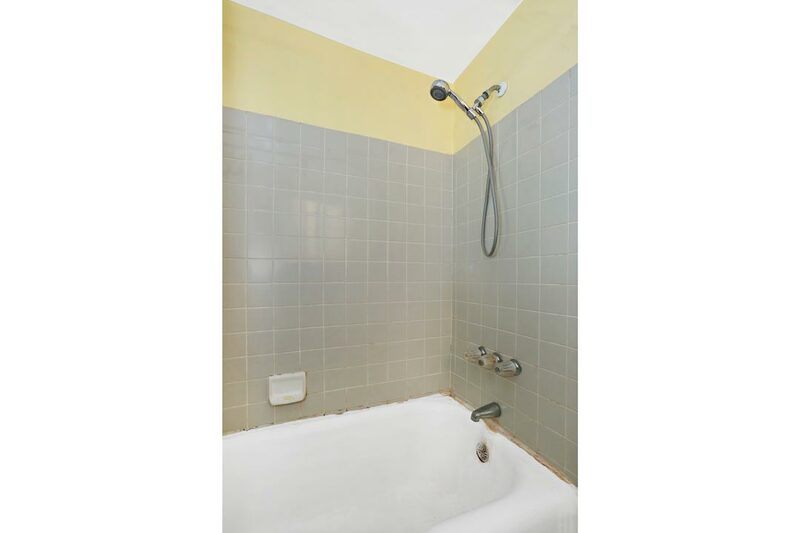 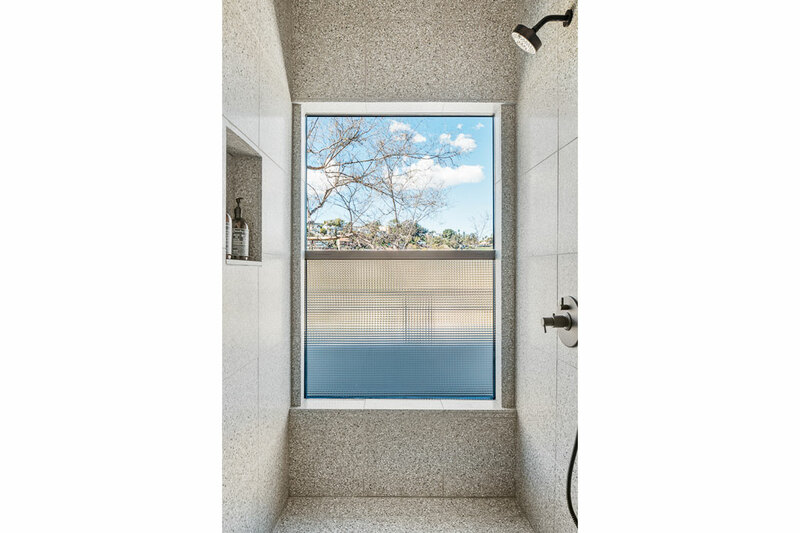 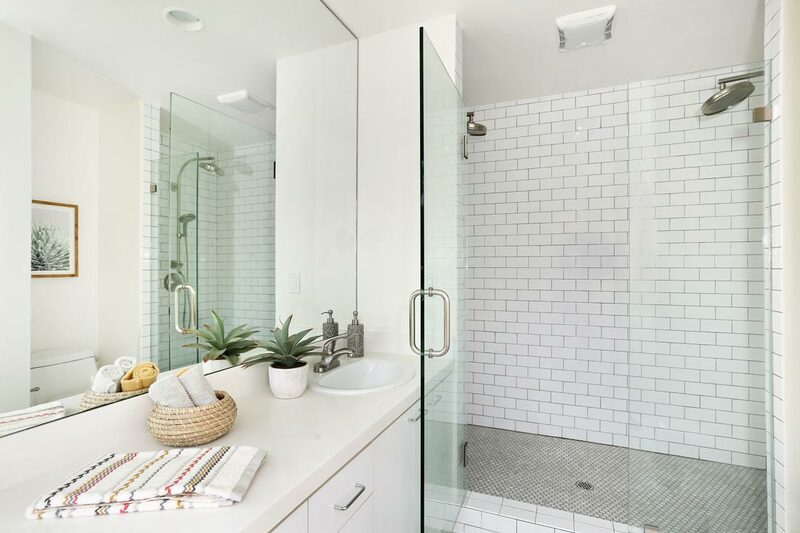 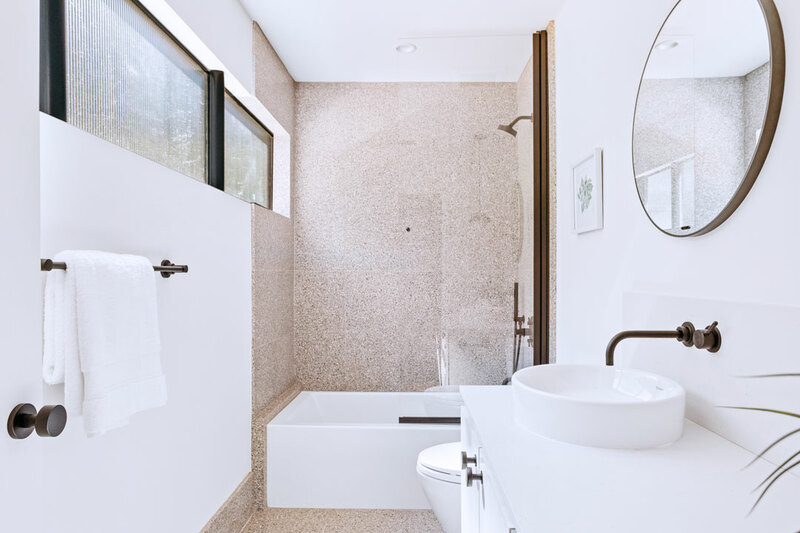 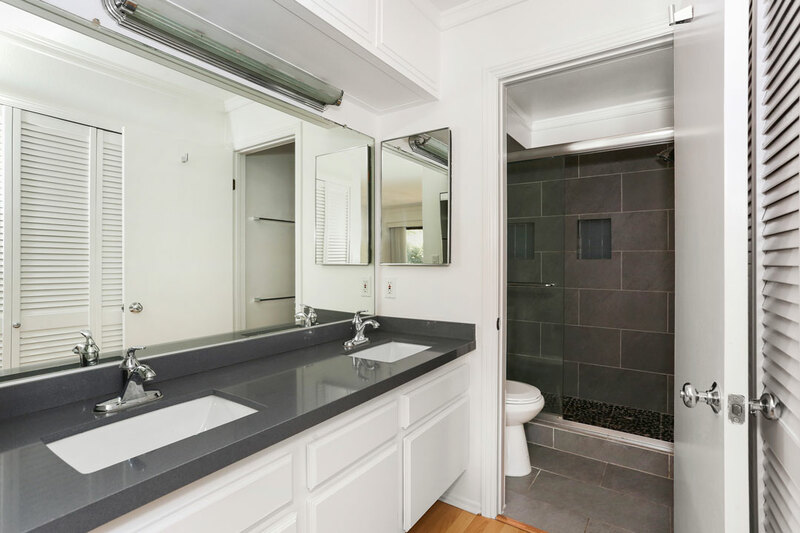 All baths are manicured with tasteful finishes of grey terrazzo tile mosaic and artful fittings. 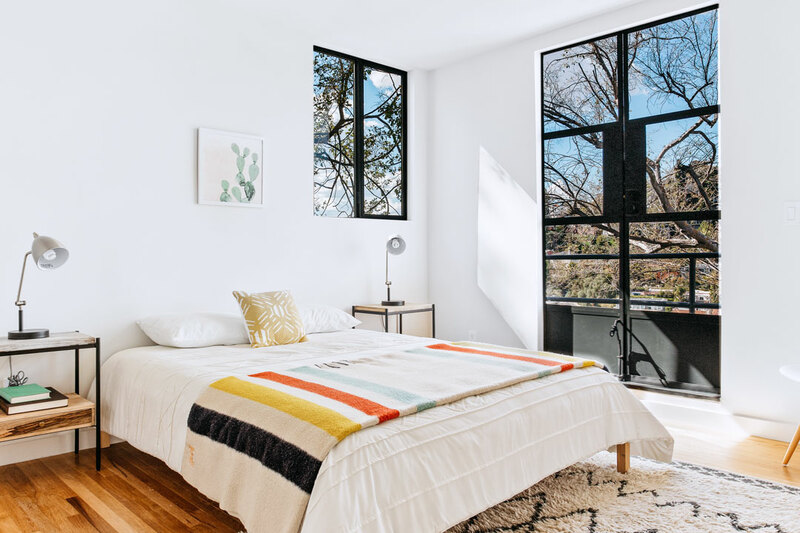 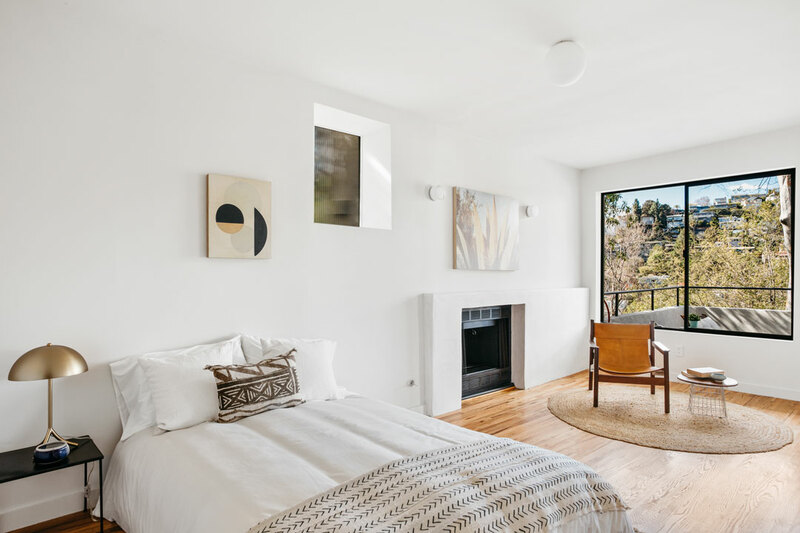 On the expansive lower level, a third bedroom with a fireplace can function as your guest room, or alternatively, as an inspiring space to sequester and create. 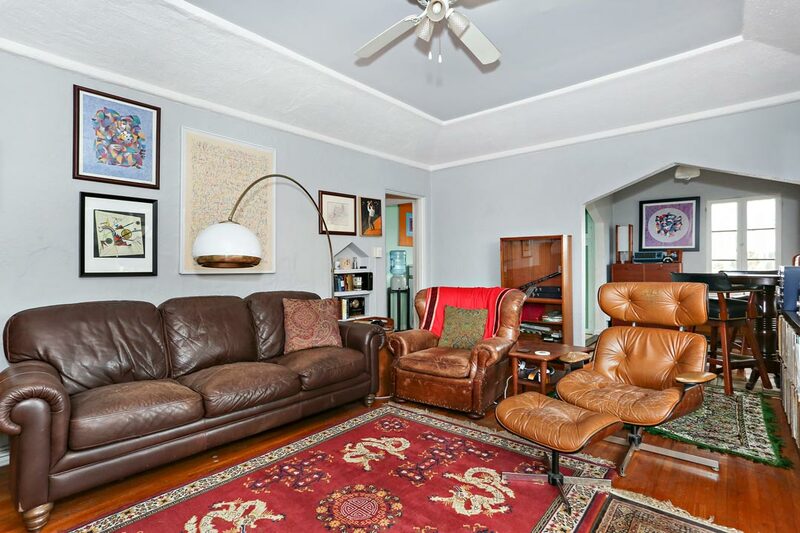 A large den is a perfect spot for screenings and leisurely pursuits. 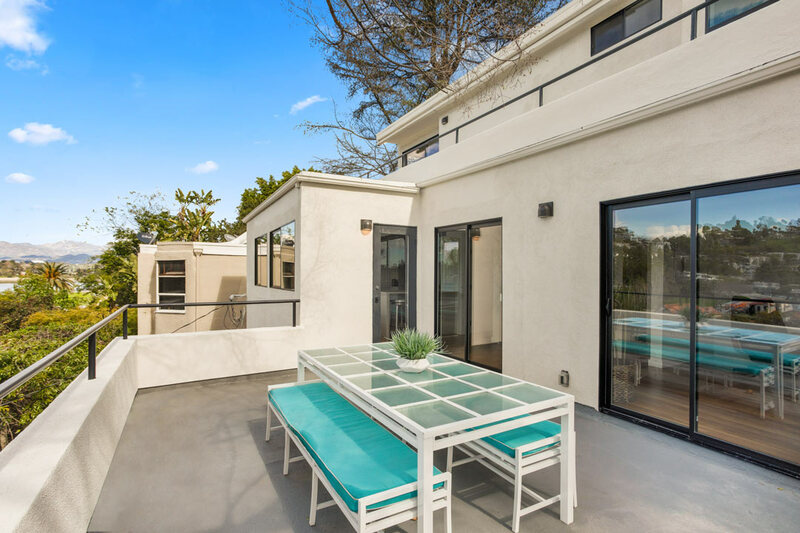 The generous hardscape patio, an enchanted setting for entertaining and al-fresco dining against the background of colorful sunsets, features a bespoke indoor/outdoor petite pool. 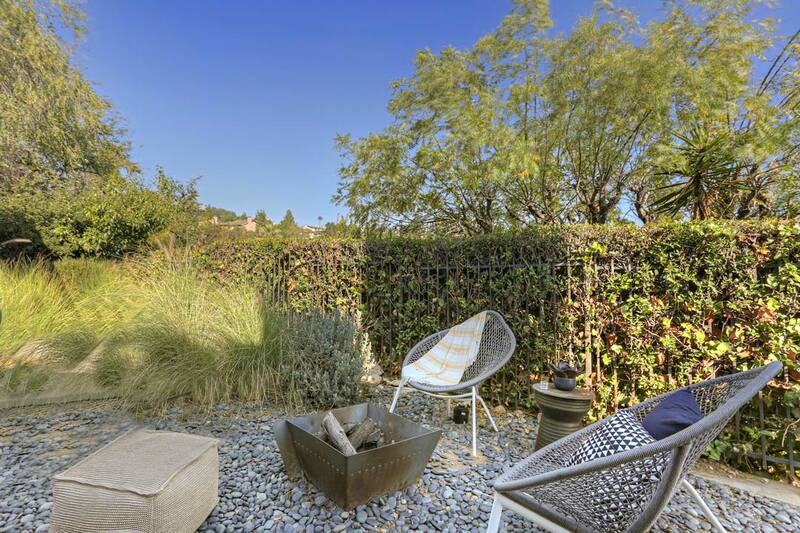 The Hunter Residence is the only home that Kesling, who was well-known for designing sumptuous bathrooms in all his Moderne dwellings, endowed with this special spa-like feature that he referred to as the “Roman Bath.” The yard is professionally landscaped with attractive drought-tolerant flora; the street-to-street lot zoned R2 presents an opportunity for further development. 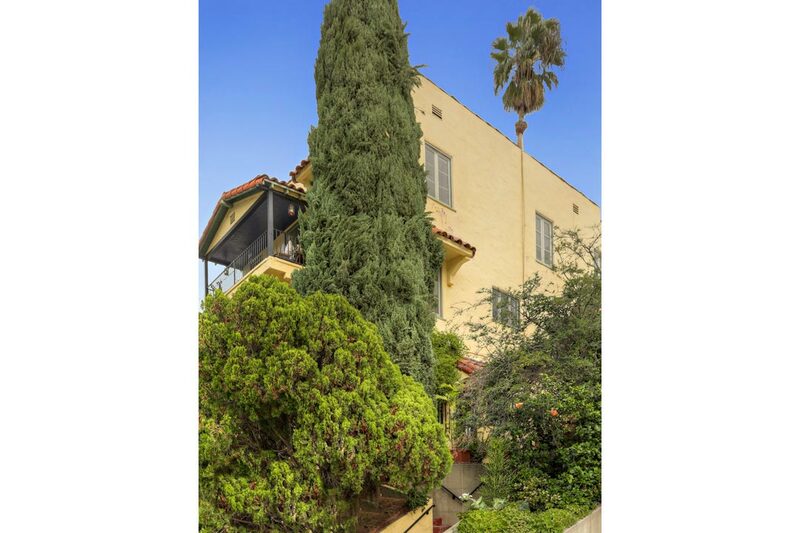 A prolific architect and builder, William Kesling had a unique ability to translate the civic building style of Art Deco to the private residence, becoming one of the most active practitioners of the Streamline Moderne in Los Angeles. 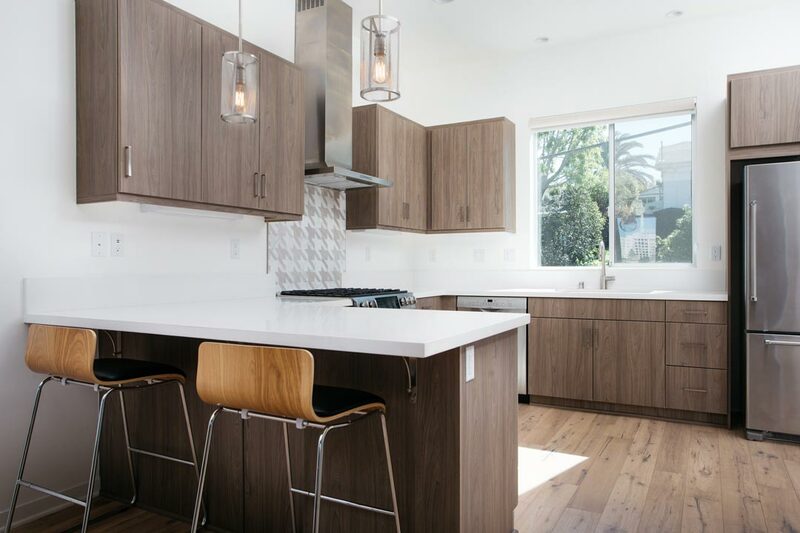 Kesling homes are coveted to this day; in the Hunter Residence you’ll find the very best of what history and the present can offer. 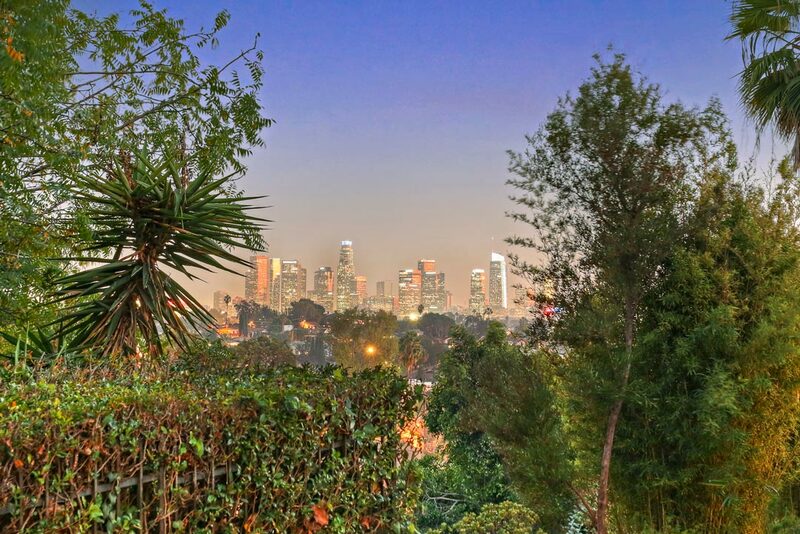 A whisper away from Silver Lake Reservoir and Sunset Junction, you’ll have quick access to the Silver Lake Farmer’s Market, Sawyer, Cafe Stella, Intelligentsia, Black Cat, Pine & Crane and more. 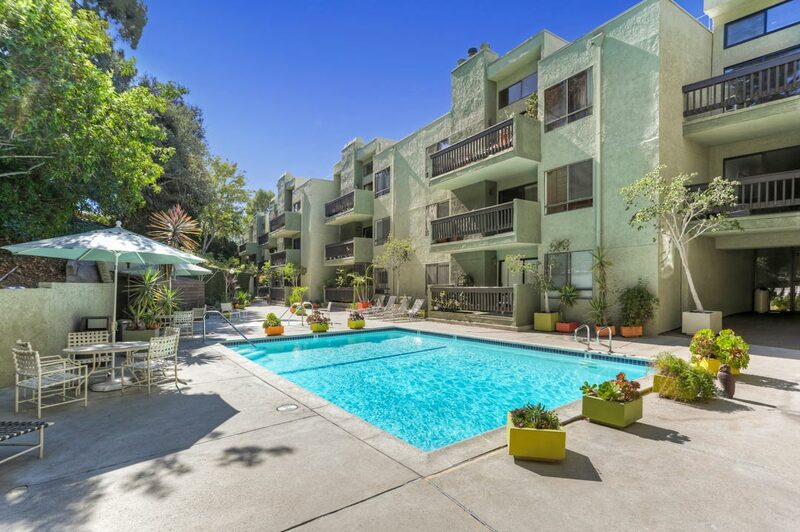 Trader Joe’s, Gelson’s and Whole Foods 365 are just minutes away. 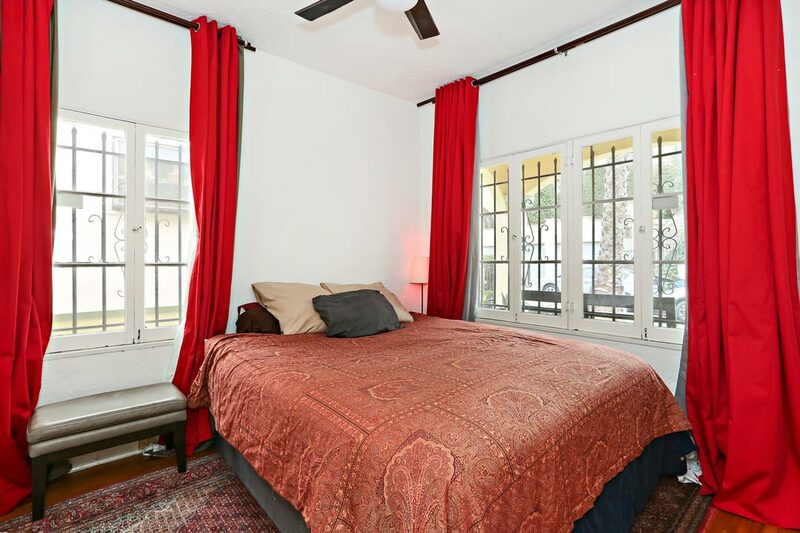 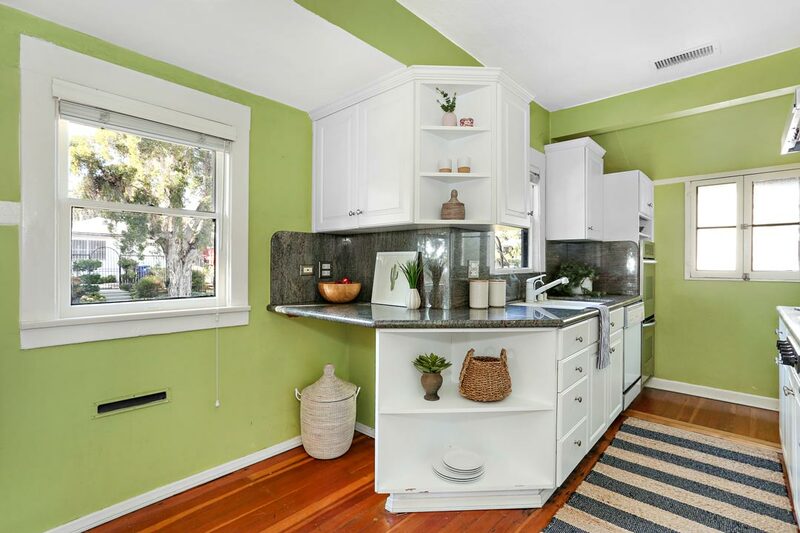 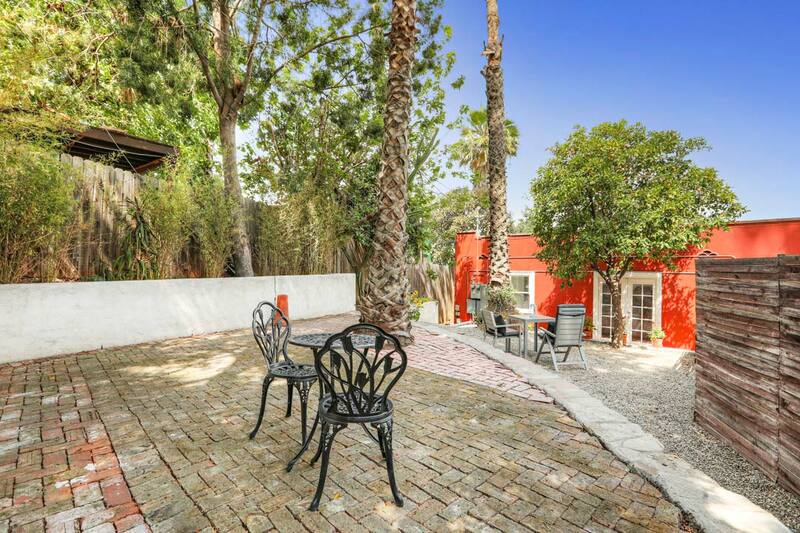 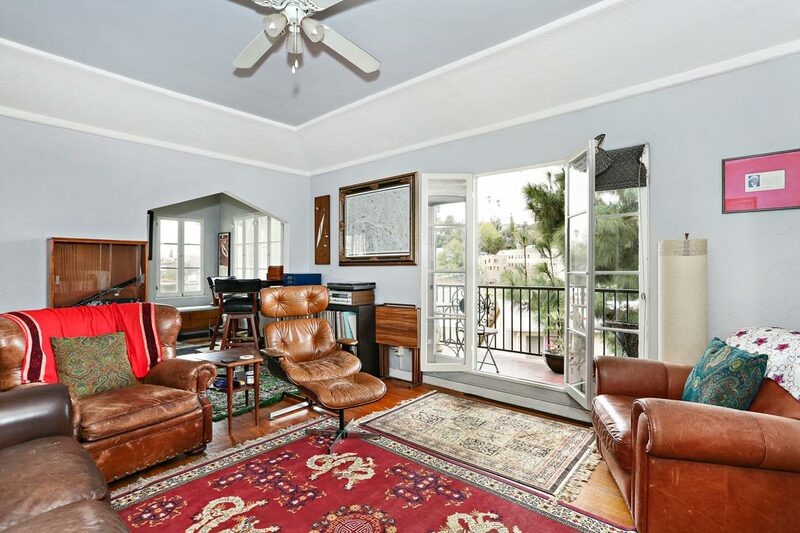 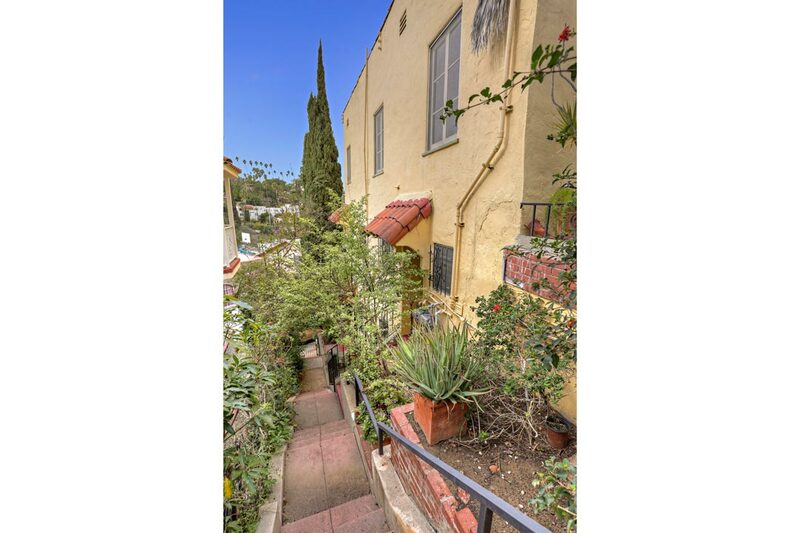 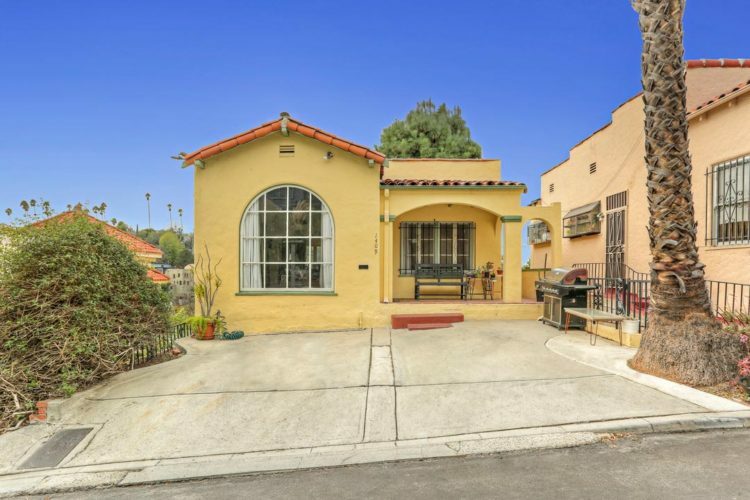 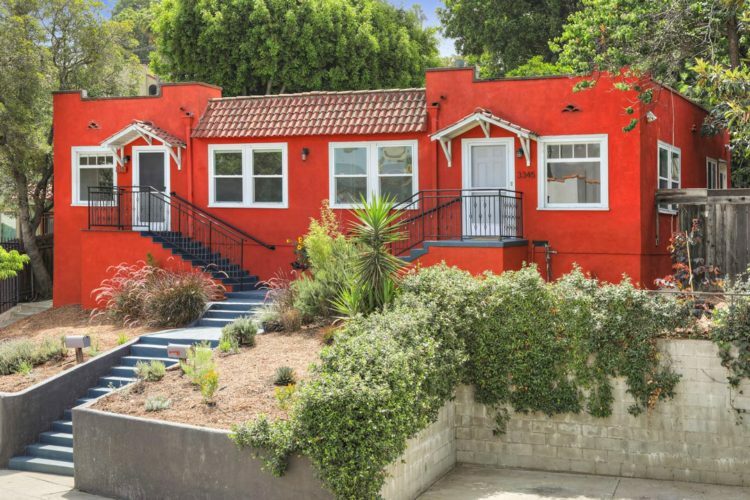 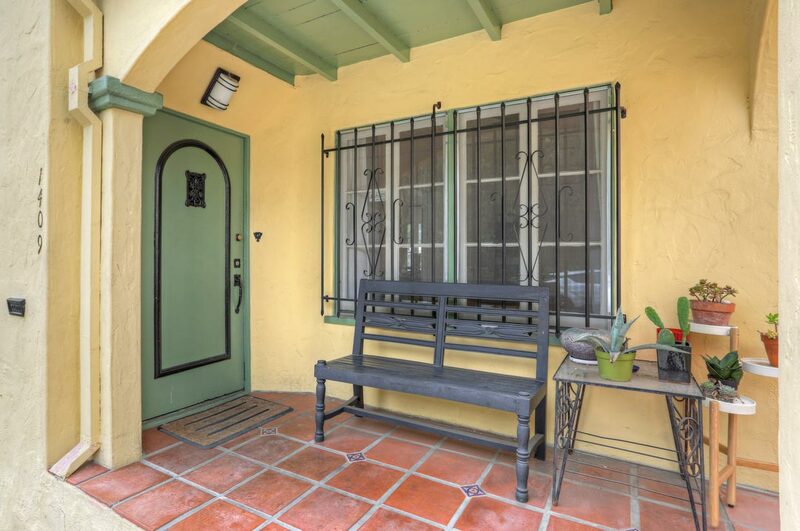 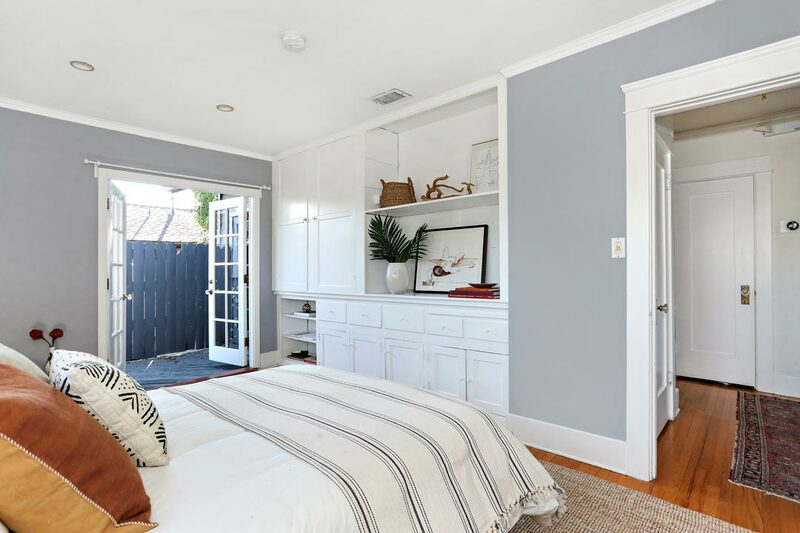 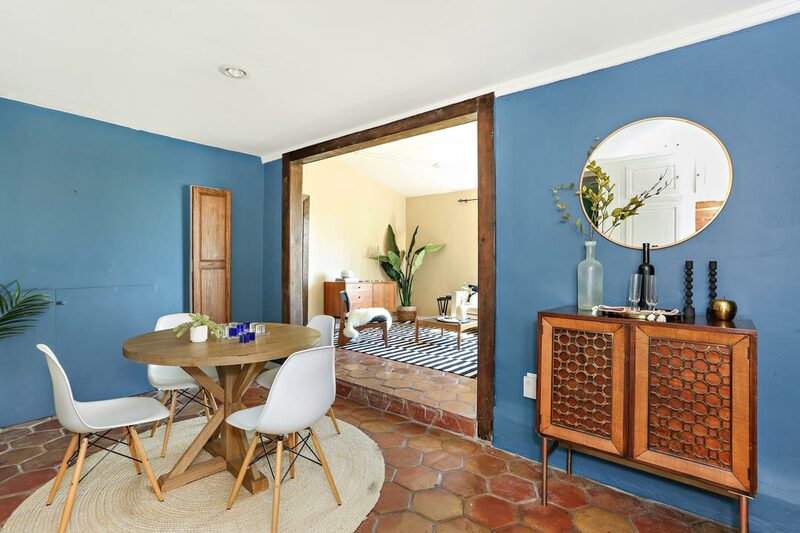 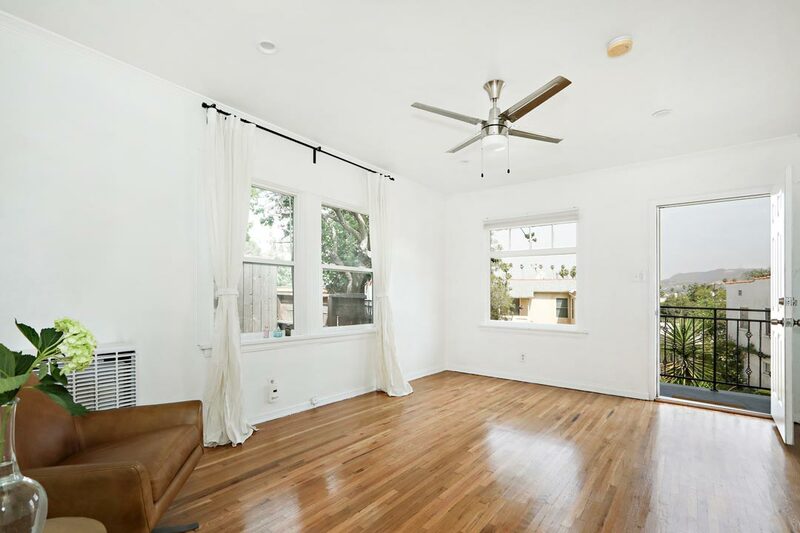 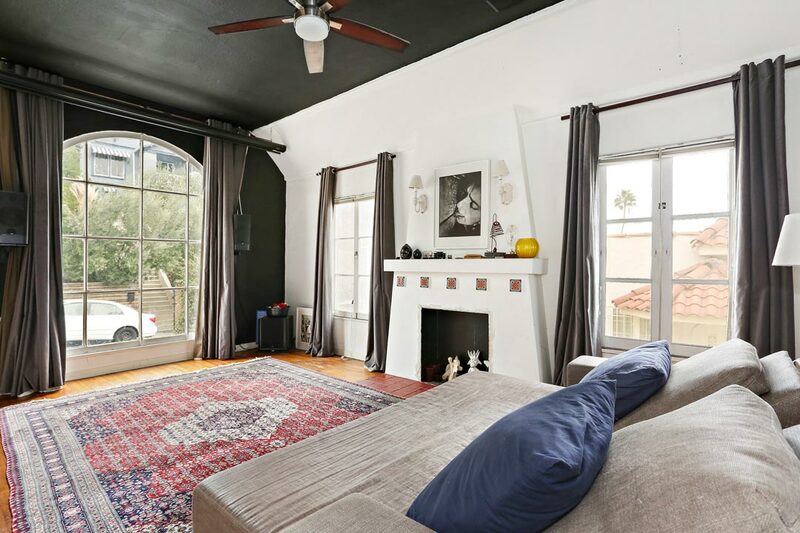 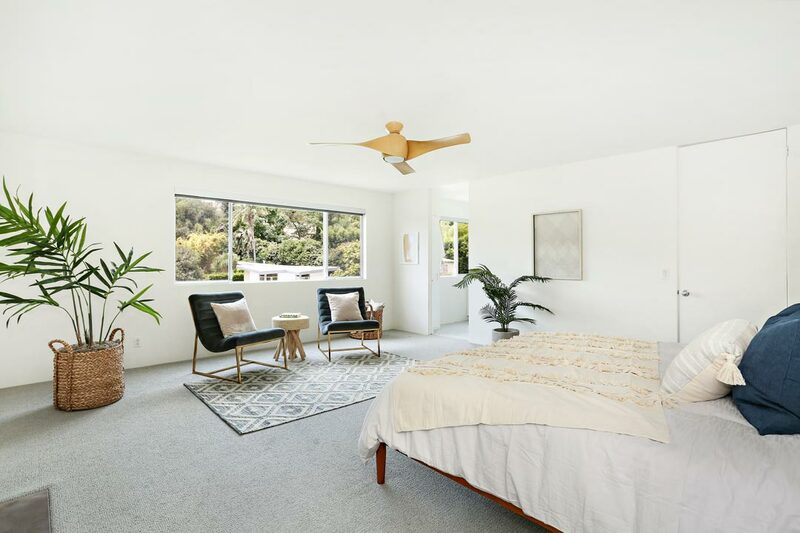 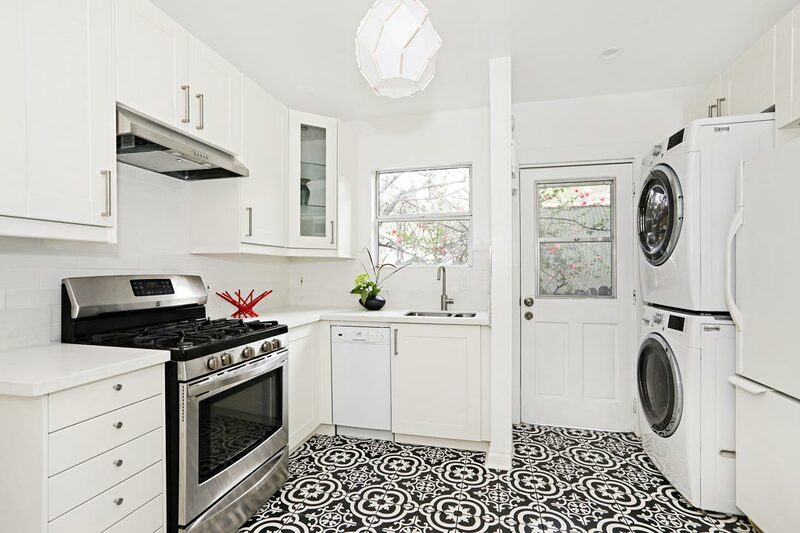 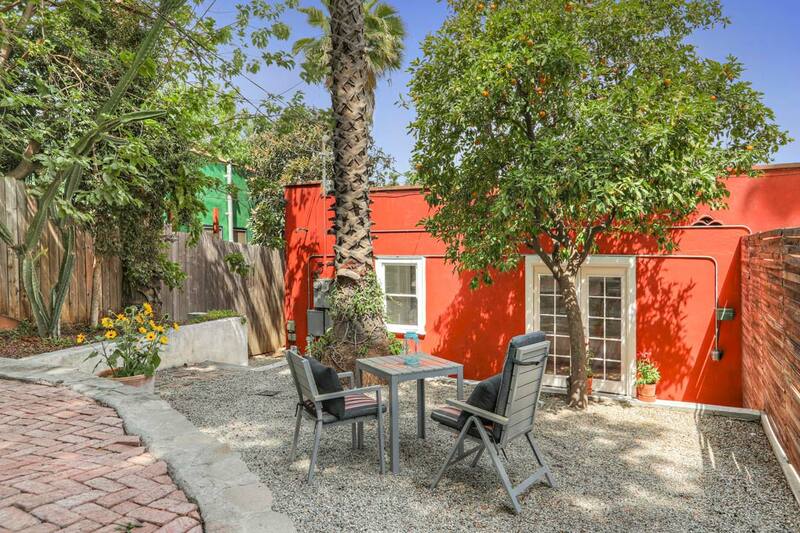 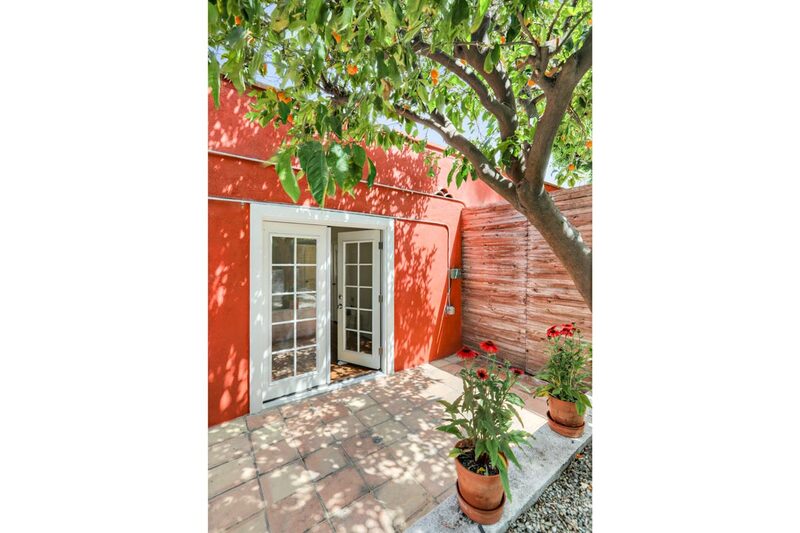 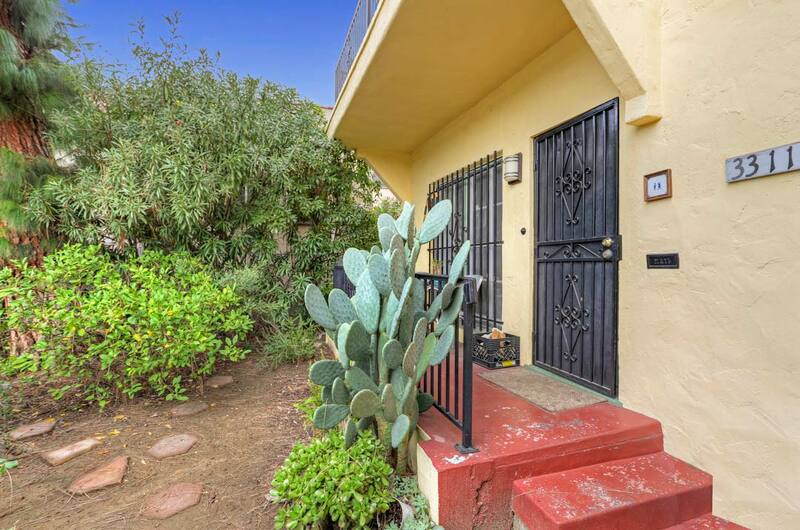 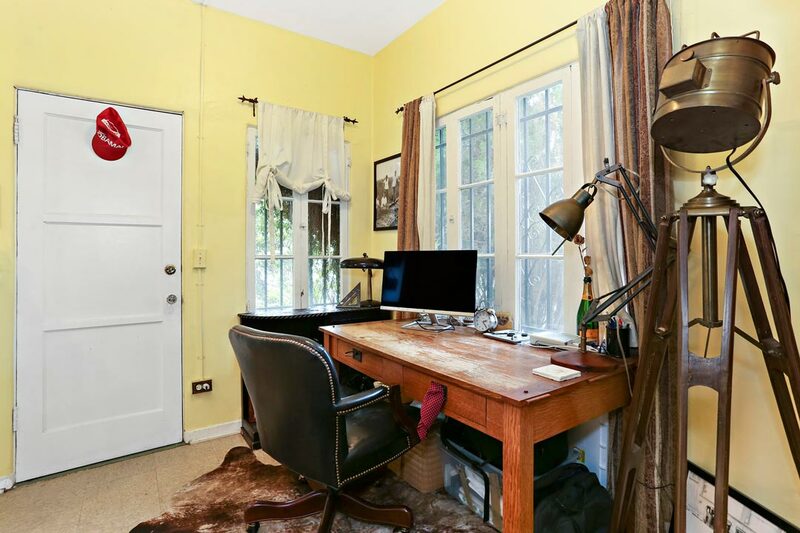 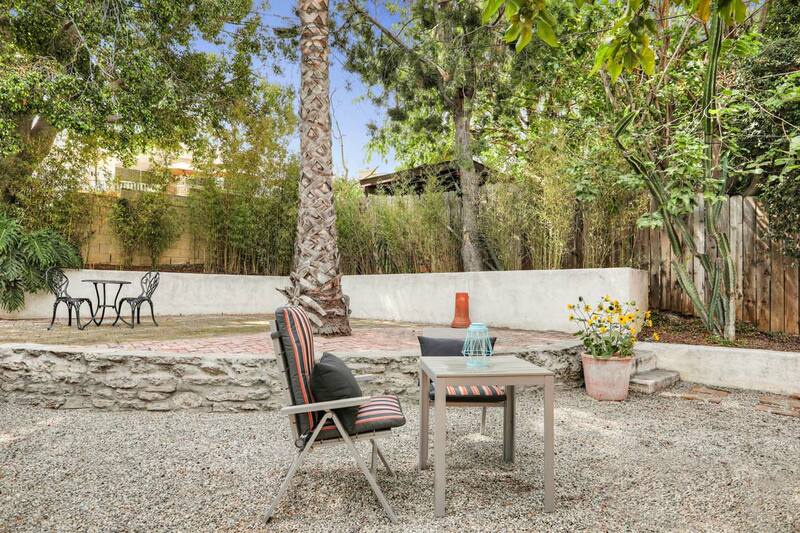 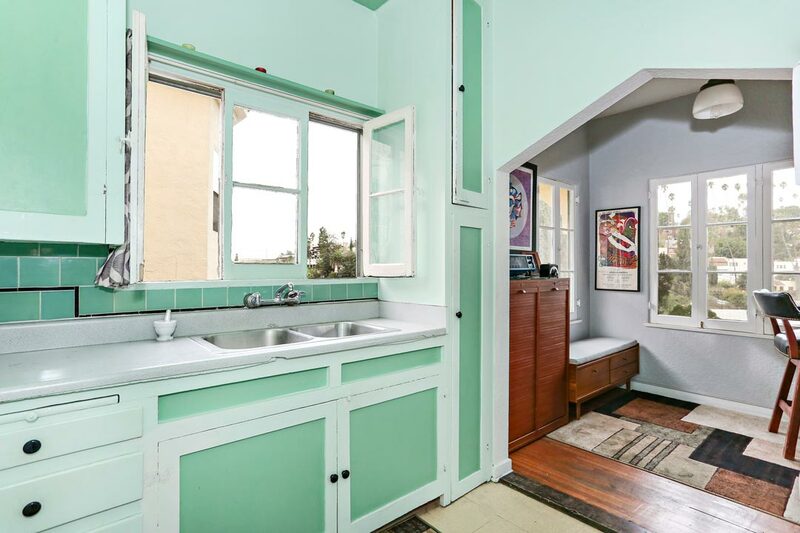 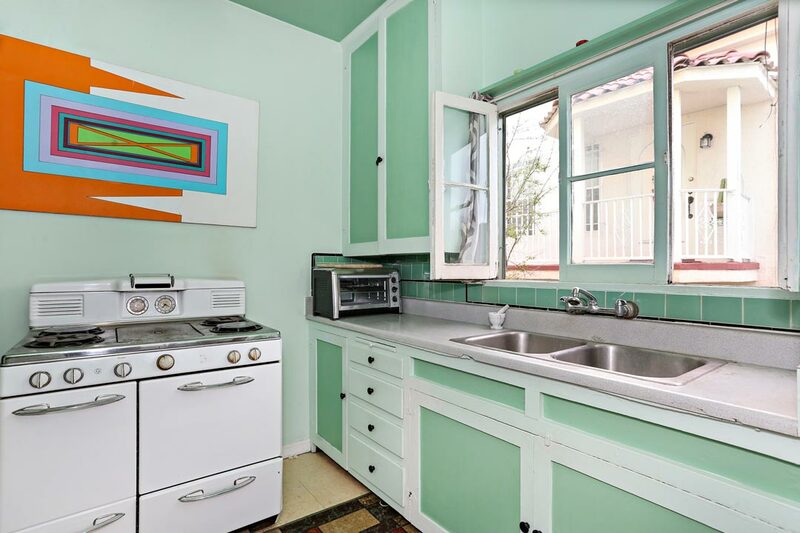 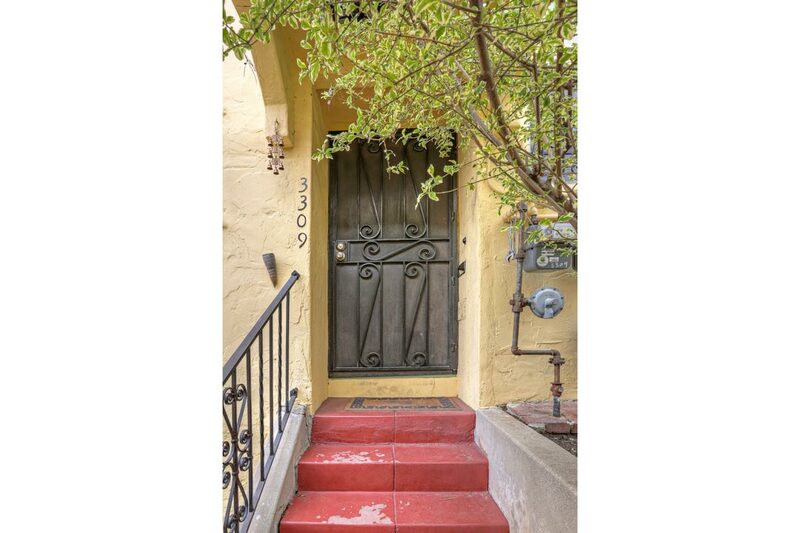 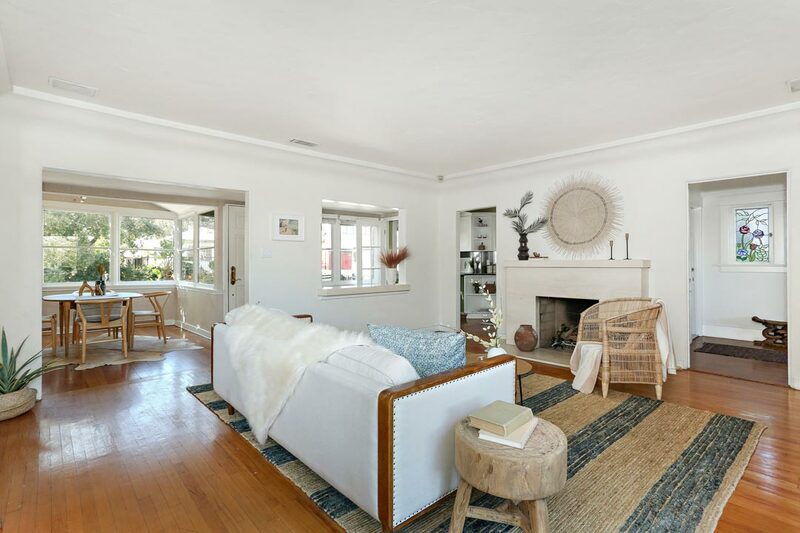 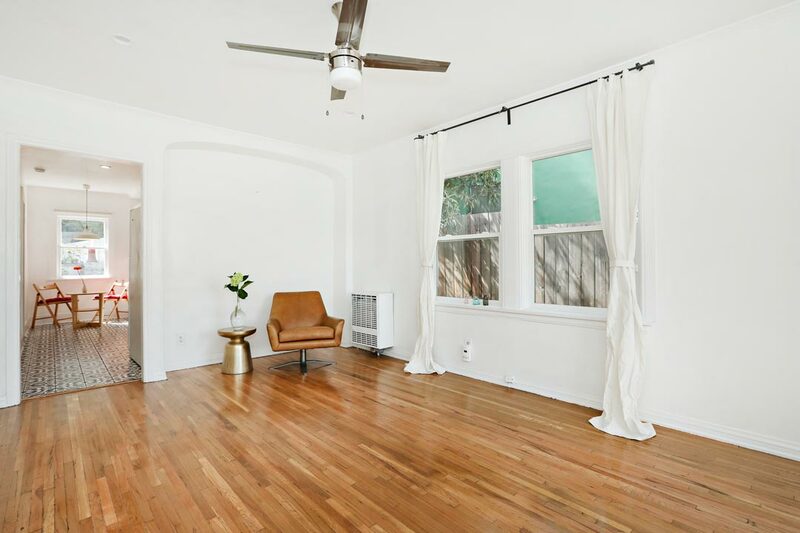 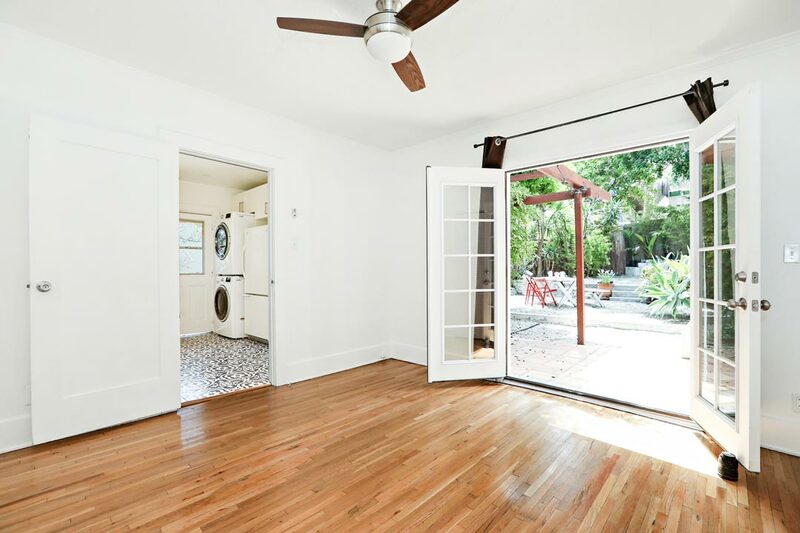 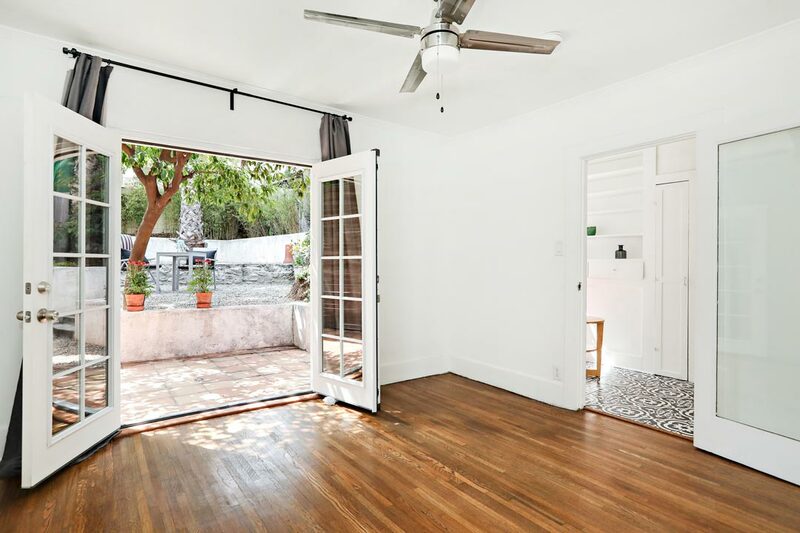 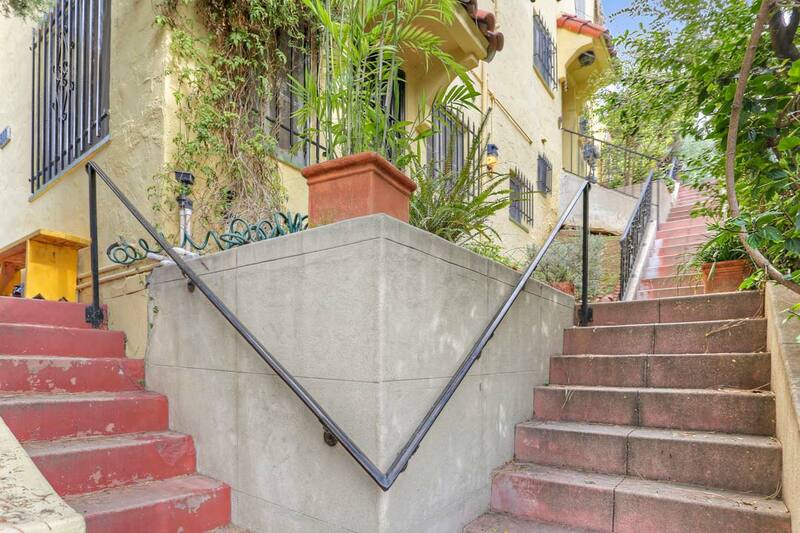 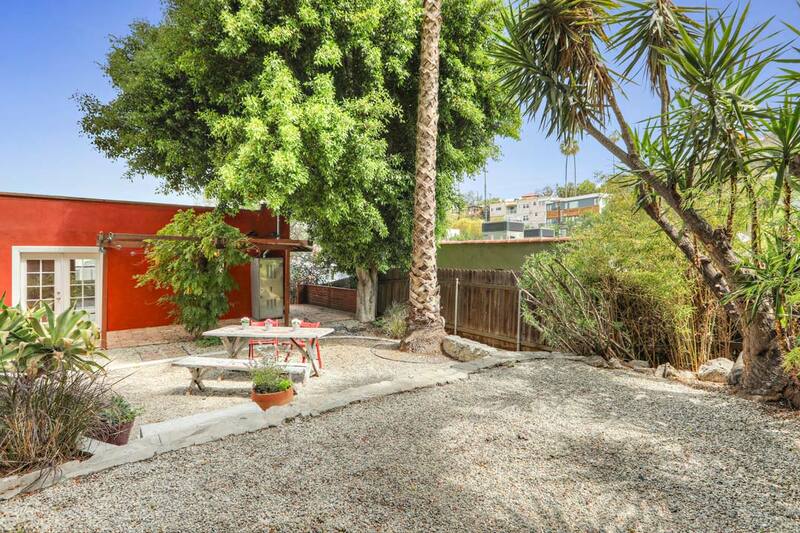 Find a nice investment opportunity in this handsome Spanish-style triplex located on a street-to-street lot in prime Silver Lake. 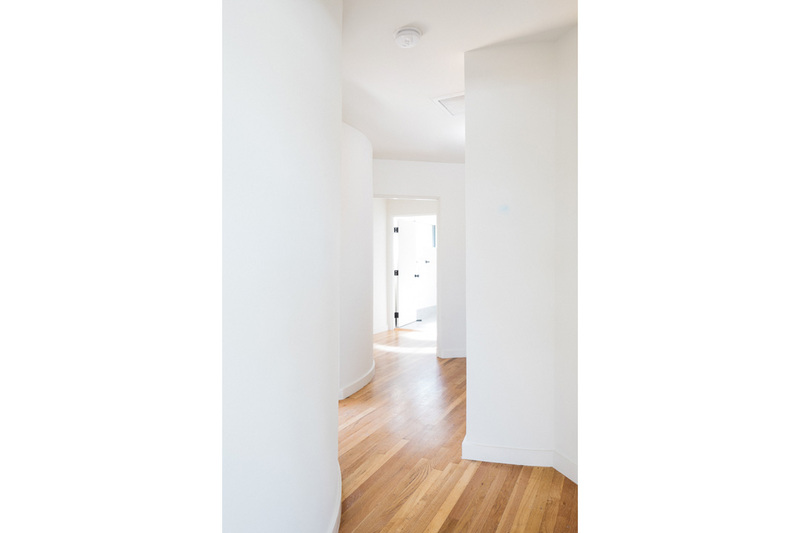 The complex was built in 1931 and retains many period architectural details including tray ceilings with above-average height, large French windows and beautiful wood floors. 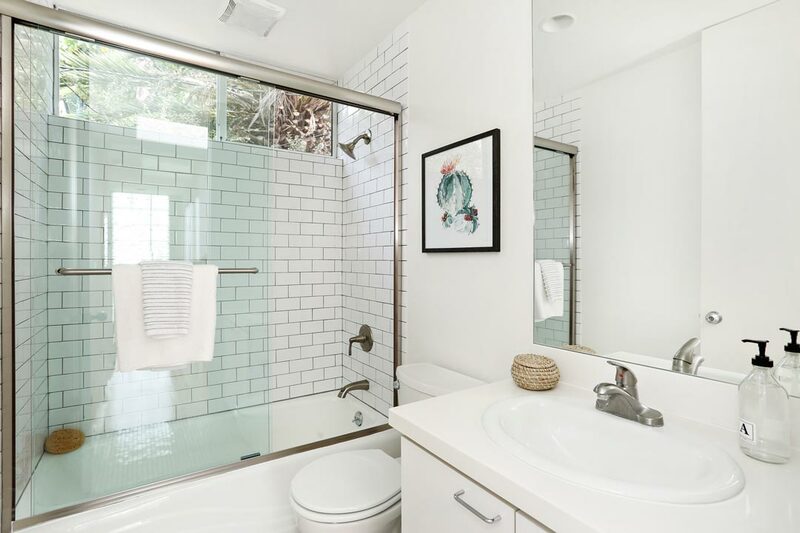 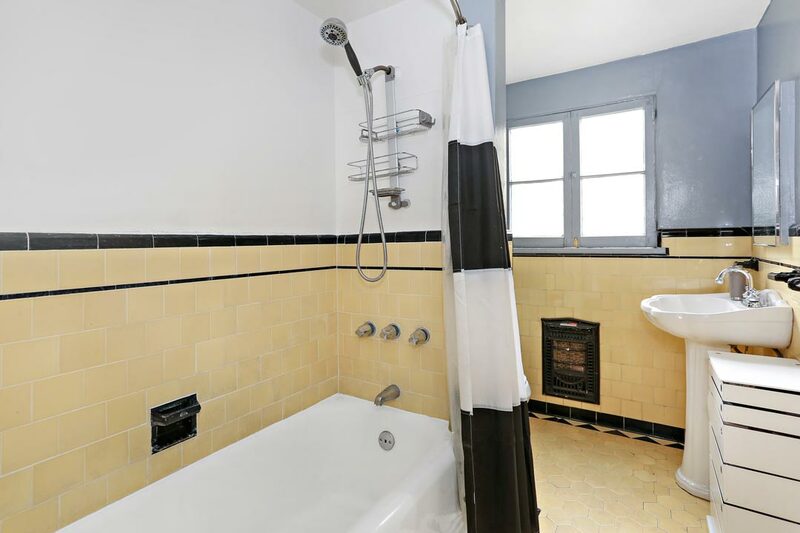 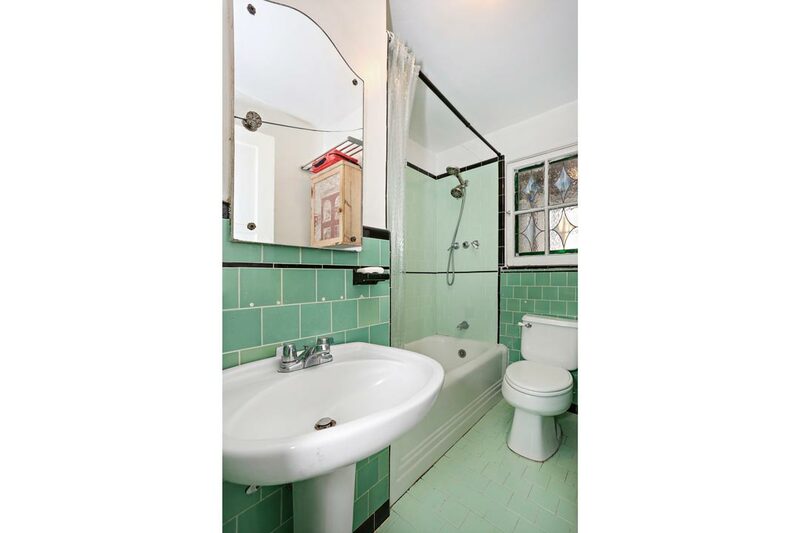 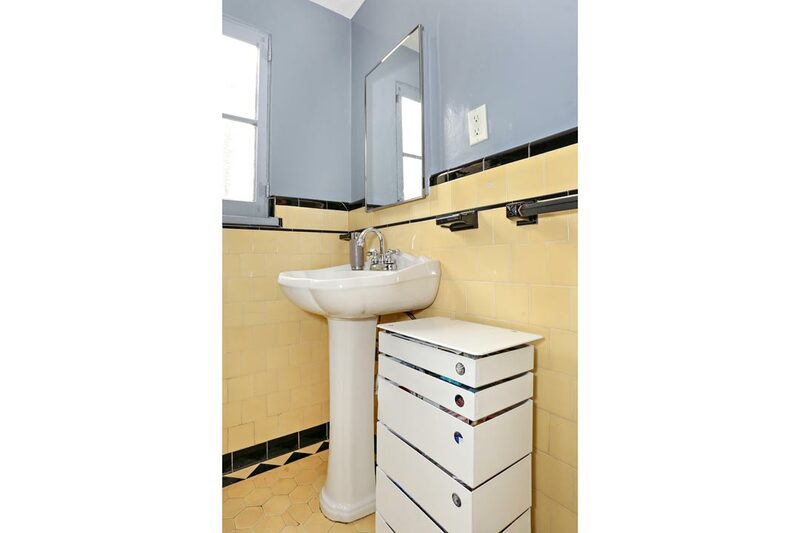 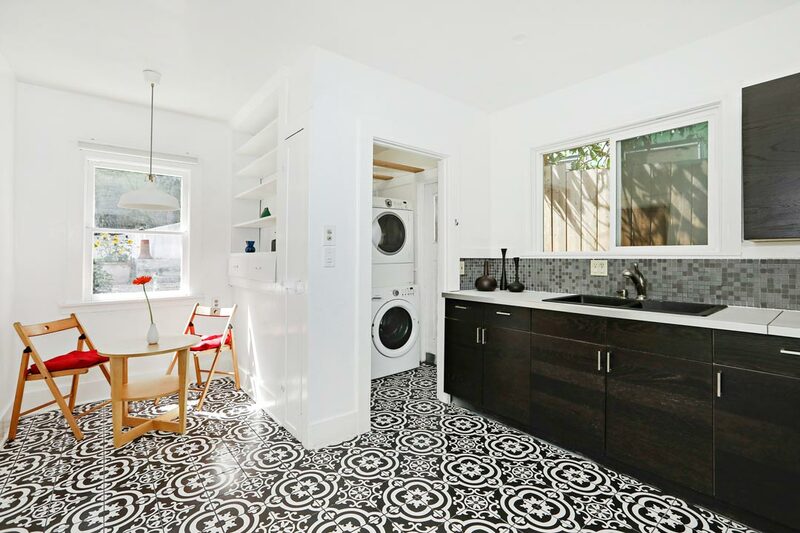 Two sunny apartments, each with one bedroom + one bathroom, feature vintage tile elements and laundry rooms. 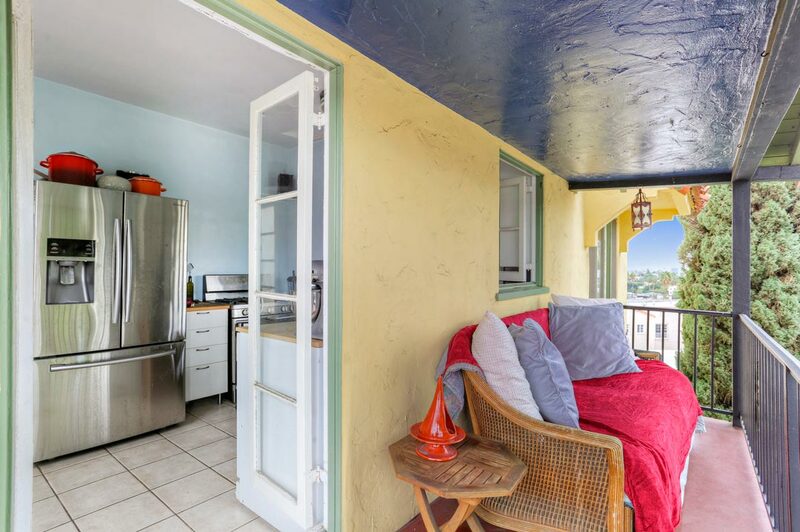 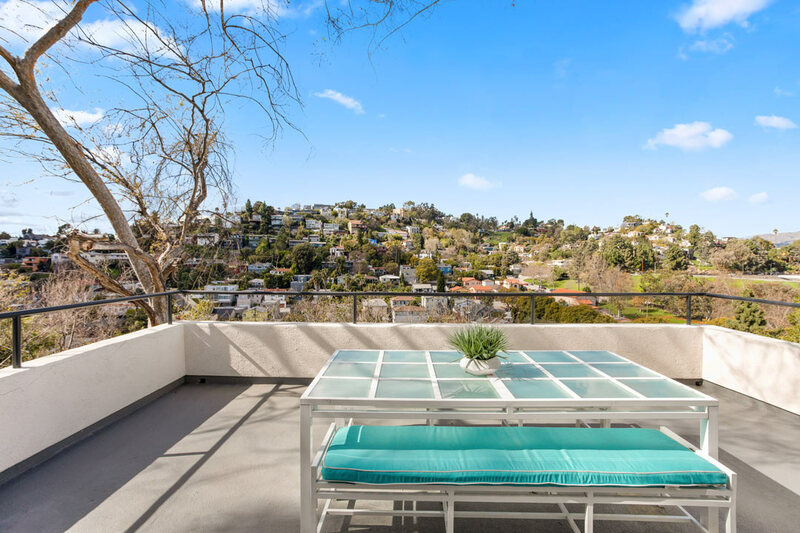 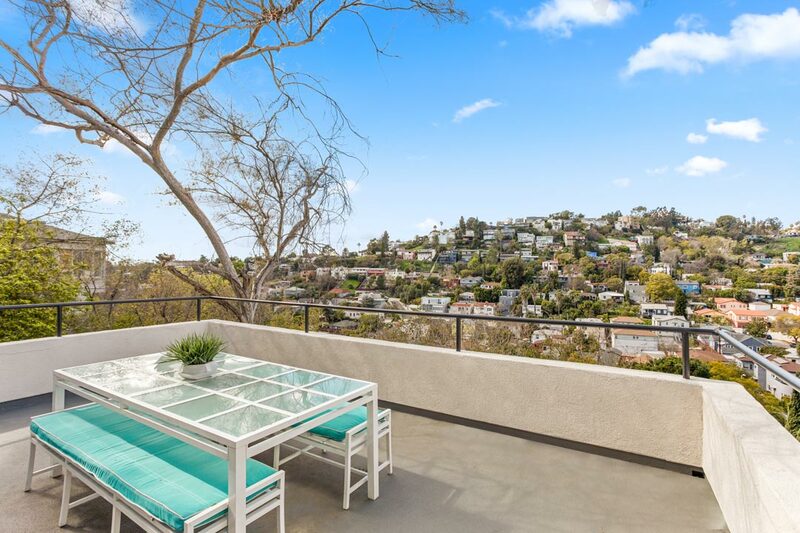 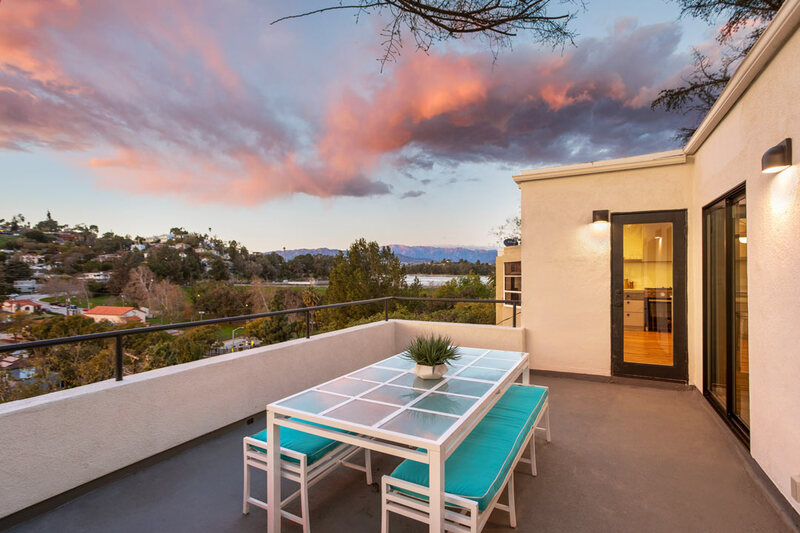 Balconies provide a spot to dine al fresco with enchanting views of Sunset Junction, the Hollywood Sign and Griffith Park Observatory. 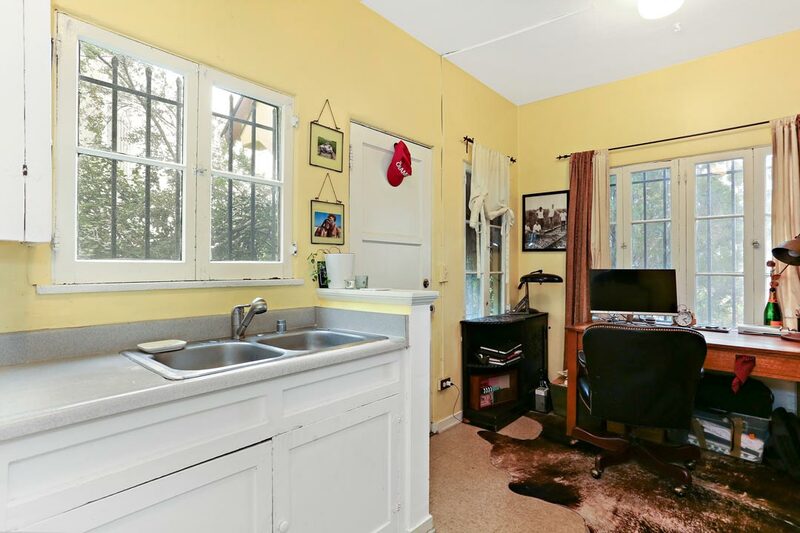 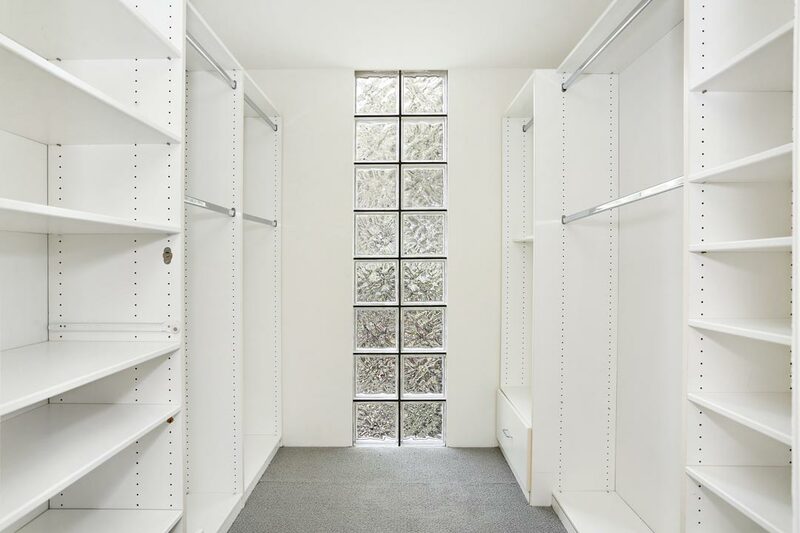 The downstairs studio apartment opens to a charming private garden. 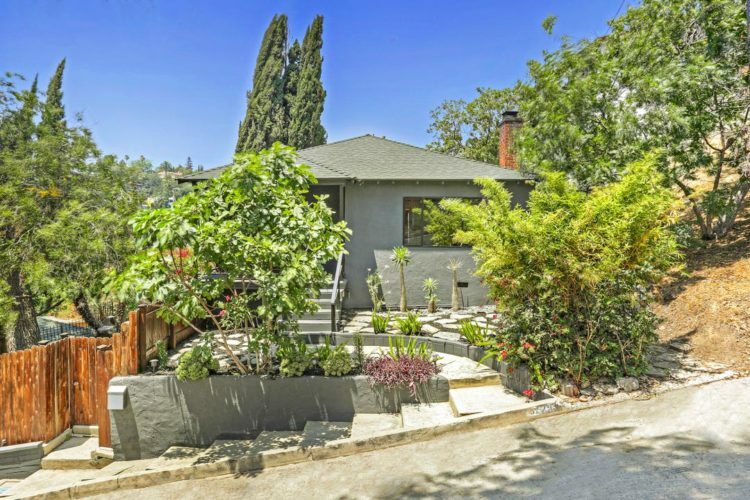 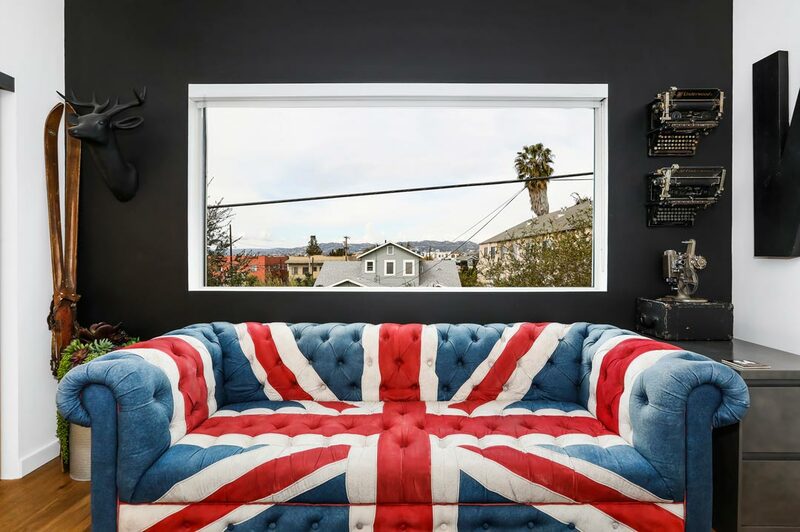 Sunset Junction is just a few blocks away offering trendy options for shopping, dining and nightlife, plus the twice-weekly Silver Lake Farmer’s Market. 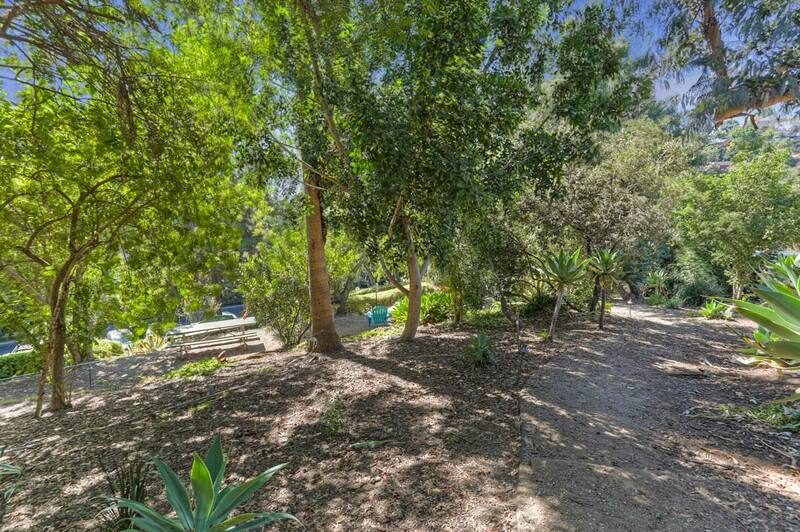 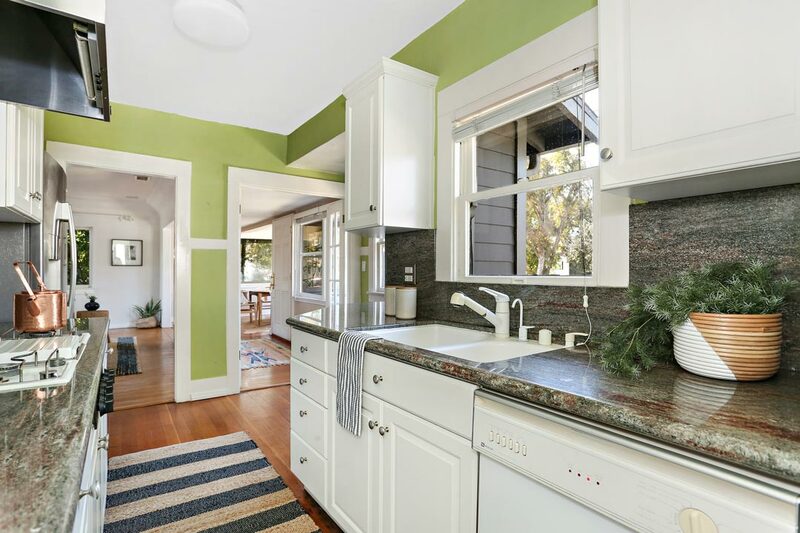 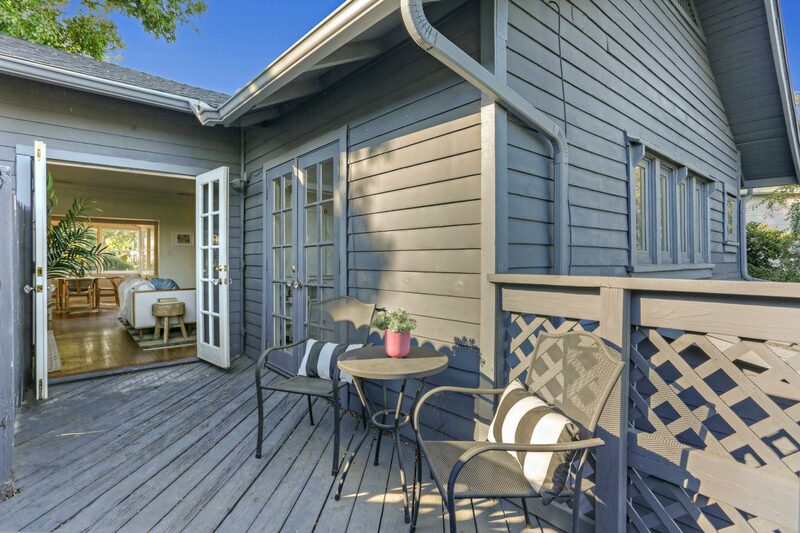 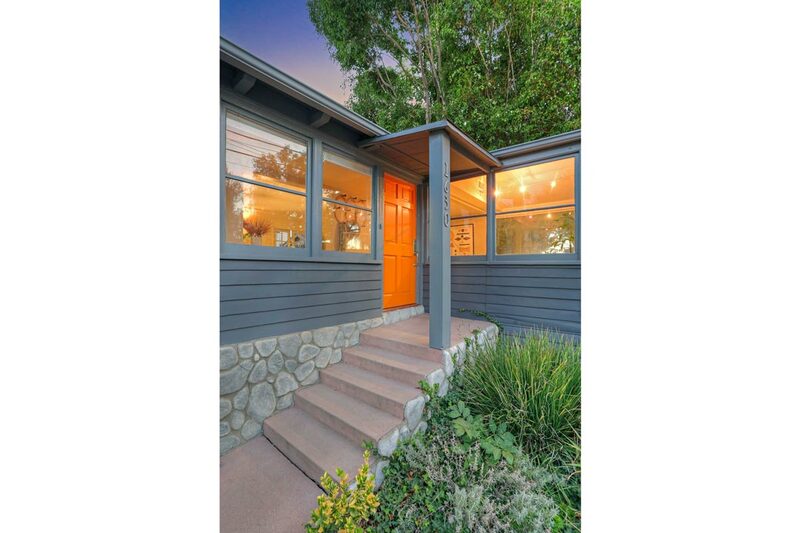 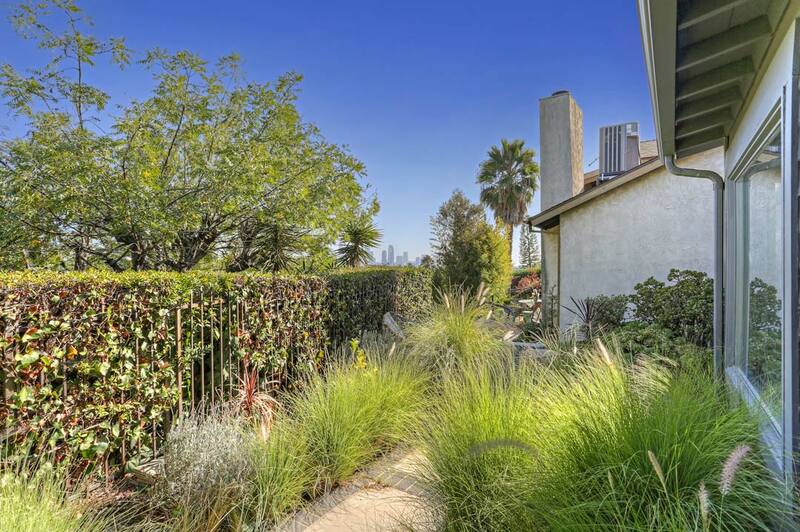 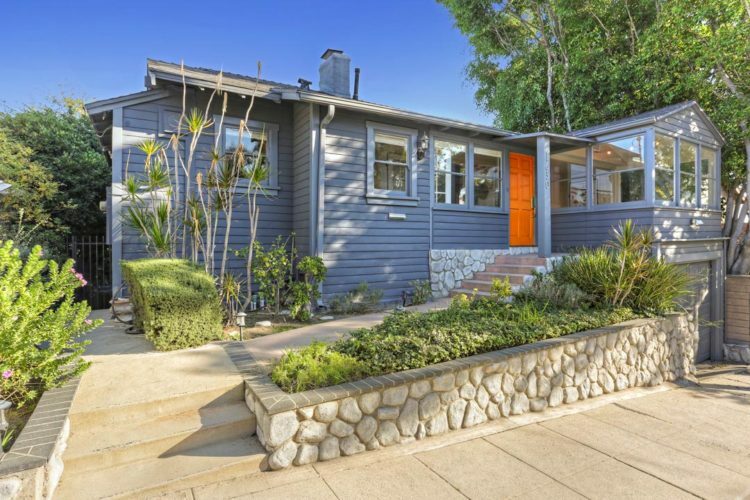 An opportunity to get into Silver Lake and the coveted Ivanhoe School District at a price that is rarely seen. 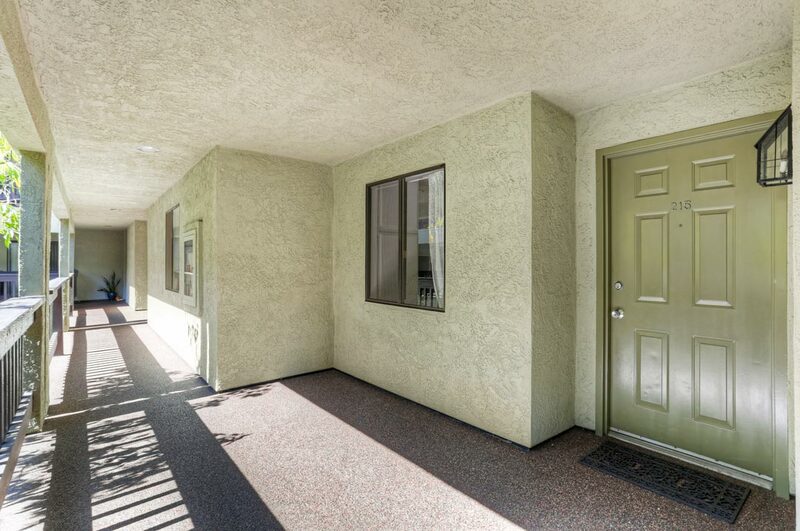 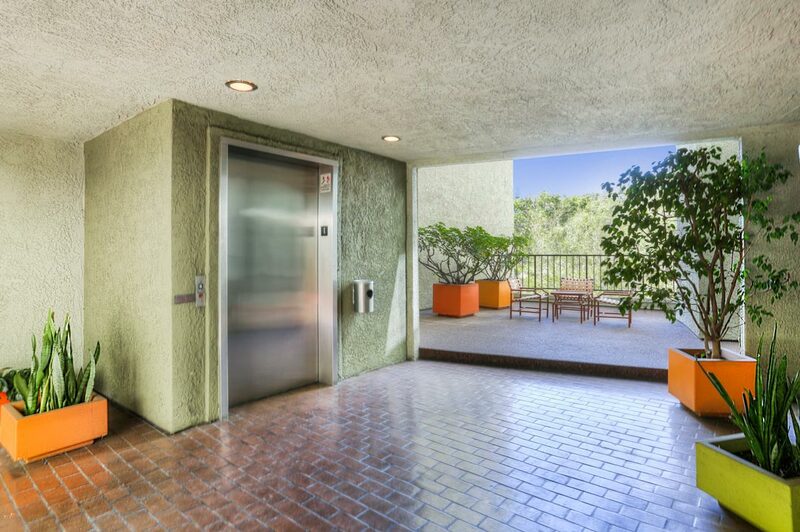 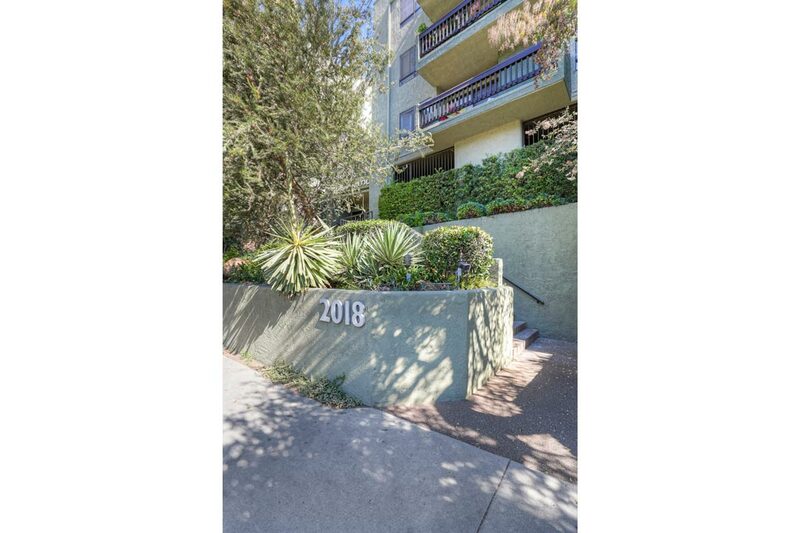 This spacious home is in Cedar Lodge, a serene and well-maintained condominium community ideally situated near shopping, dining and the Silver Lake Reservoir. 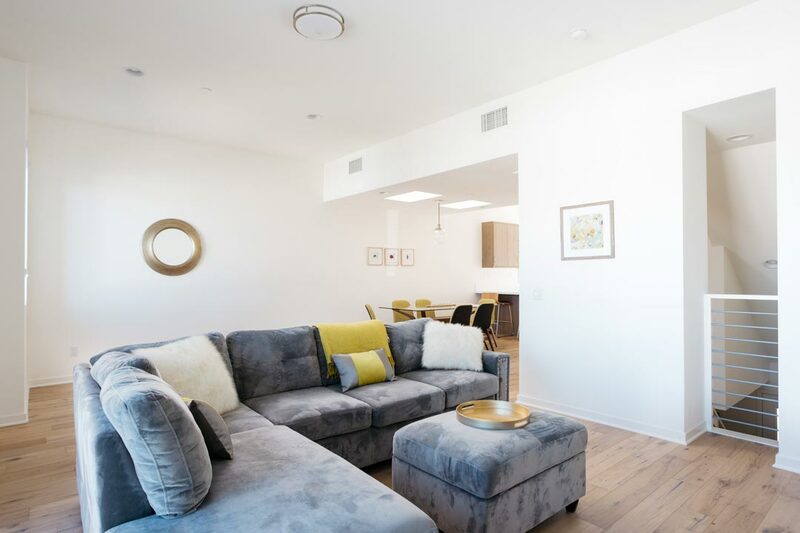 The second-level unit features an airy great room with a fireplace, hard surface flooring and seamless flow to a private balcony, your perfect spot for morning coffee with a lovely park view. 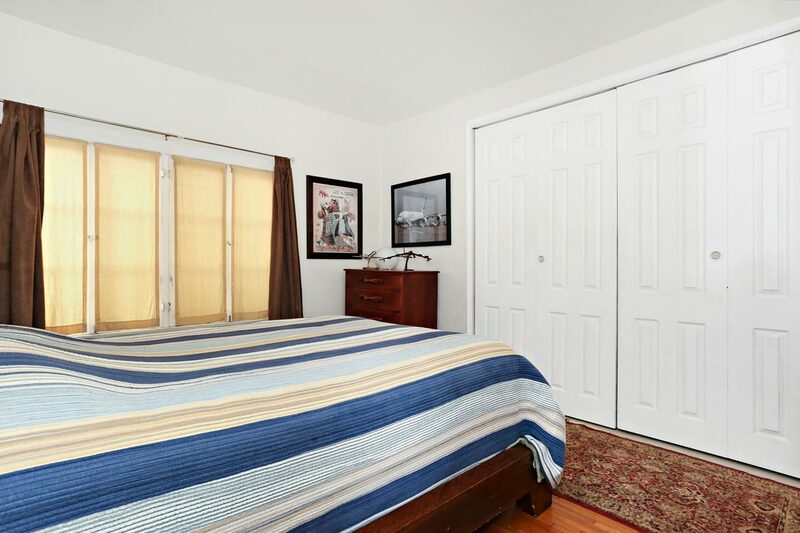 The Master bedroom has two closets, an attached bathroom and dual vanities. 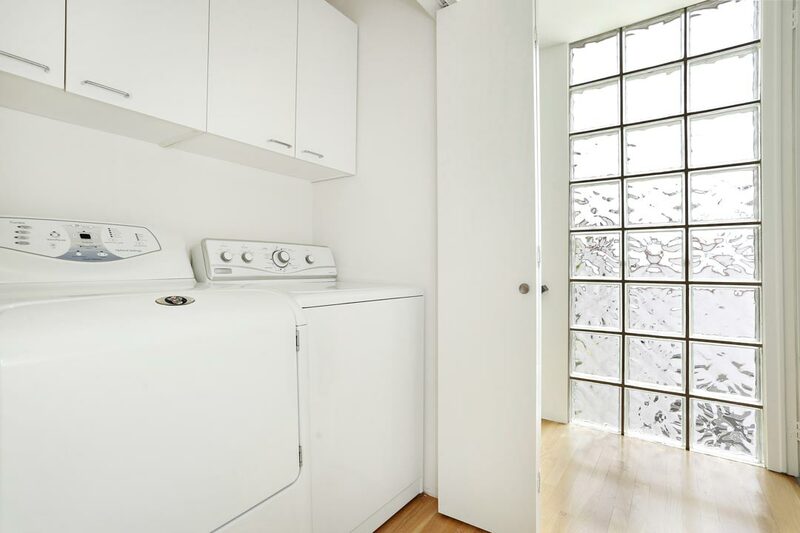 There is in-unit laundry, central a/c and two-car covered parking with a high-speed EV charging station. 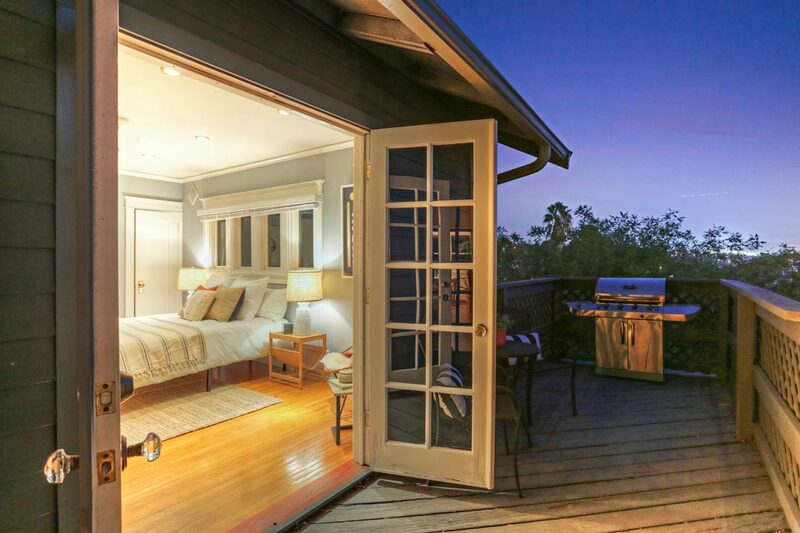 Cedar Lodge is renown for its tranquil courtyards, lush landscaping, swimming pool and spa. 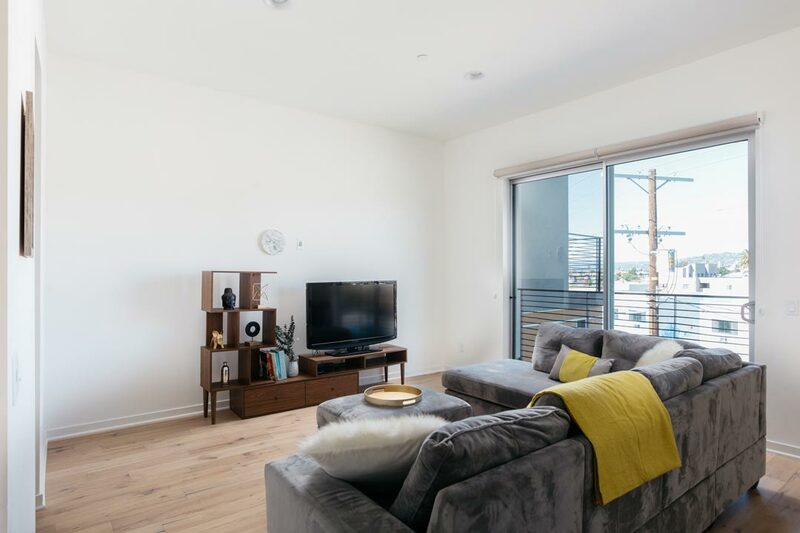 The community is pet-friendly and close to Sunset Junction where restaurants, boutiques and a twice-weekly Farmer’s Market create a great neighborhood vibe. 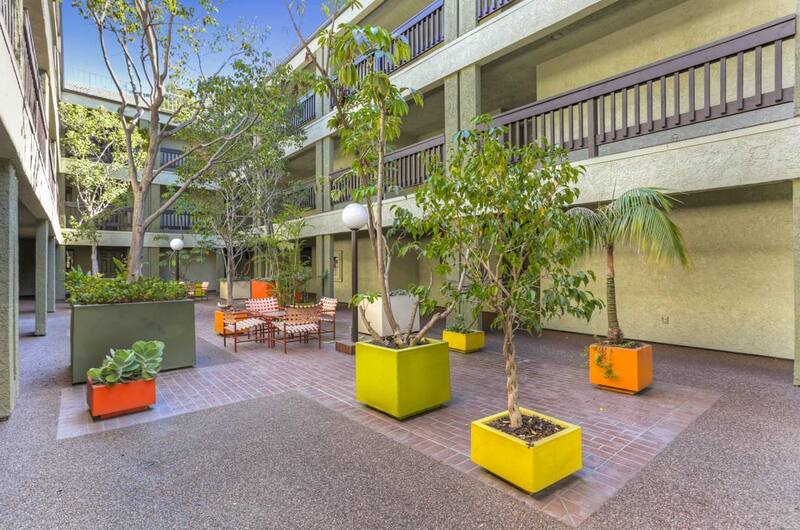 Also nearby is the hub of Hyperion and Rowena with Trader Joe’s, Gelsons, Square One, Speranza and more. 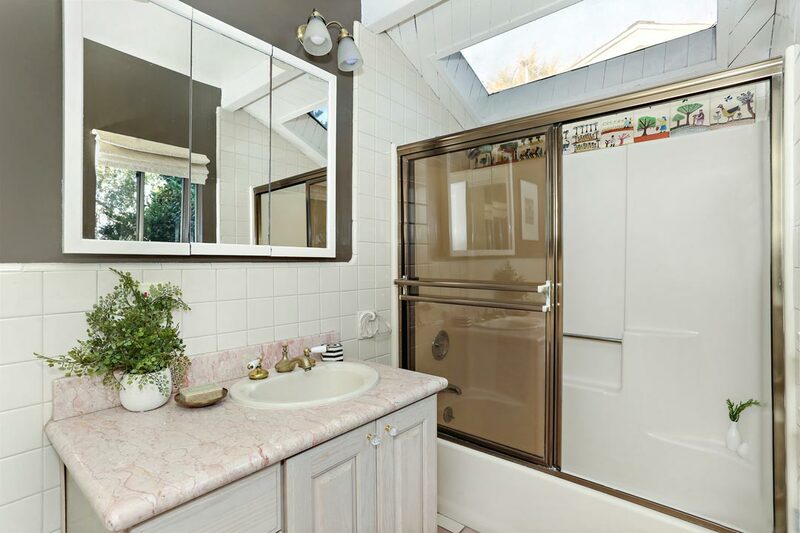 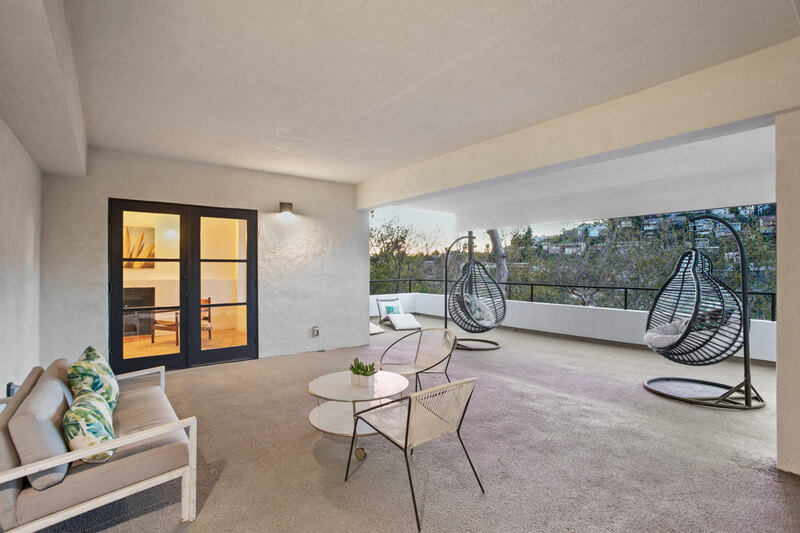 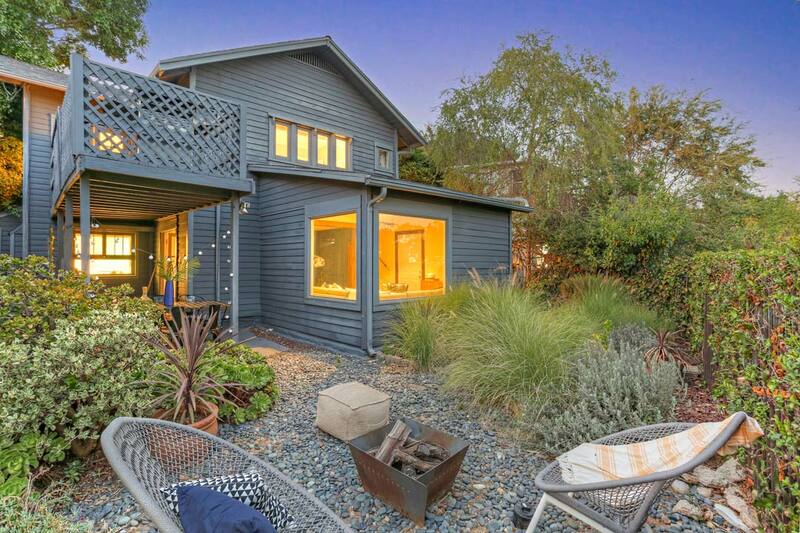 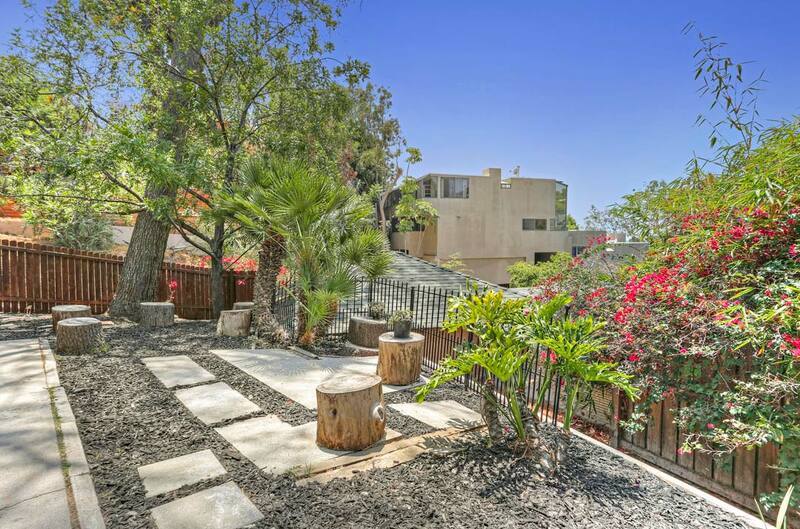 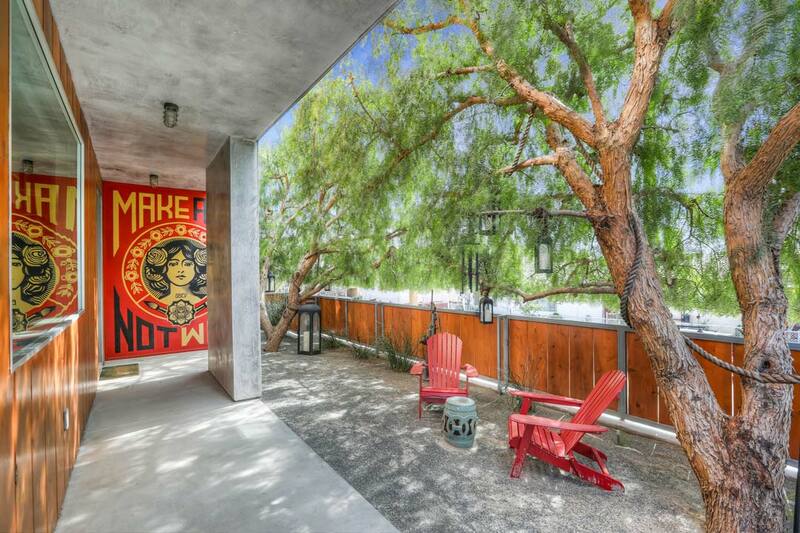 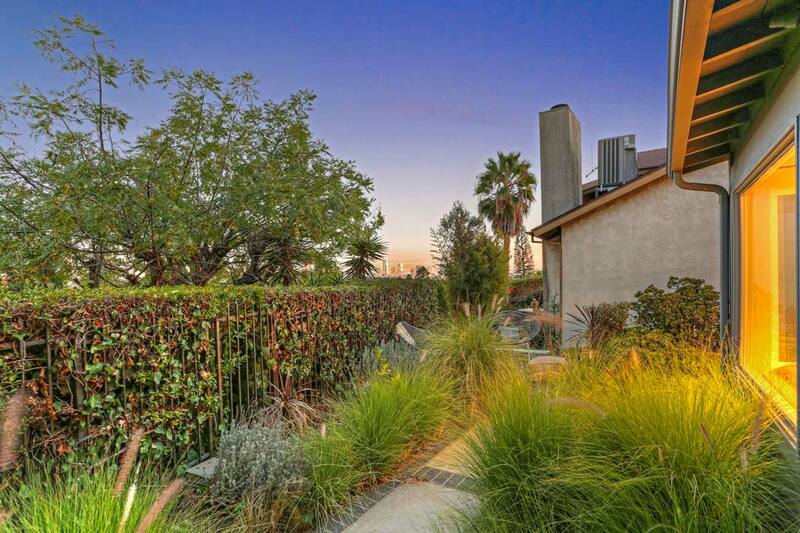 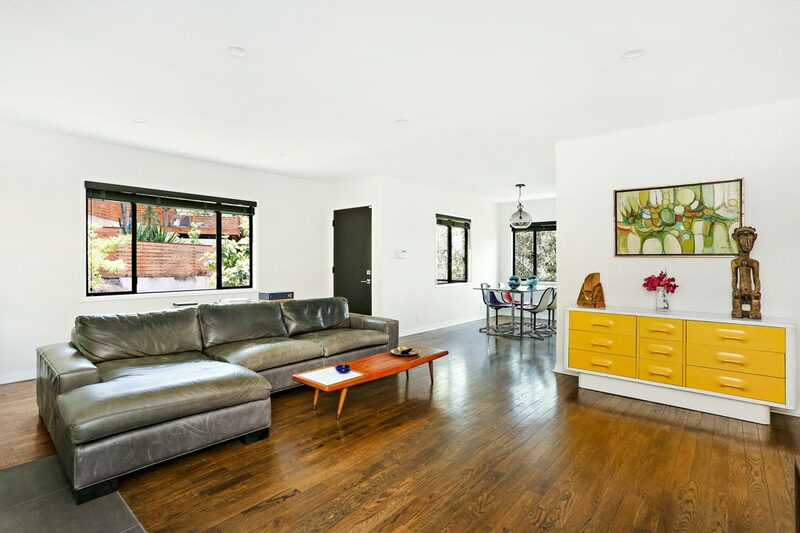 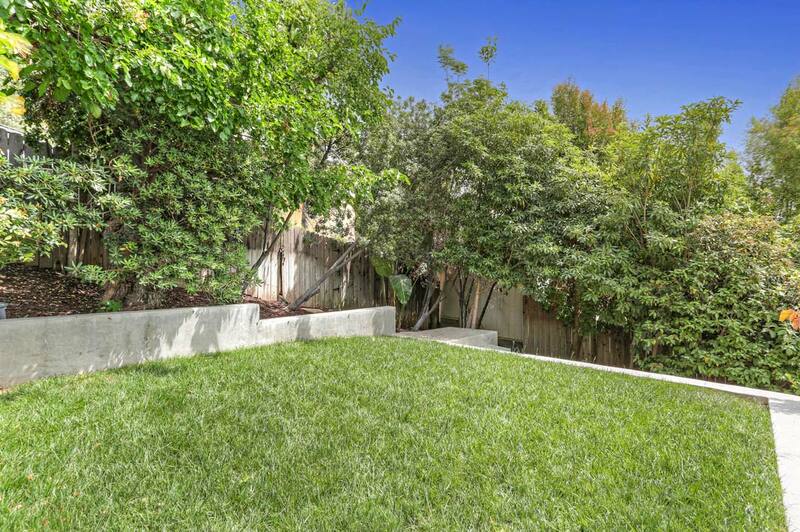 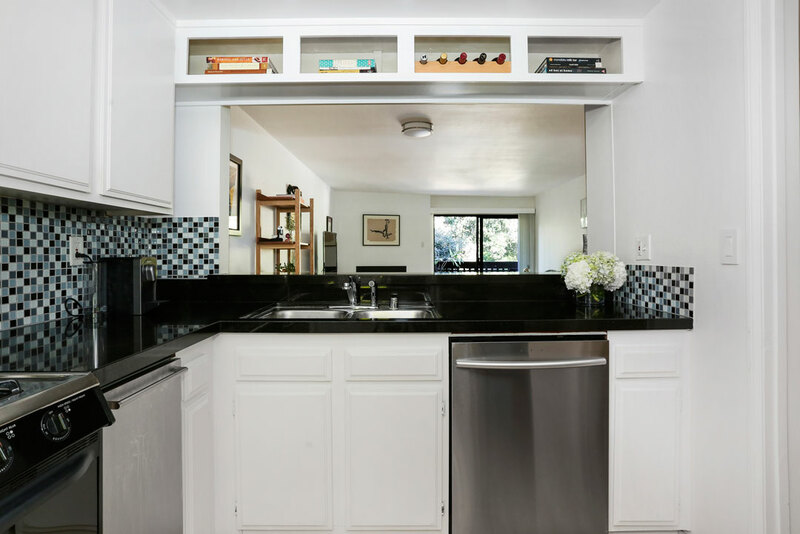 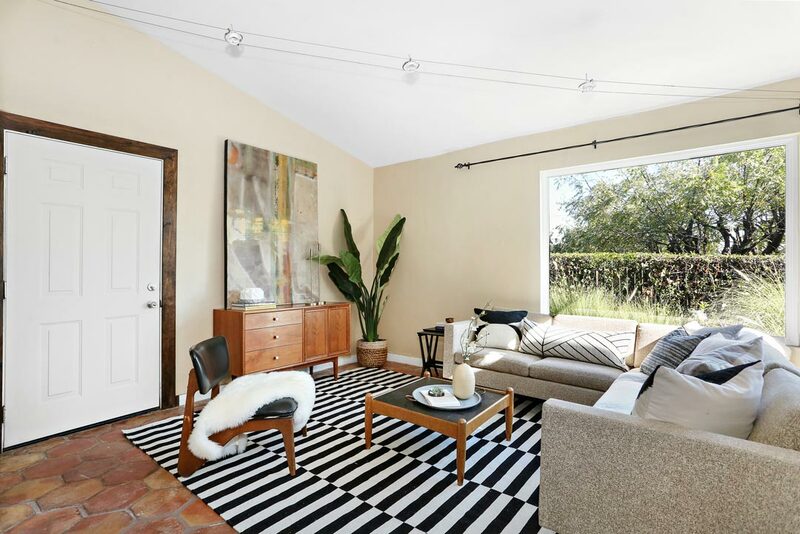 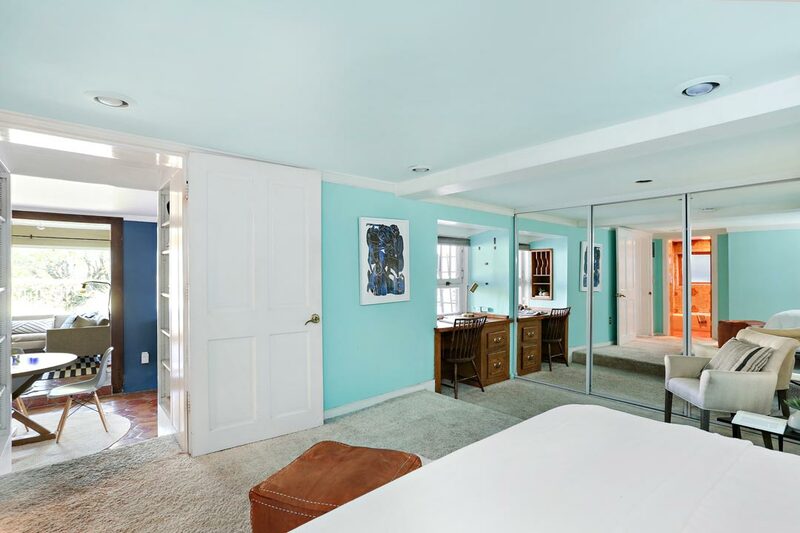 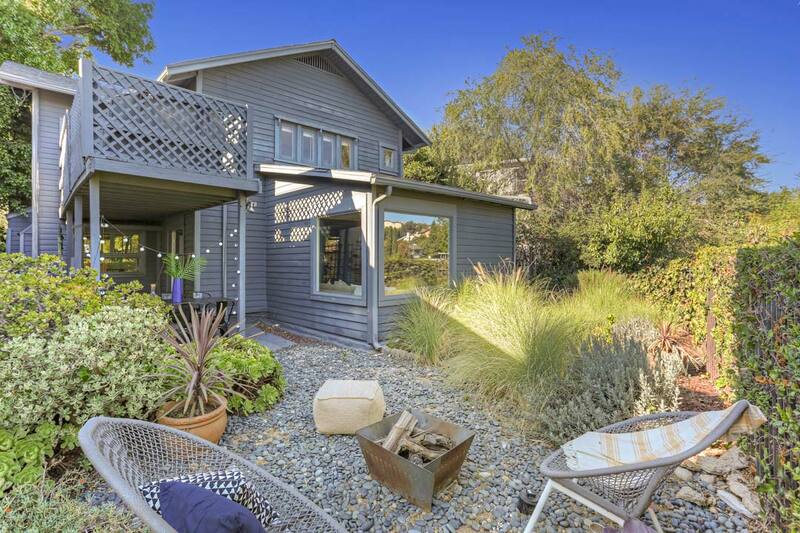 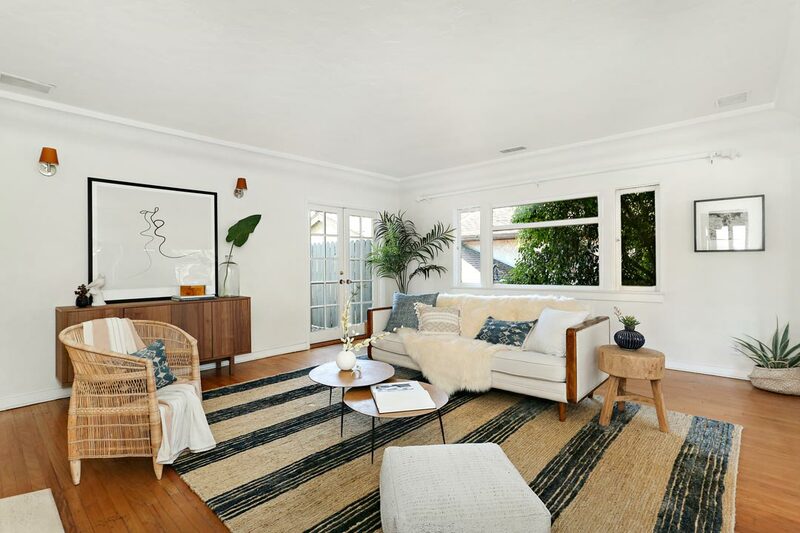 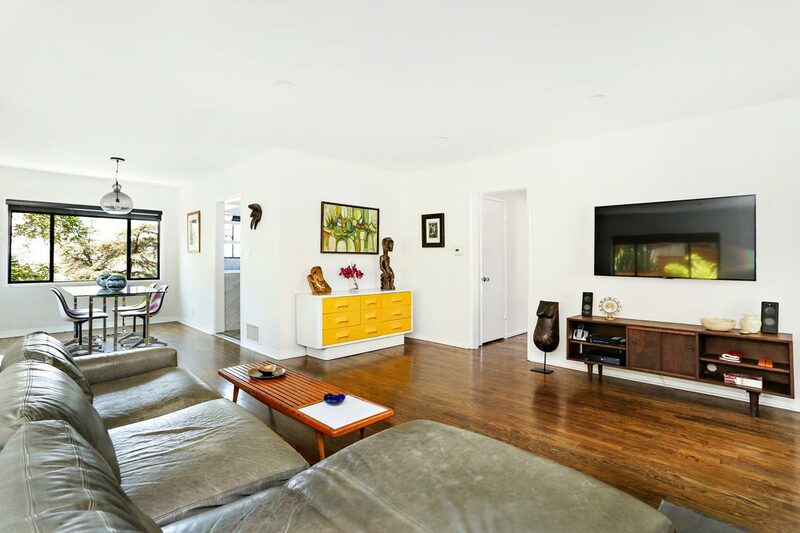 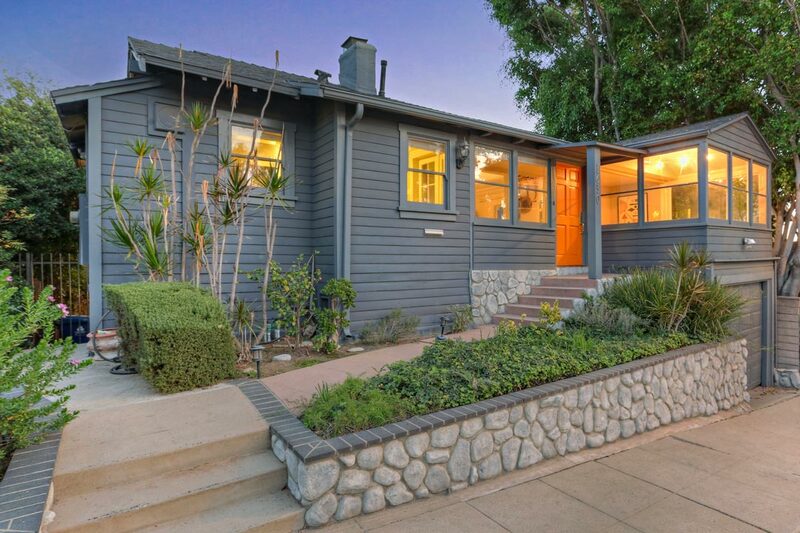 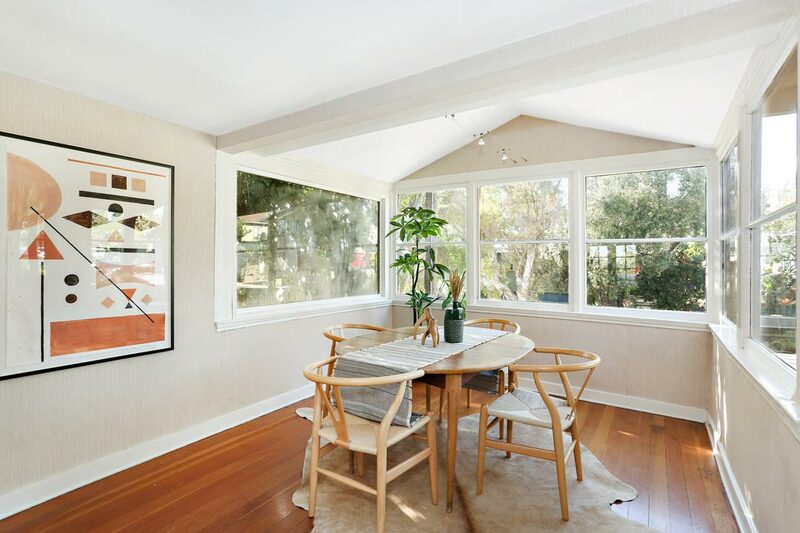 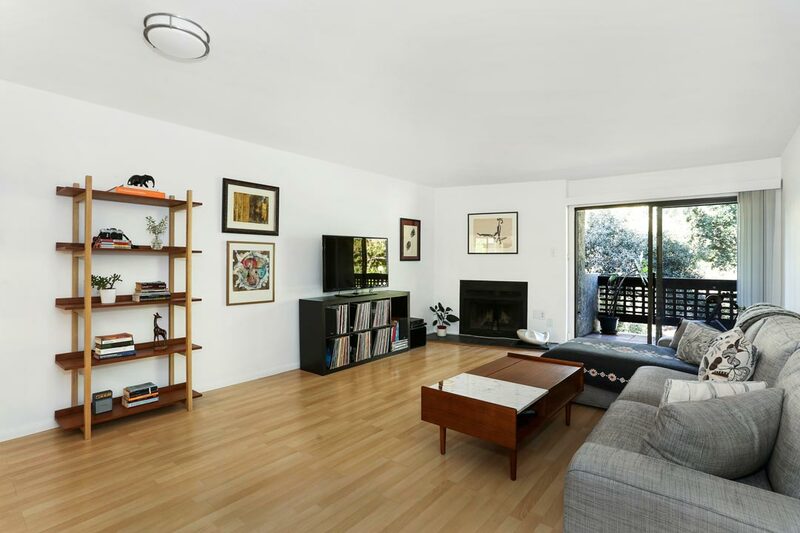 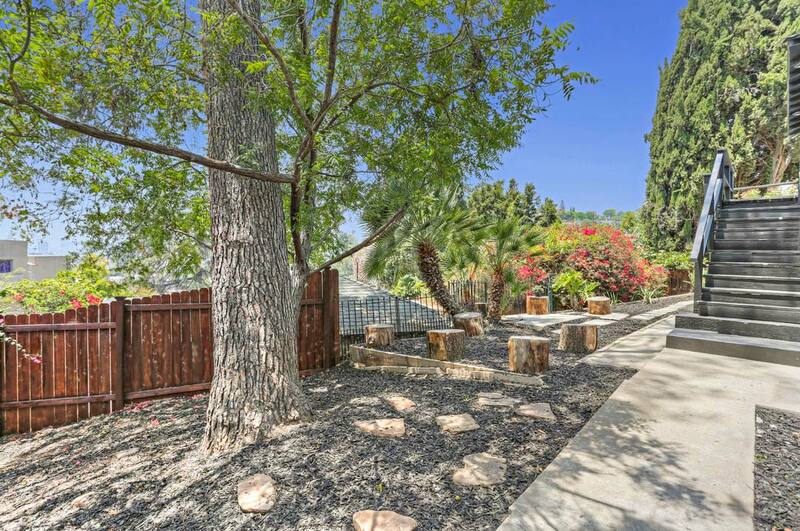 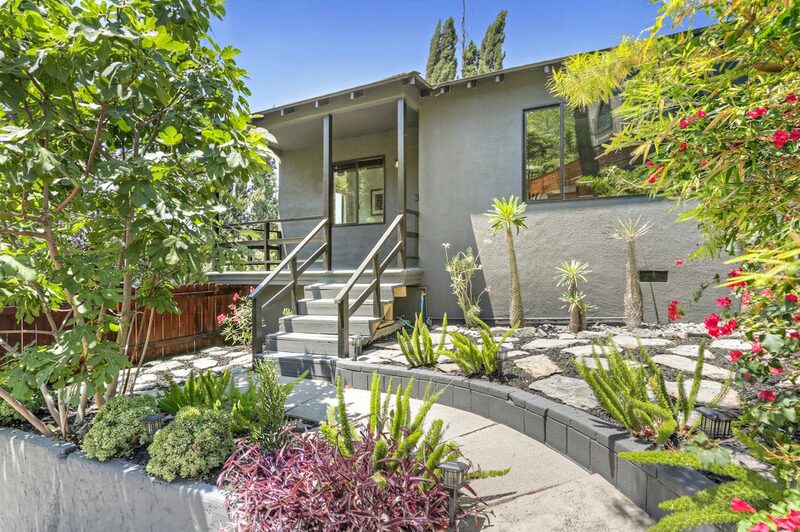 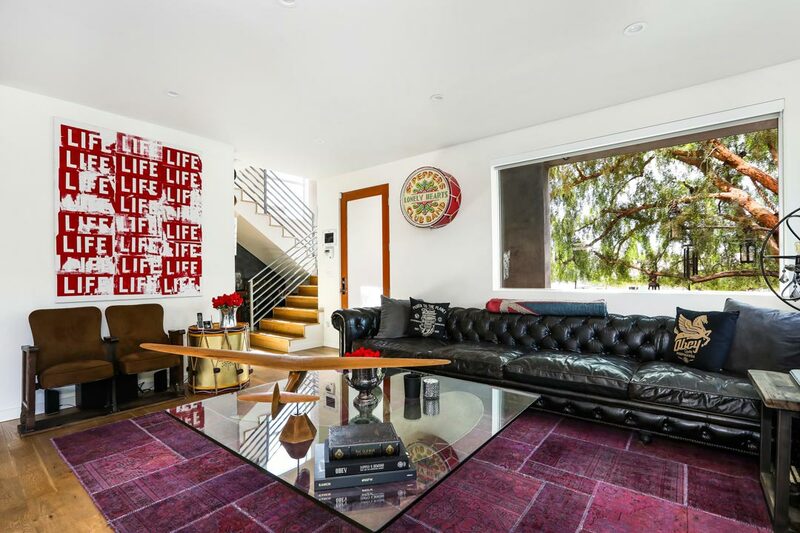 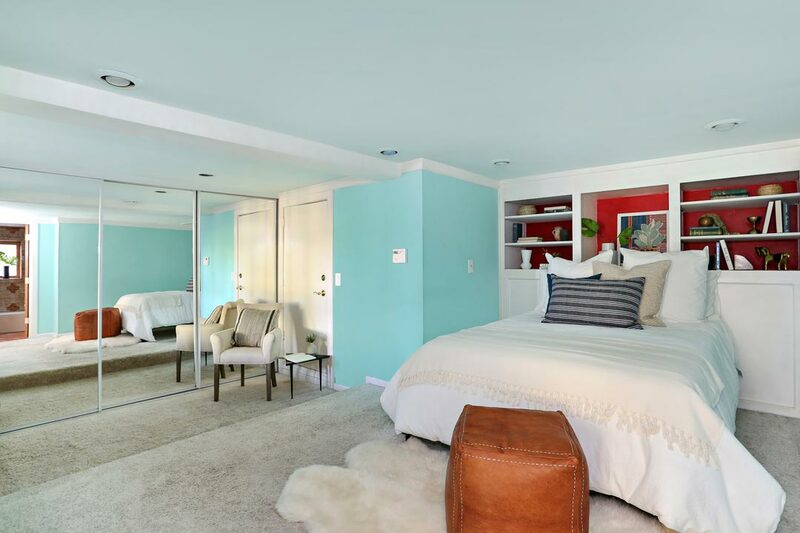 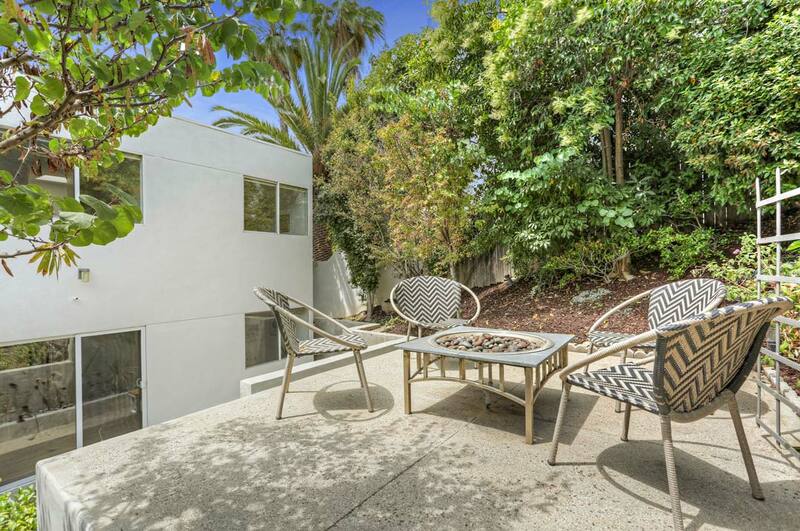 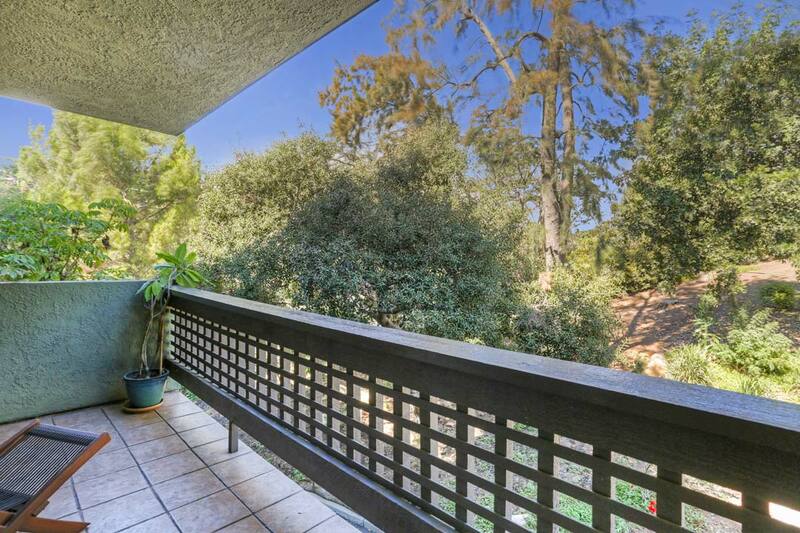 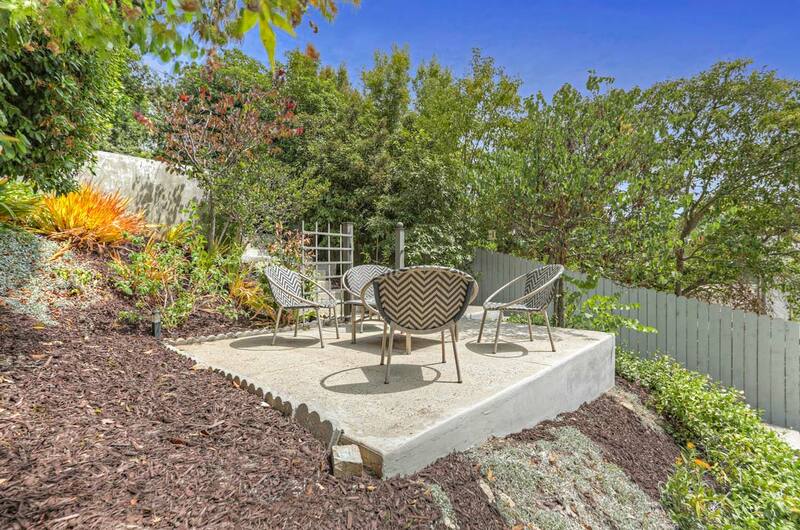 A stylish mid-century residence in the coveted Ivanhoe School District. 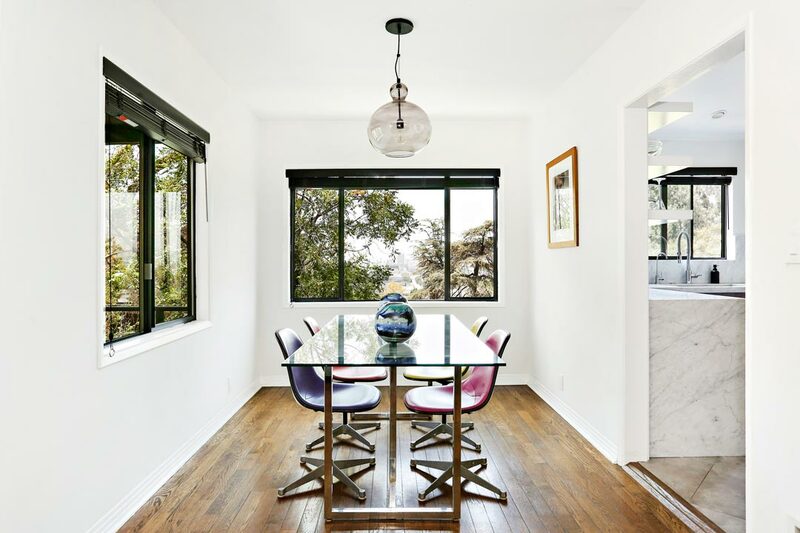 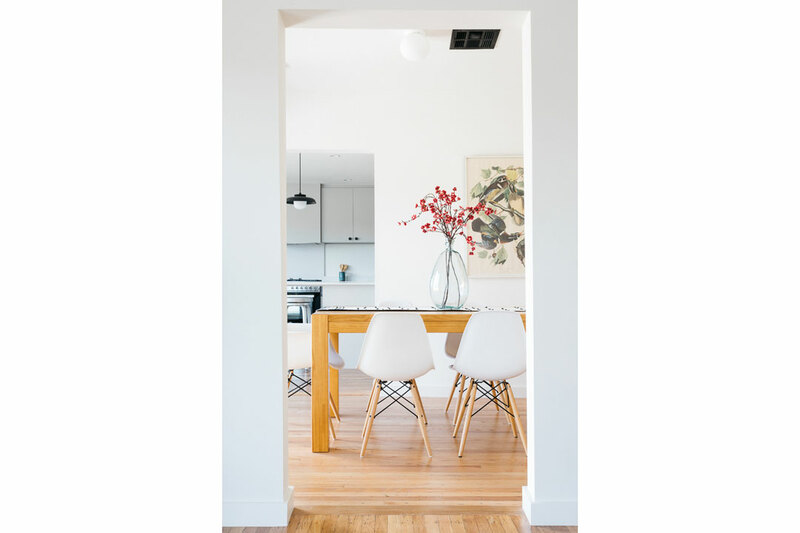 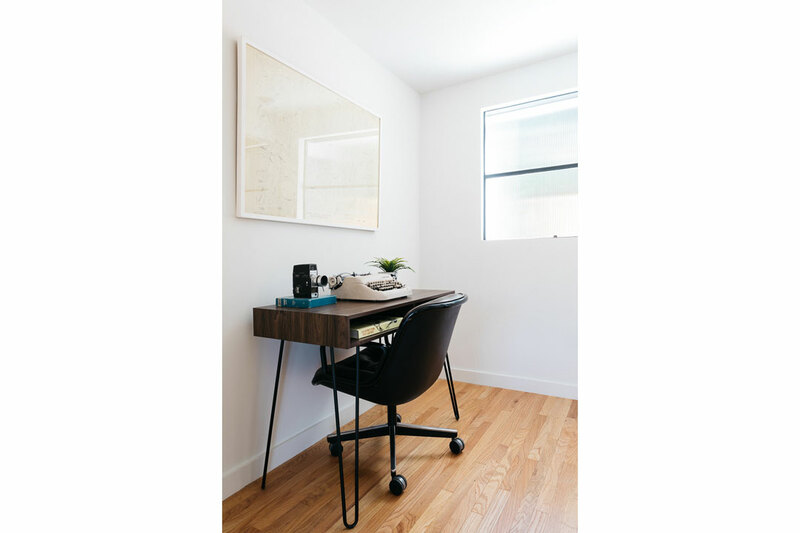 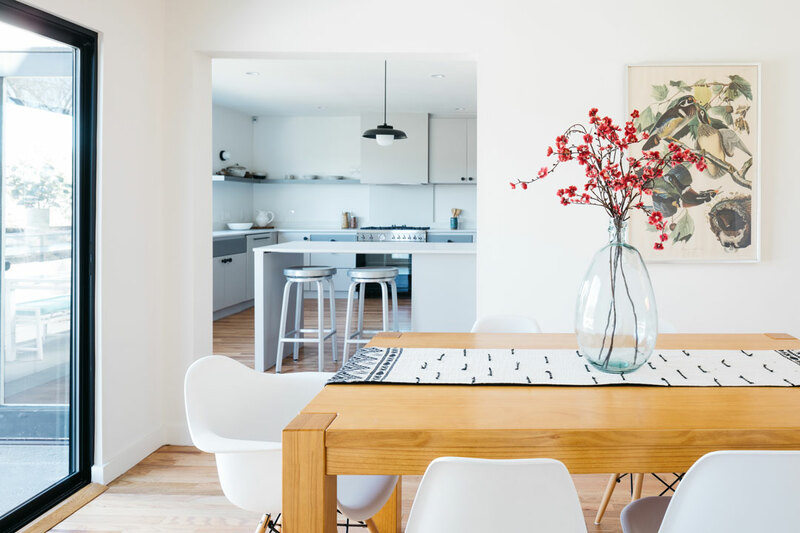 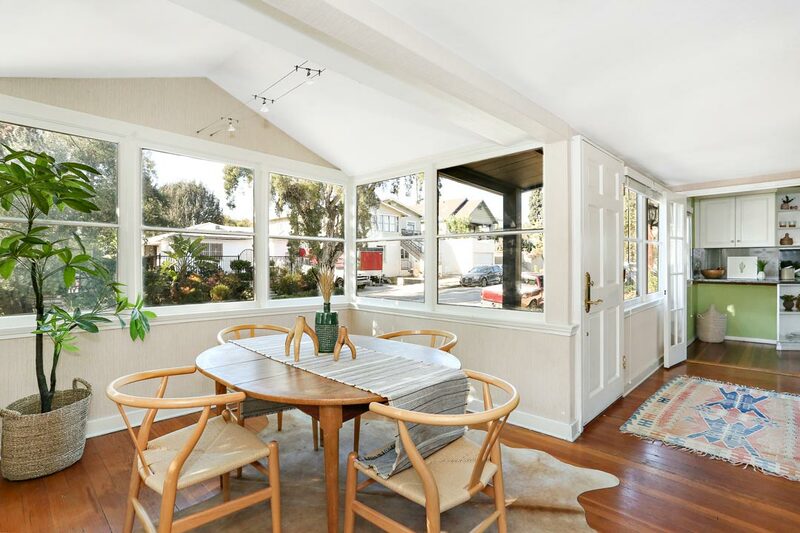 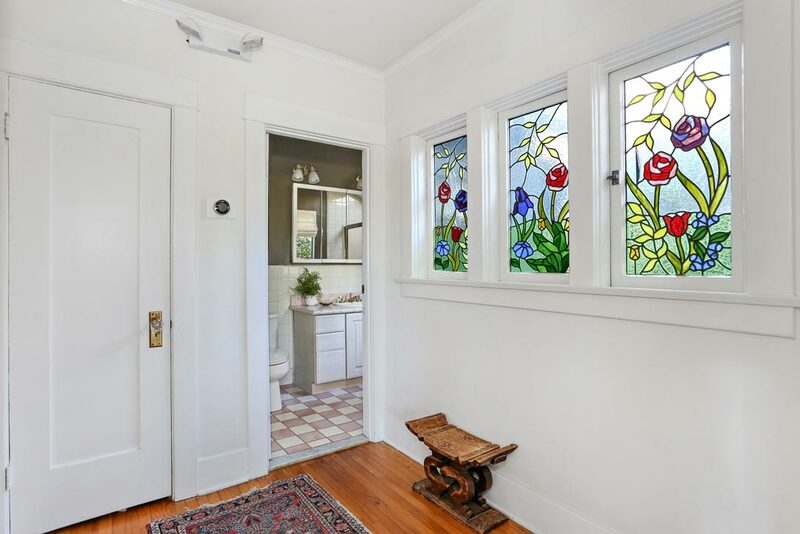 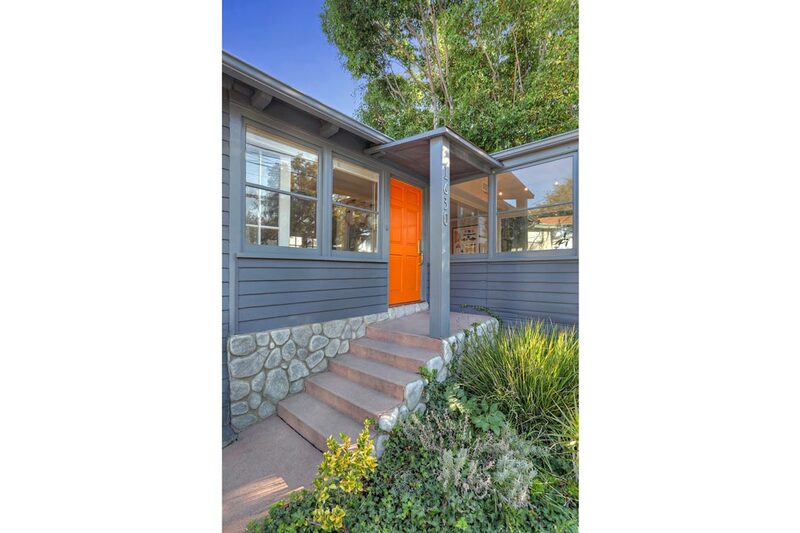 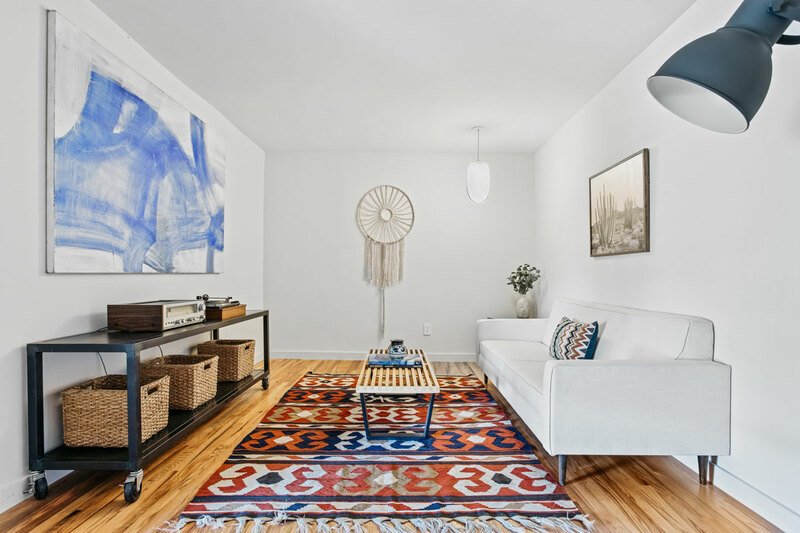 The home was built in 1954 and has been updated with style; heritage elements are in tact including a free-flowing layout, clean mid-century lines and beautiful wood floors. 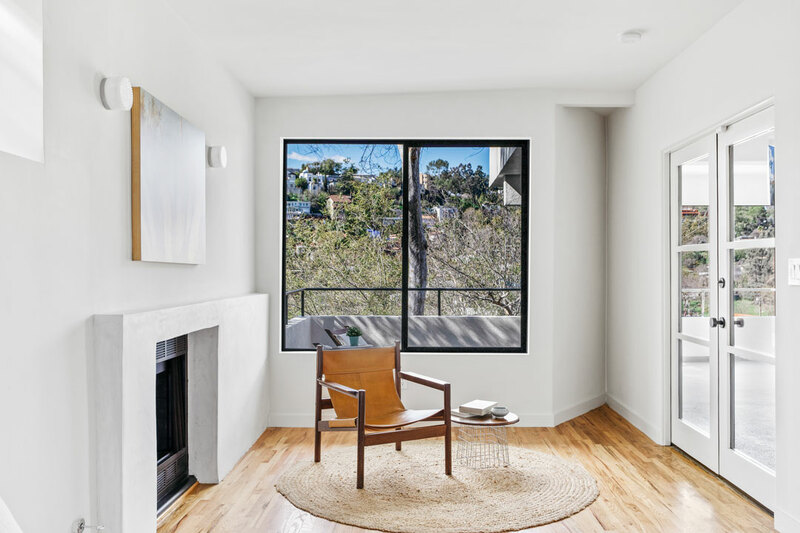 Large windows gather abundant sunlight and frame striking, far-reaching views. 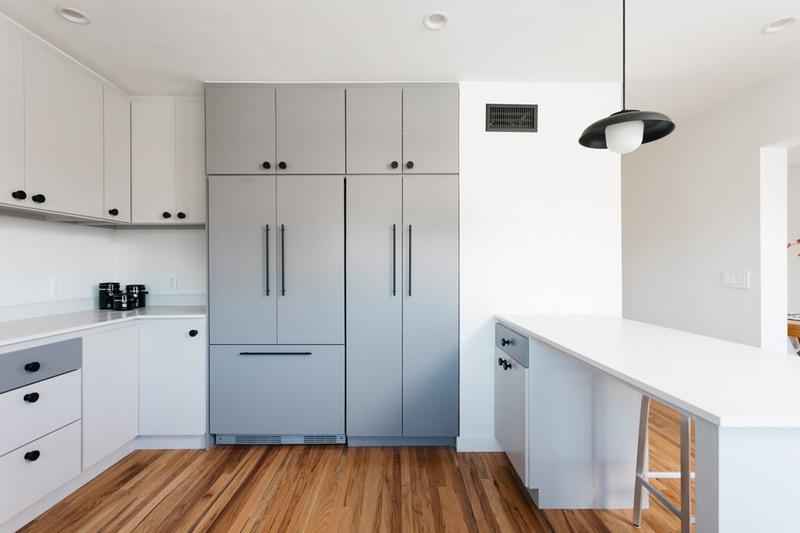 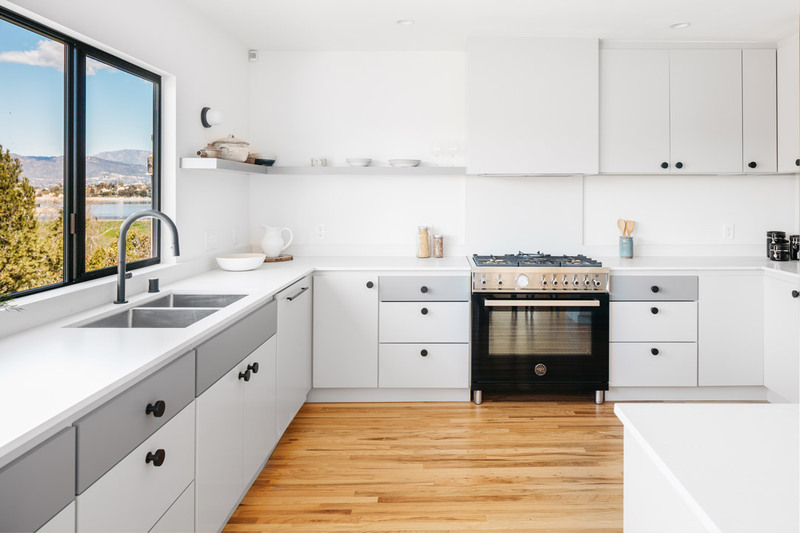 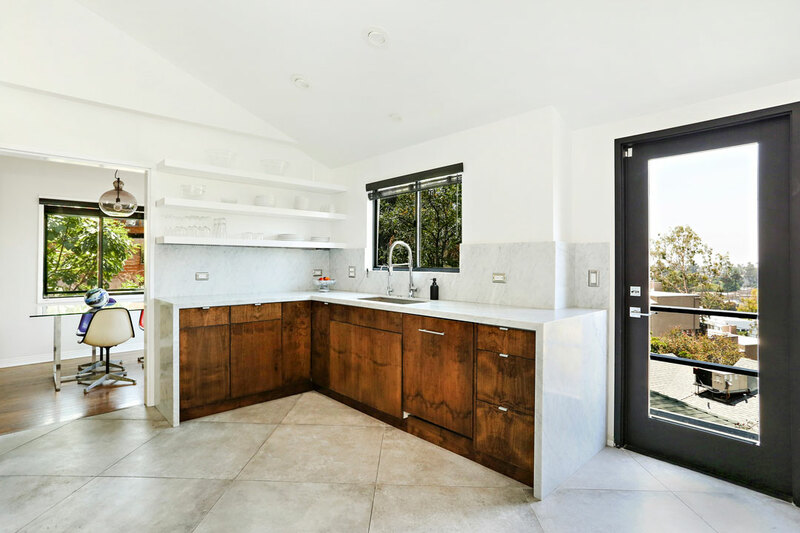 The kitchen impresses with Carrera marble countertops, polished concrete tile flooring and a Wolf + Subzero appliance suite that is paneled in wood to match the cabinetry. 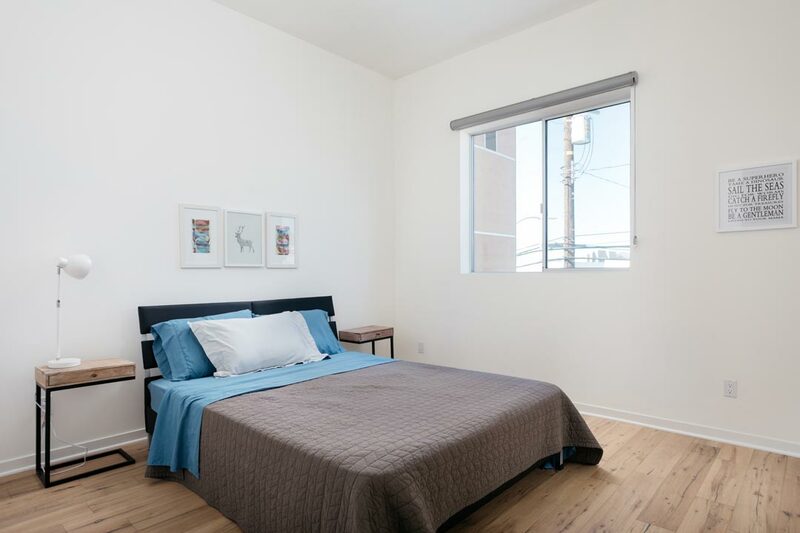 Two bedrooms include the en-suite Master featuring French doors opening to the outdoors. 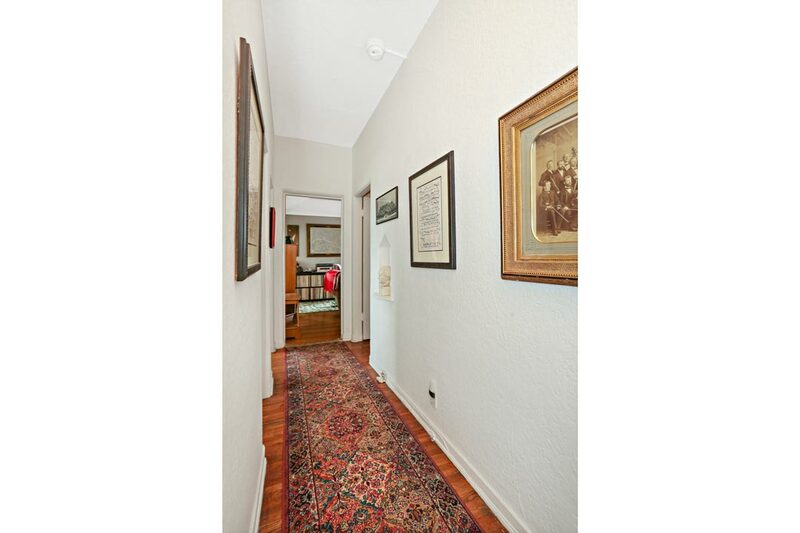 The large finished basement is perfect for your office, music studio or den. 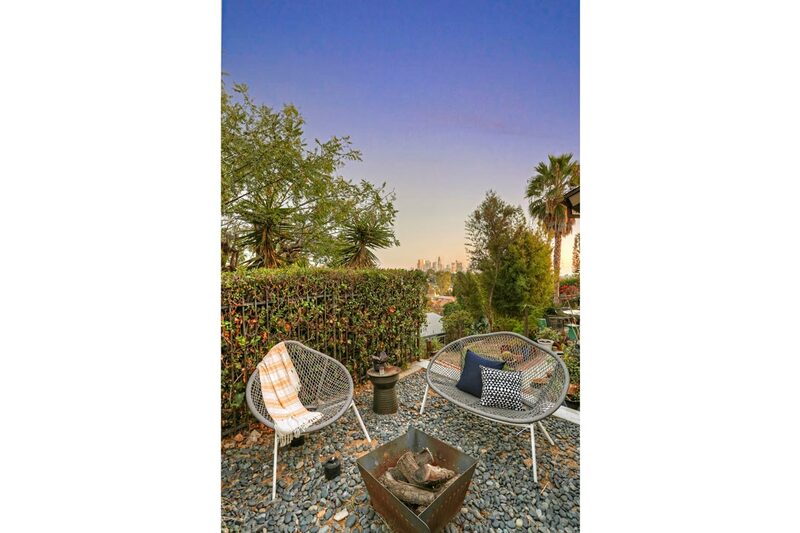 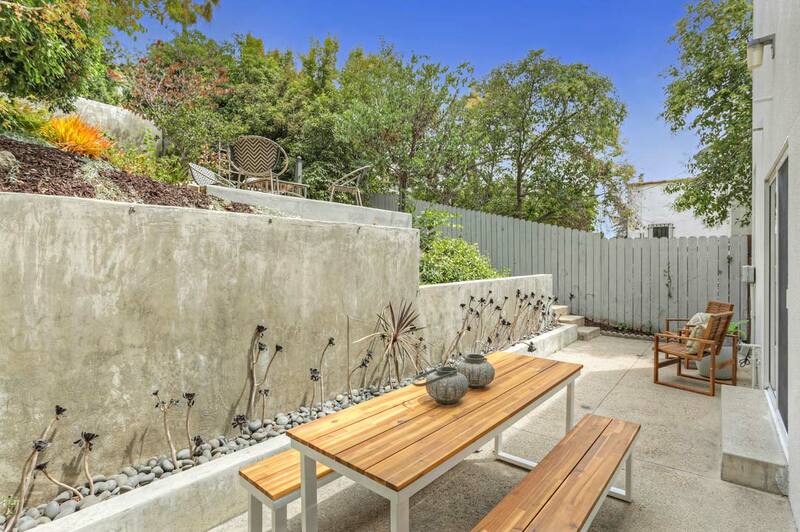 In the yard find multiple sitting areas for barbecues and entertaining against a backdrop of city lights and sunsets. 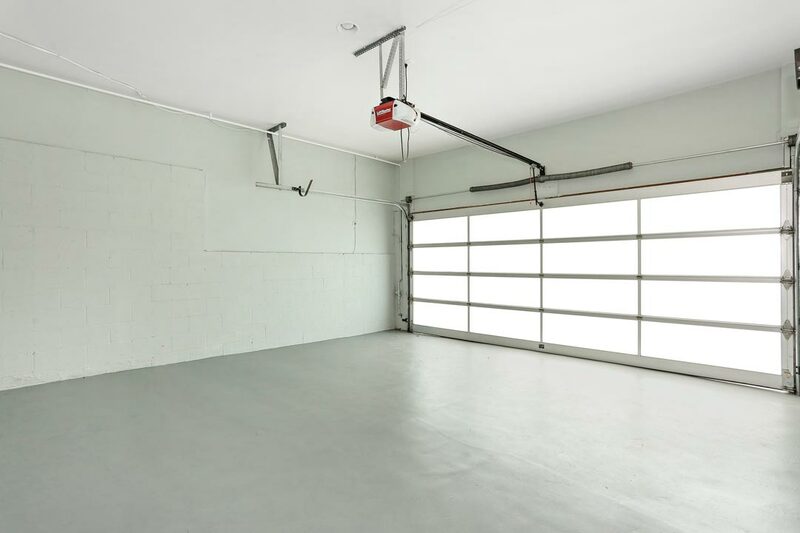 There is garage parking and central heat and a/c. 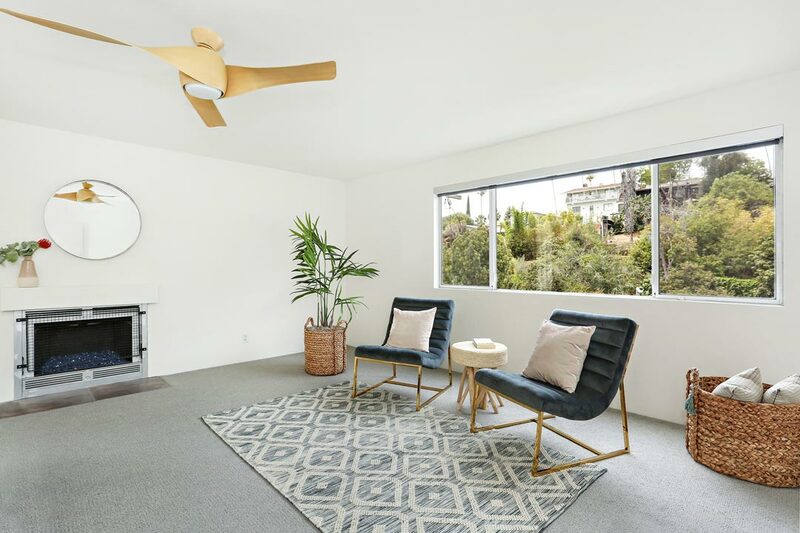 This choice location places you near Sunset Junction hot-spots including Intelligentsia, Pine & Crane, Café Stella, The Black Cat, Silver Lake Farmers Market and more. 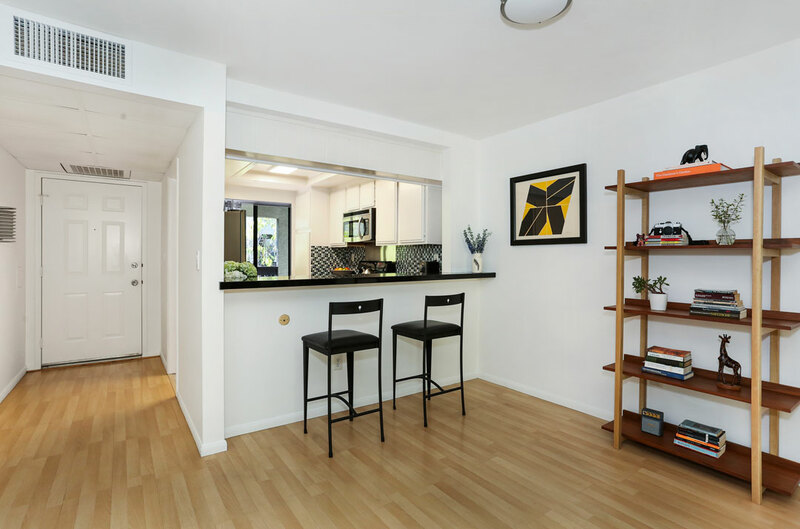 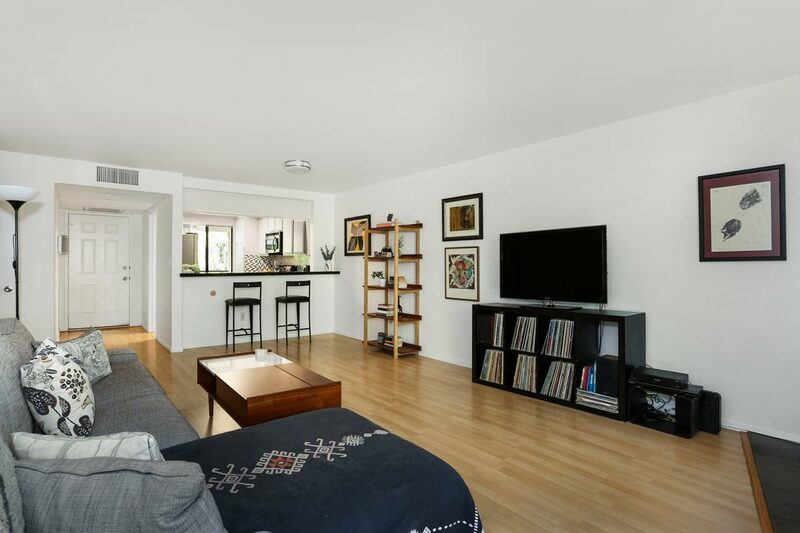 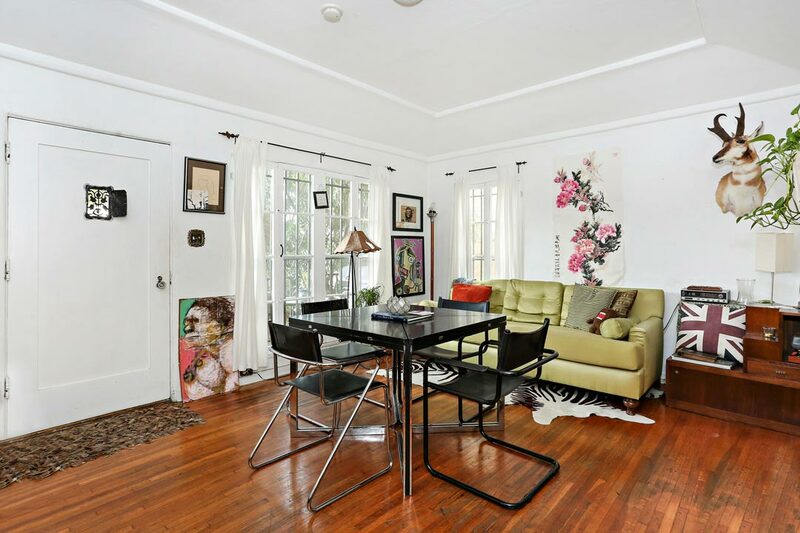 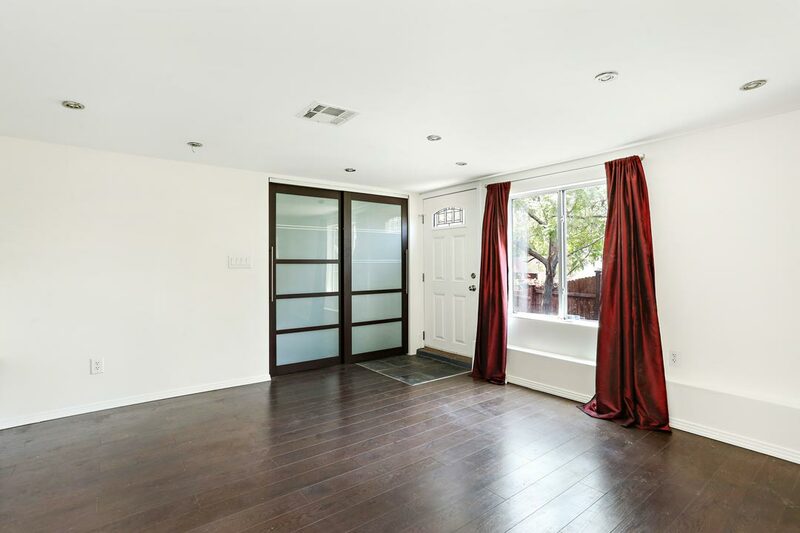 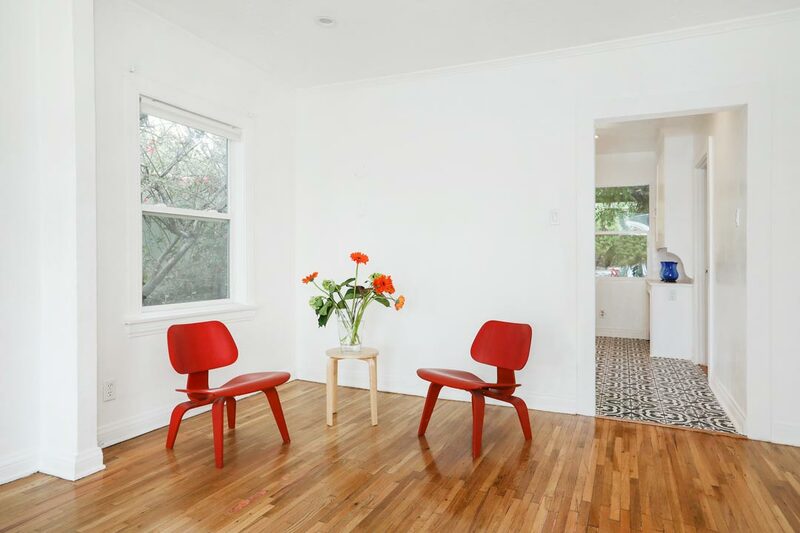 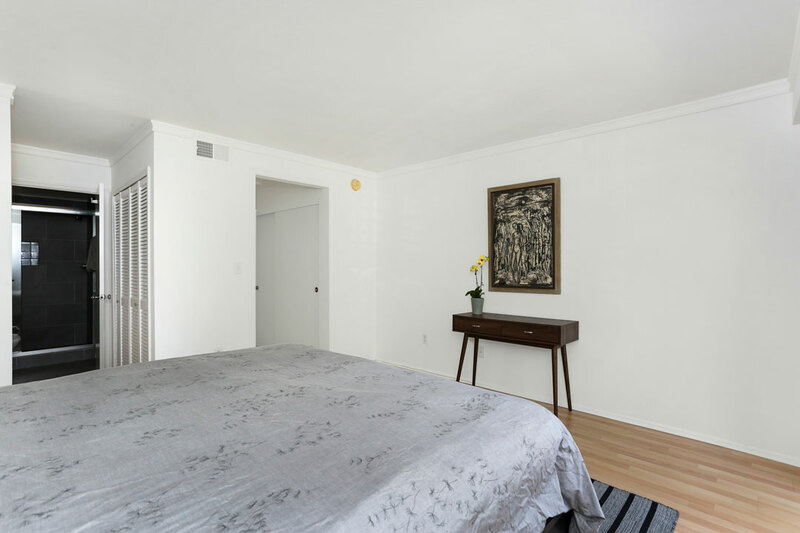 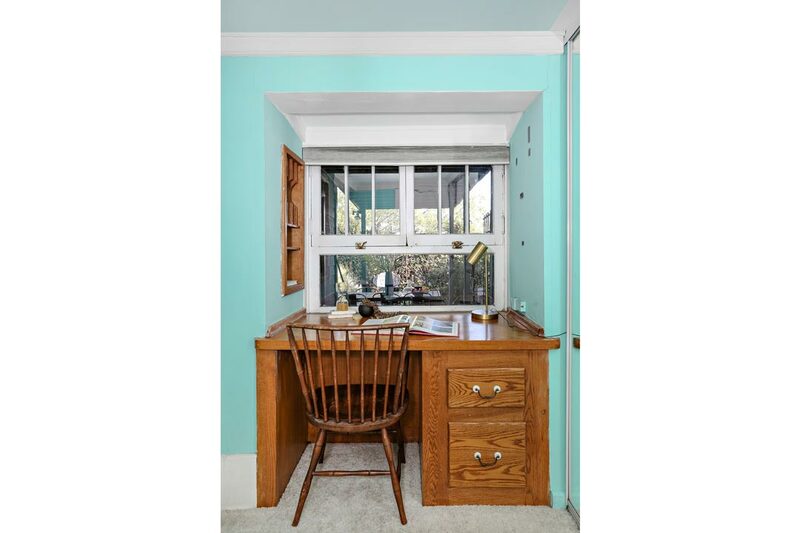 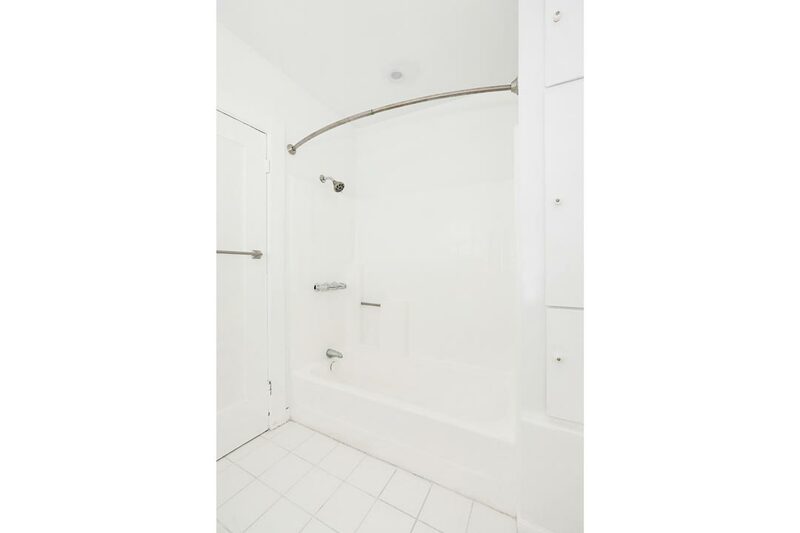 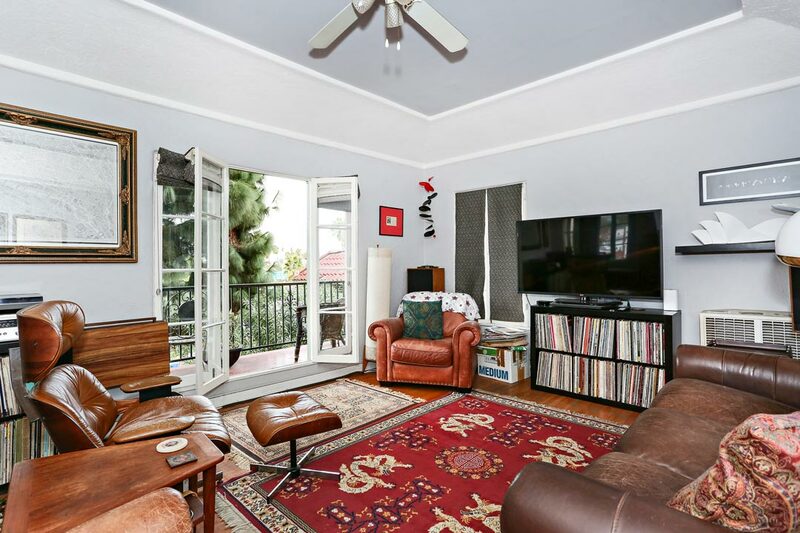 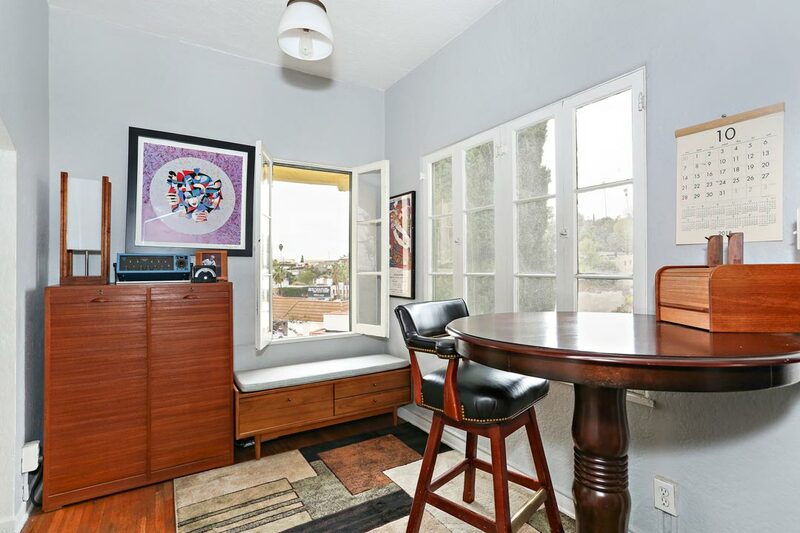 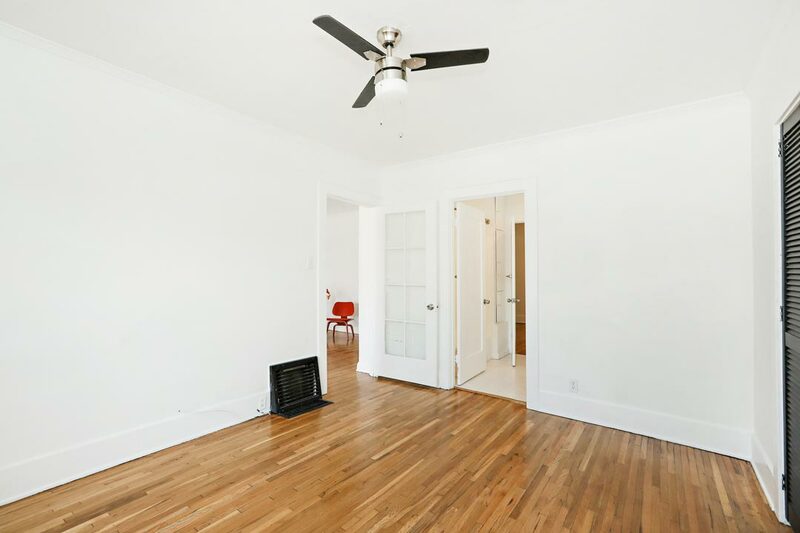 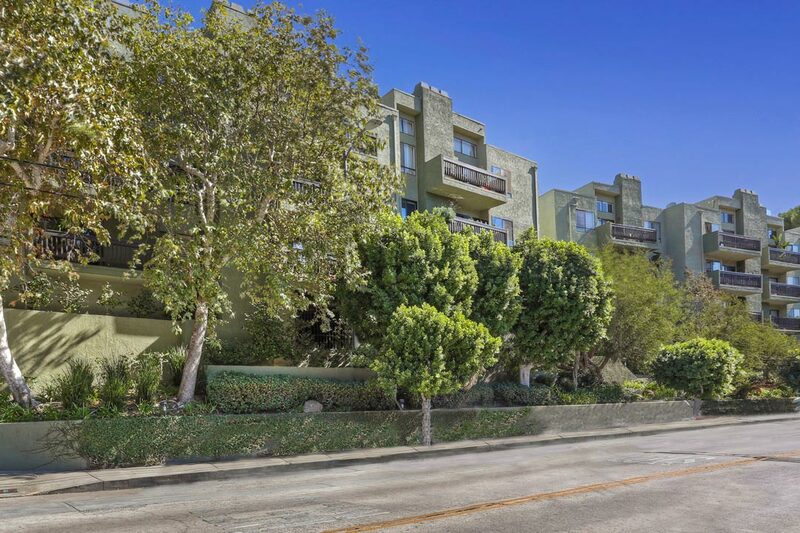 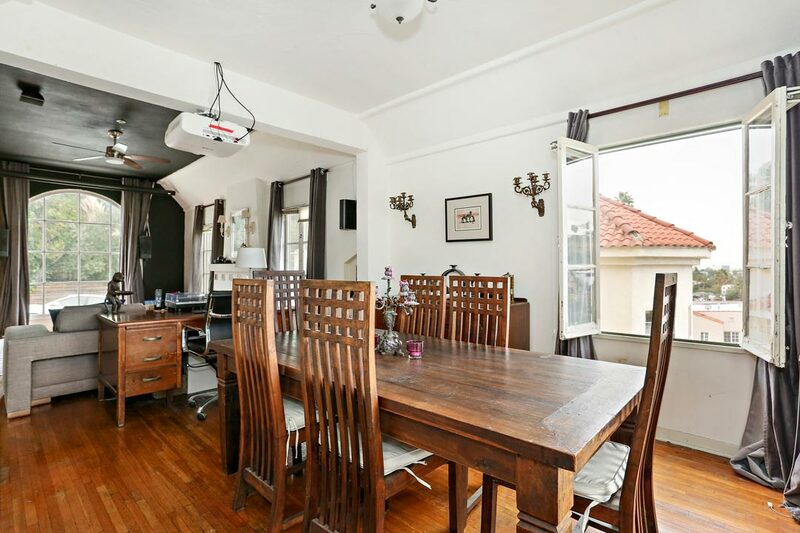 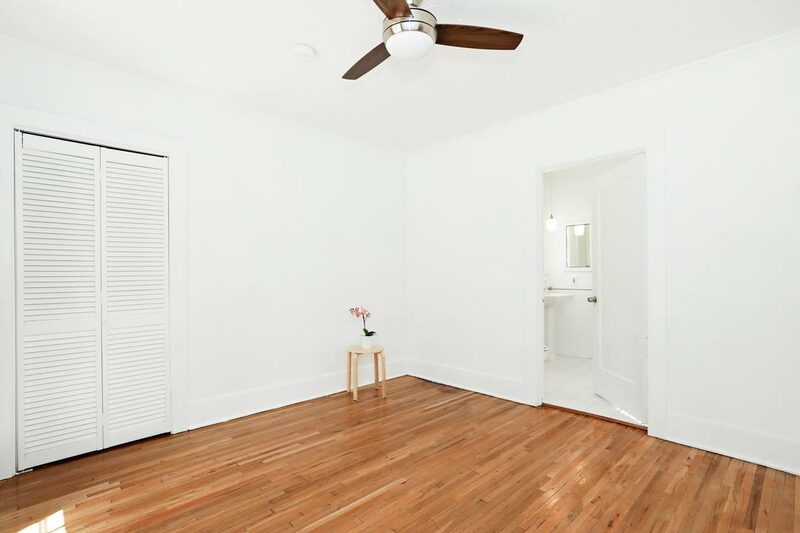 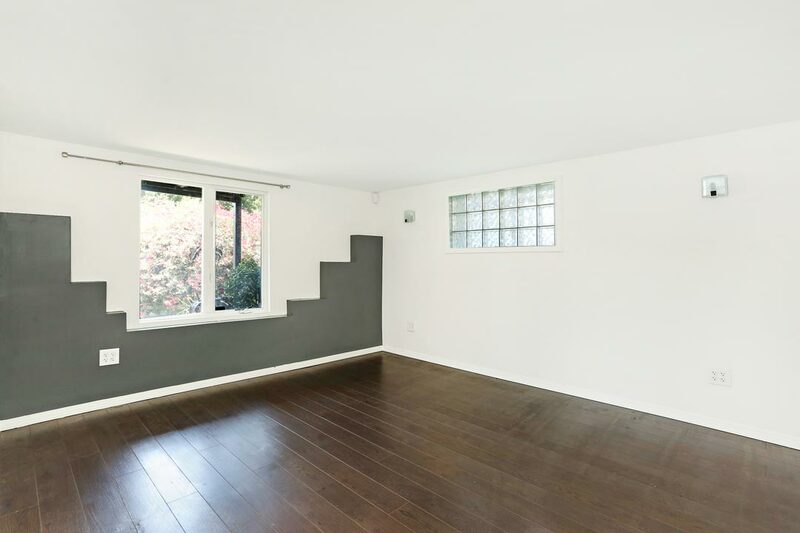 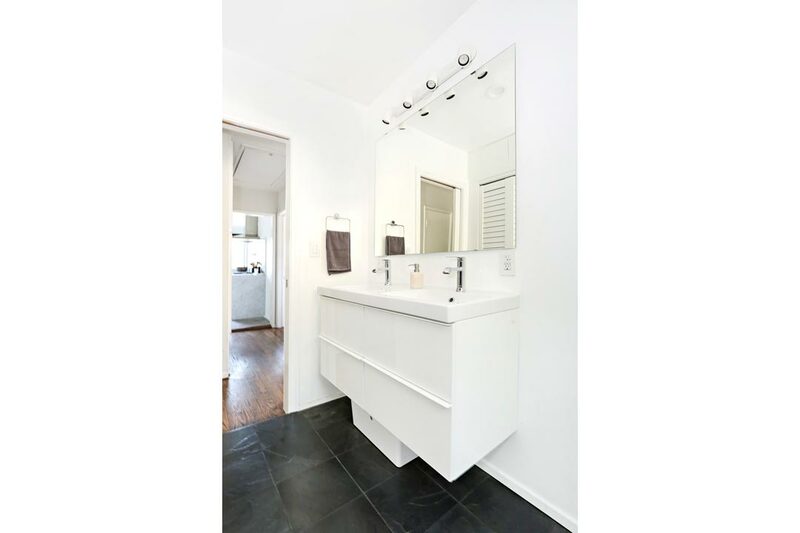 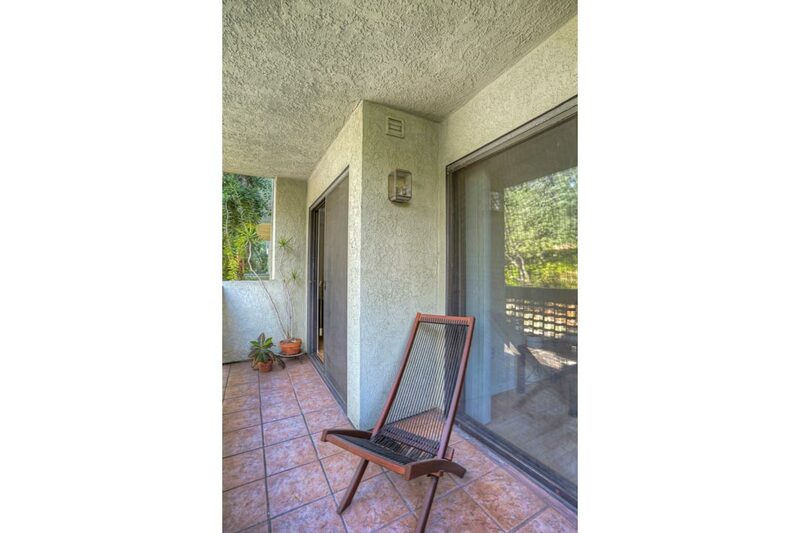 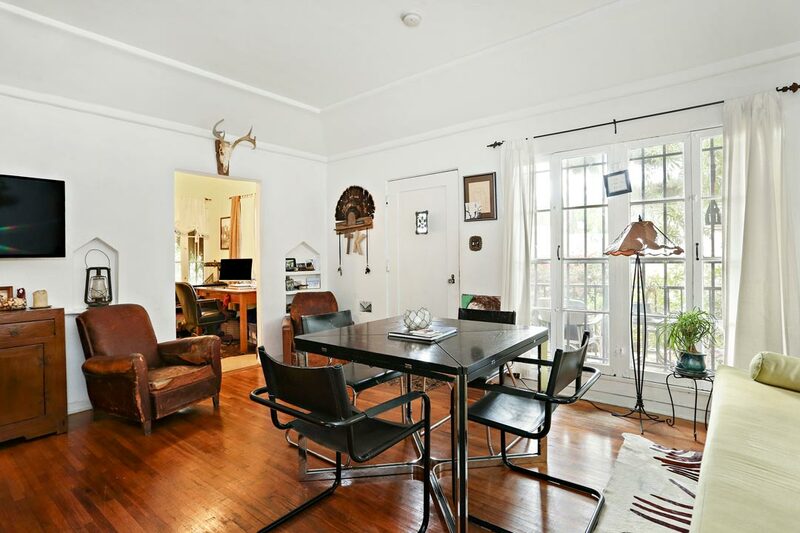 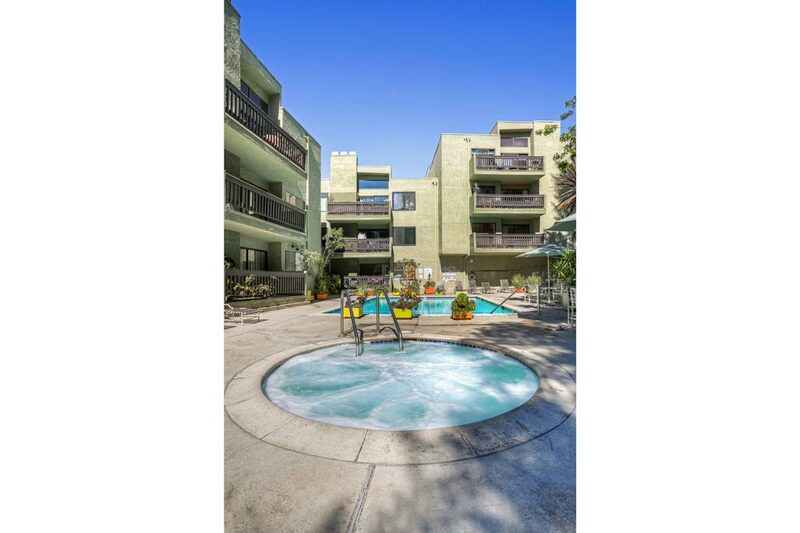 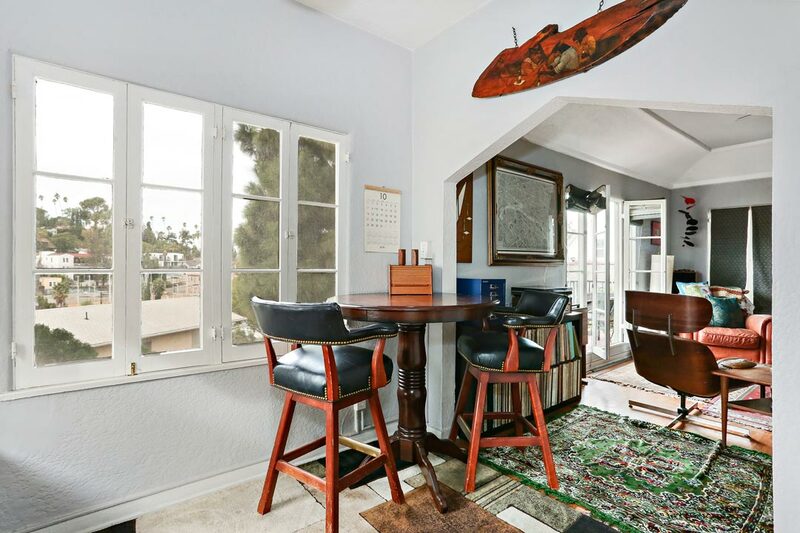 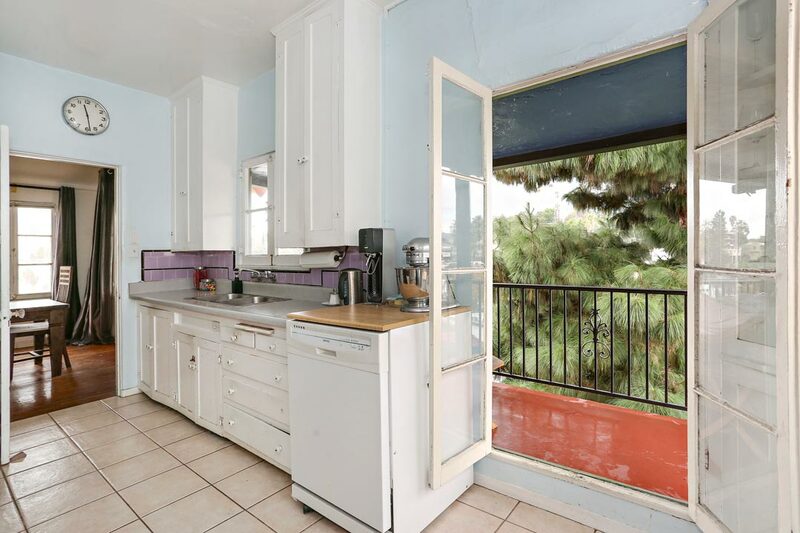 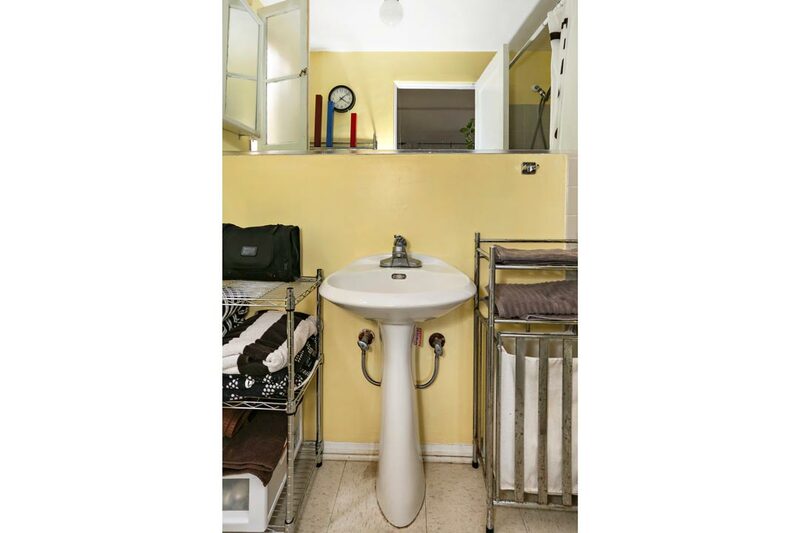 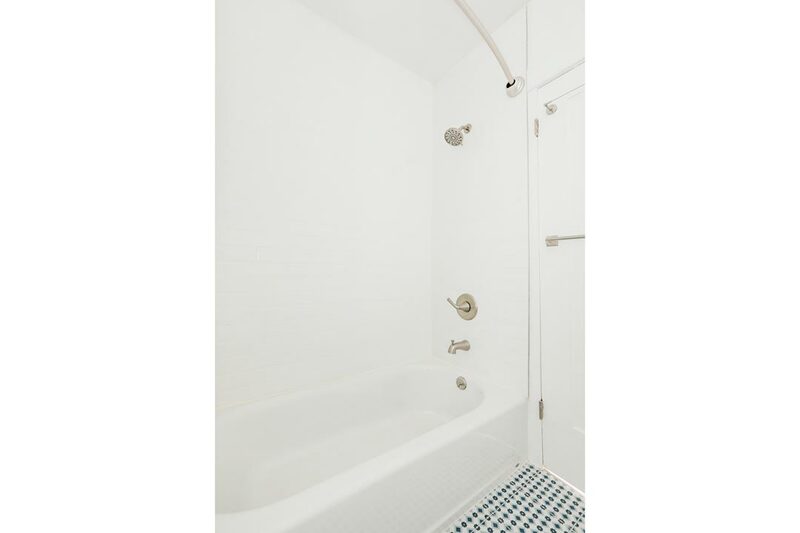 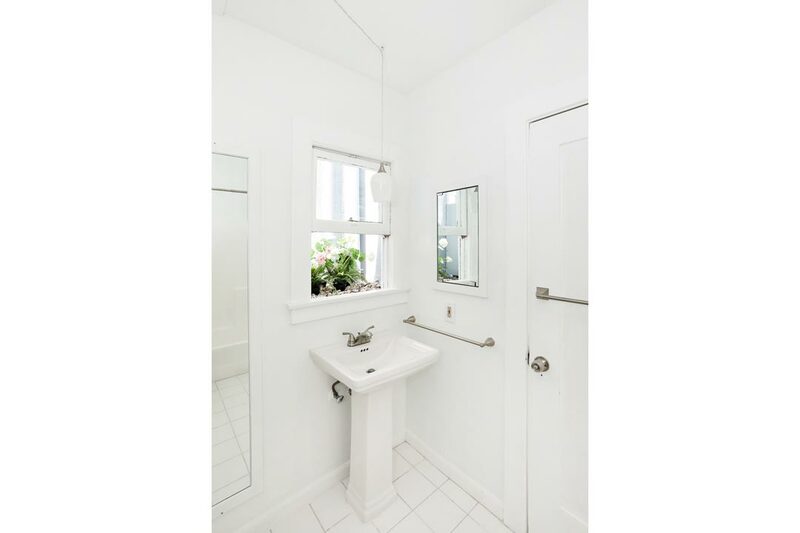 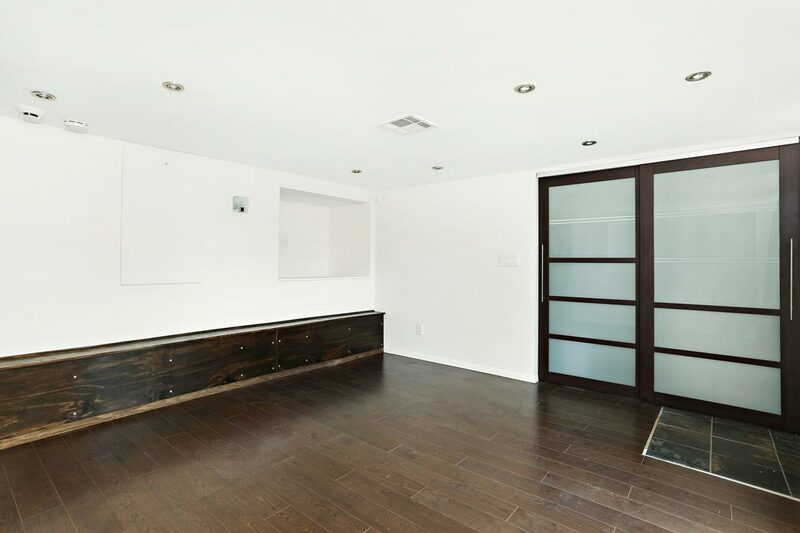 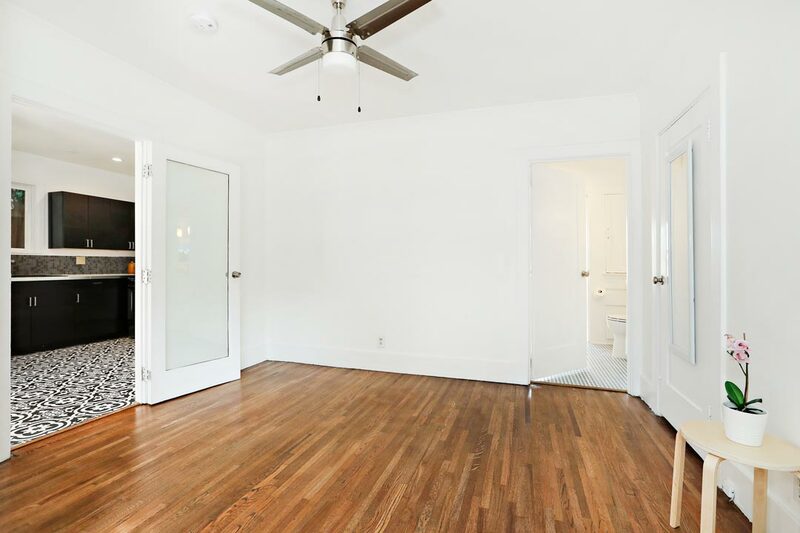 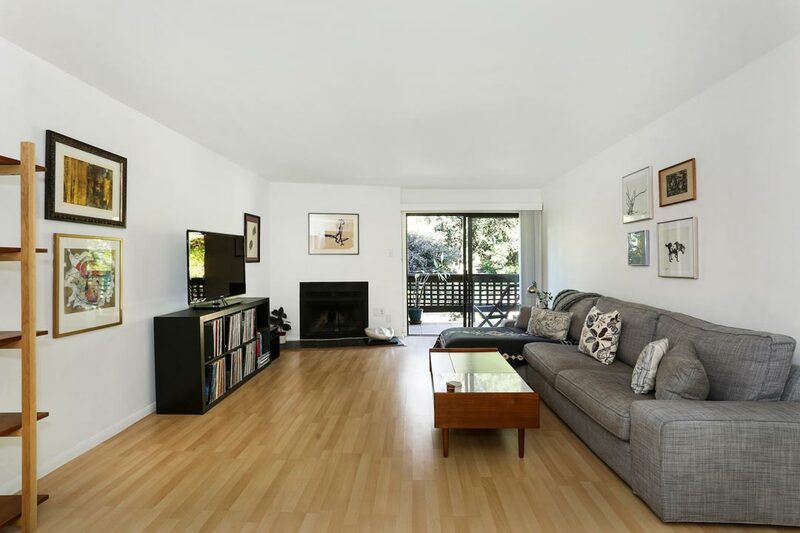 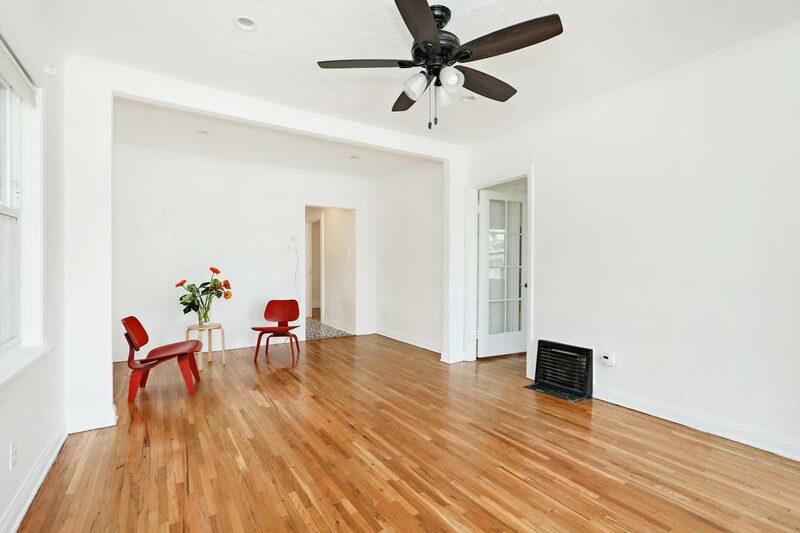 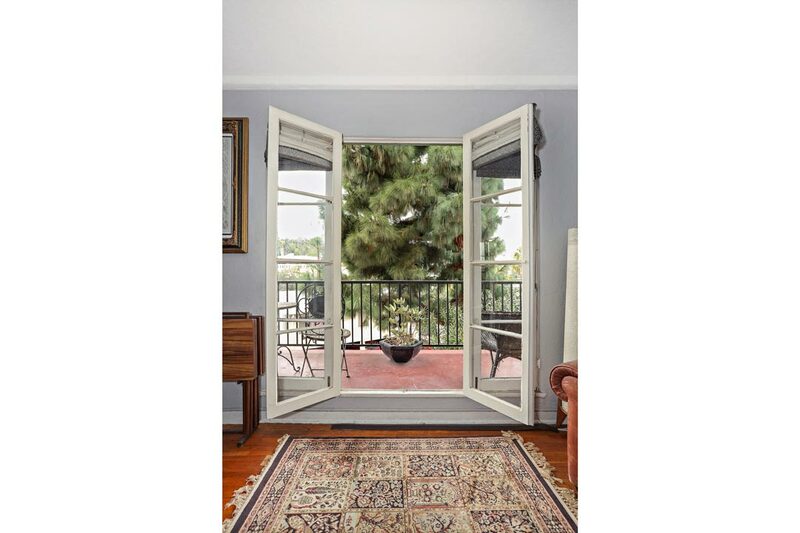 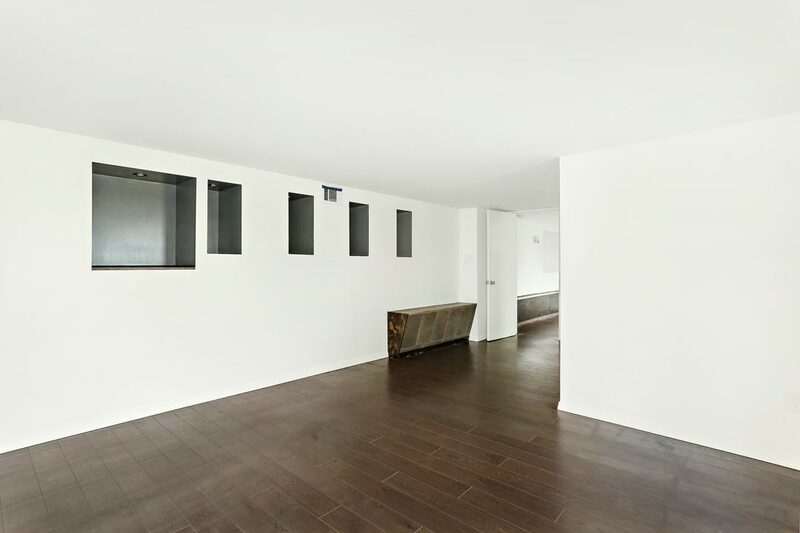 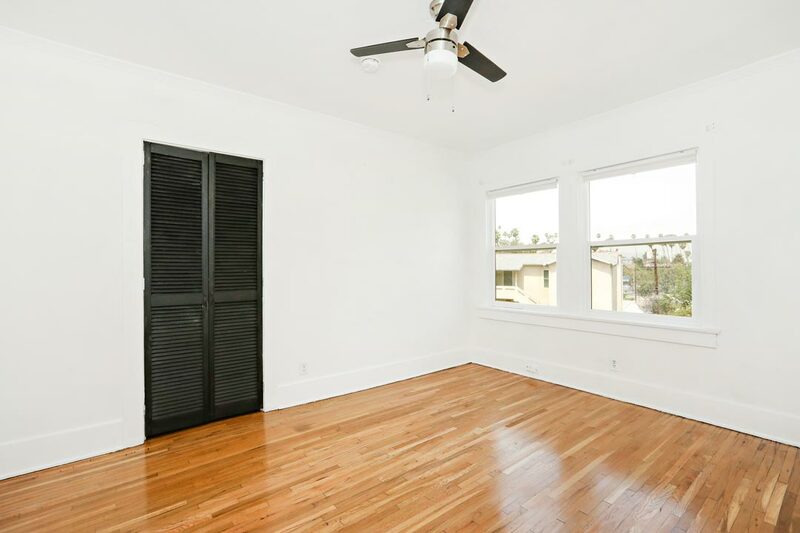 Available for lease: A spacious two-bedroom apartment in a great Silver Lake location. 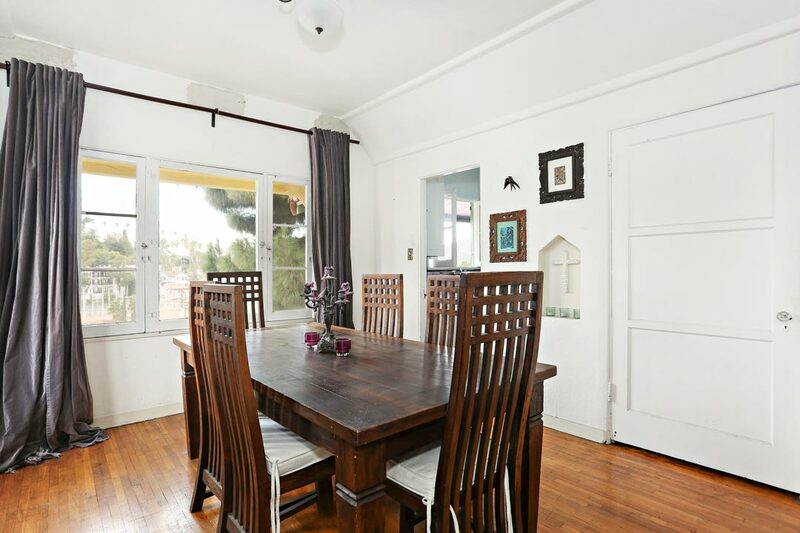 The large living room and dining area has character details including beautiful wood flooring, decorative moulding and large windows framing far-reaching vistas. 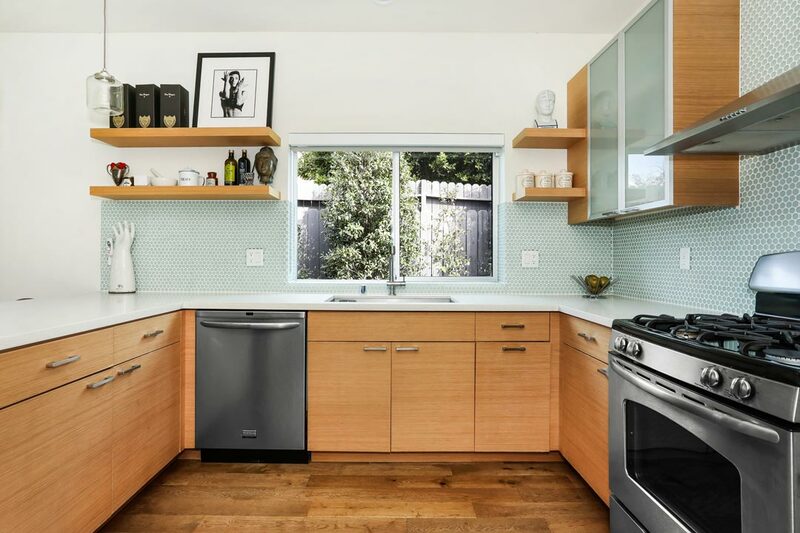 The kitchen is well appointed and newly updated. 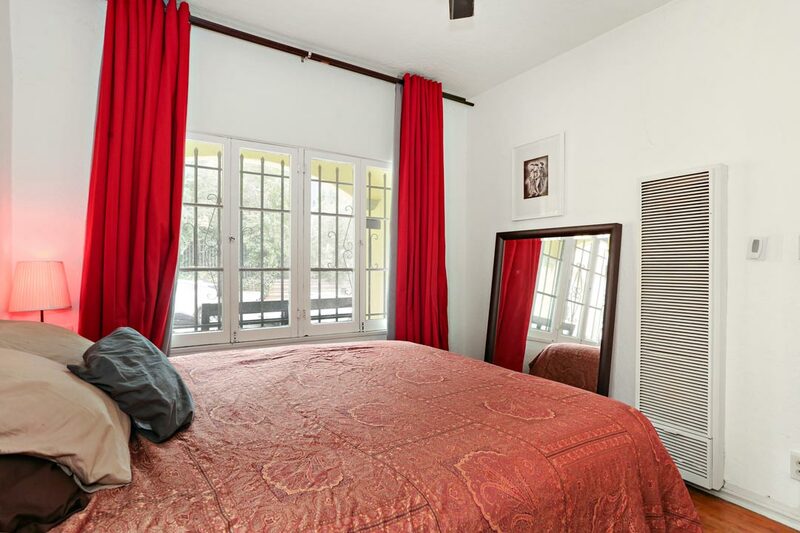 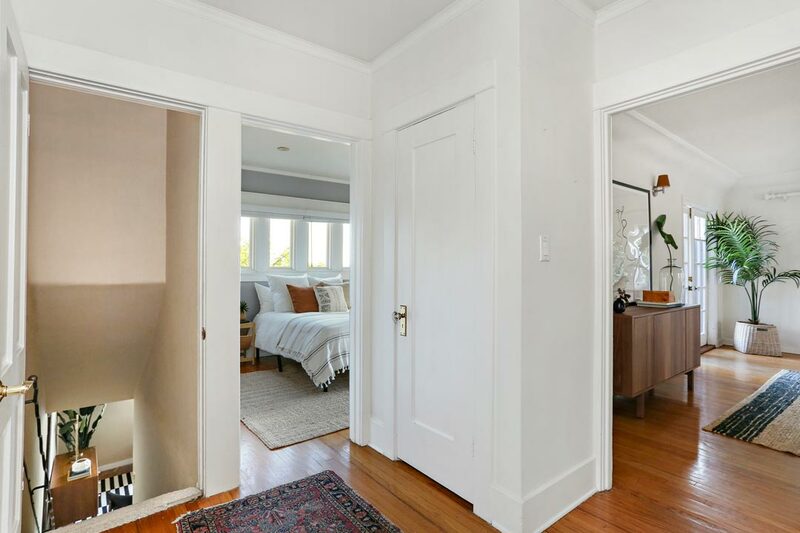 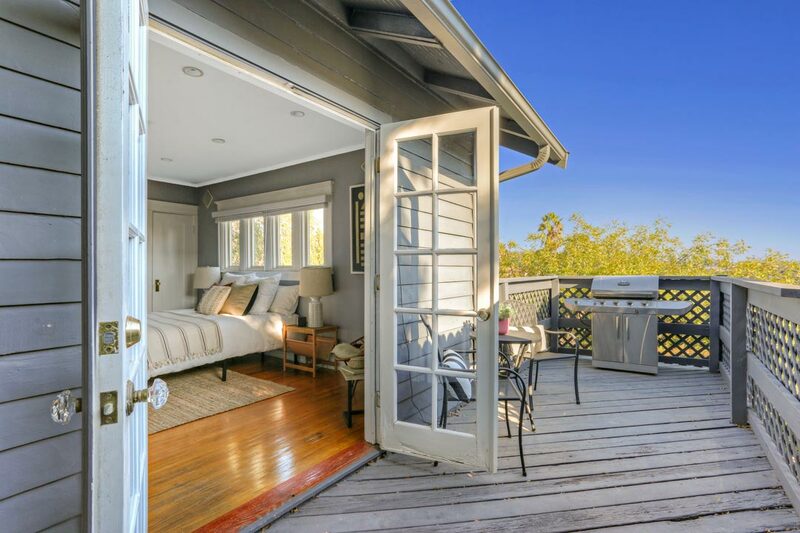 Both bedrooms provide closet space and one has French doors opening to the patio, your perfect spot for morning coffee. 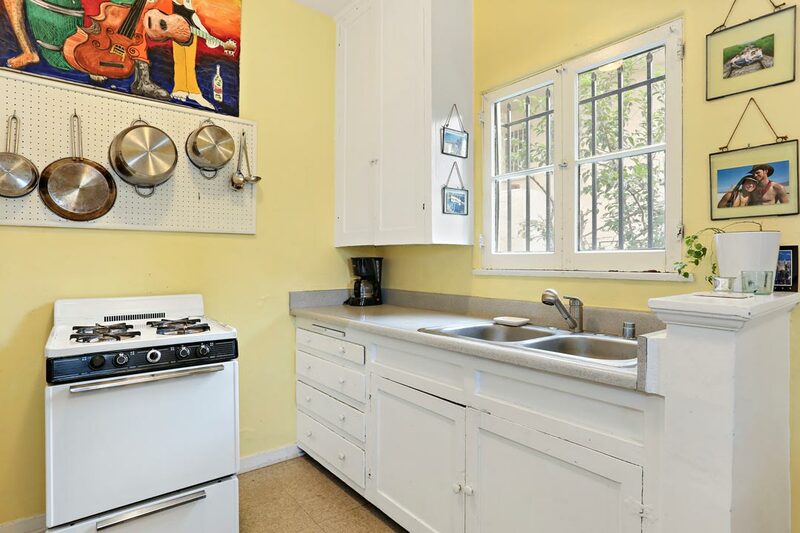 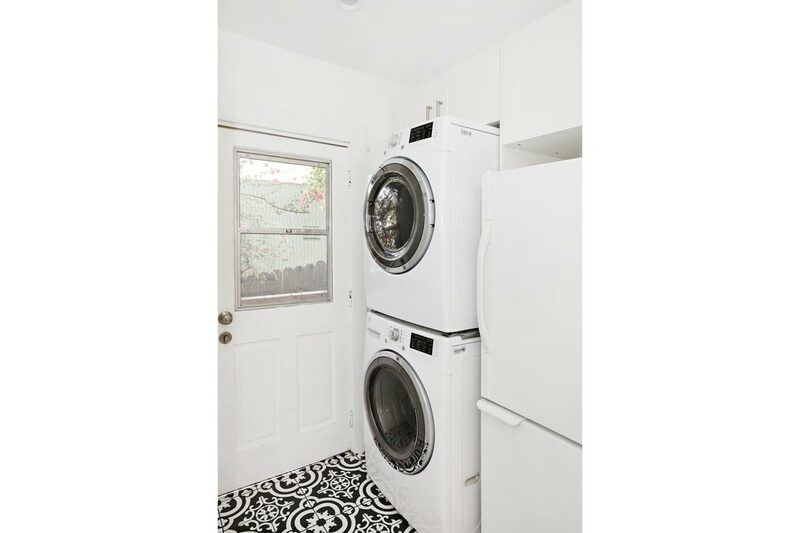 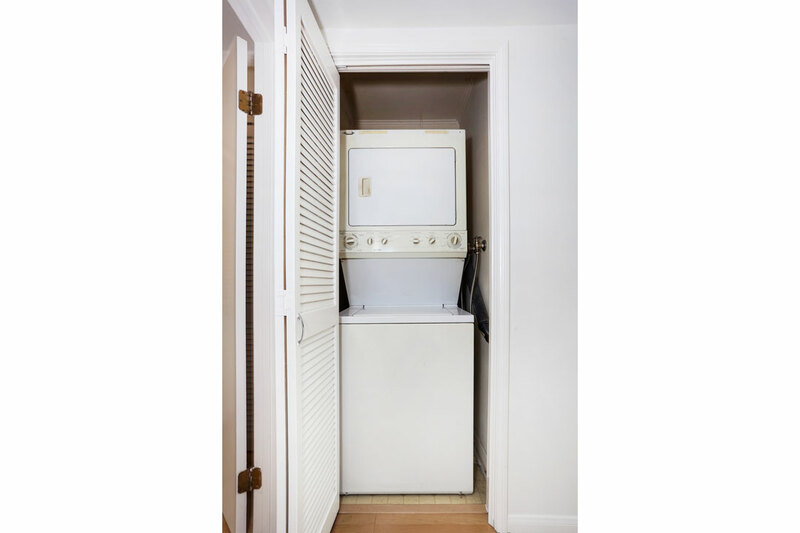 Amenities include air conditioning, washer+dryer, gas range and a designated off-street parking space. 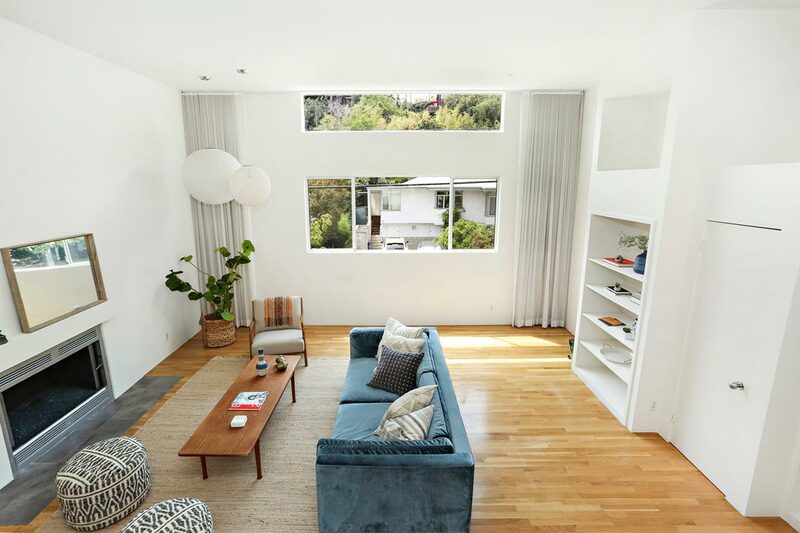 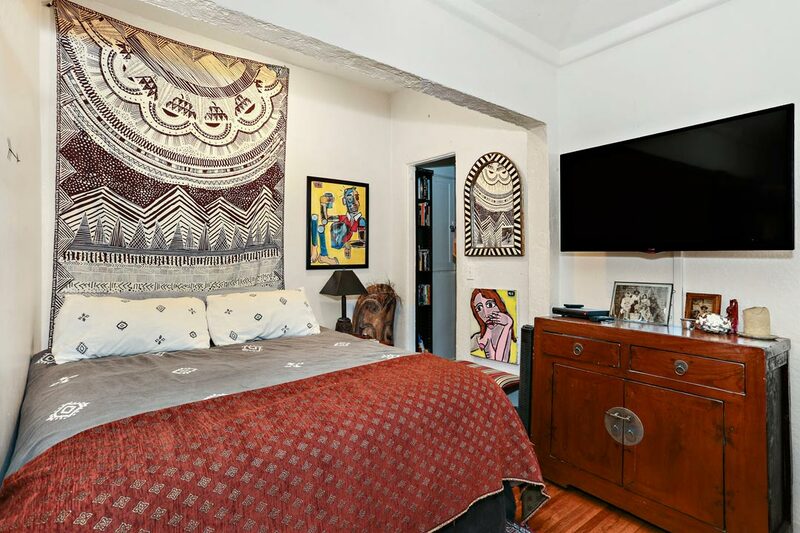 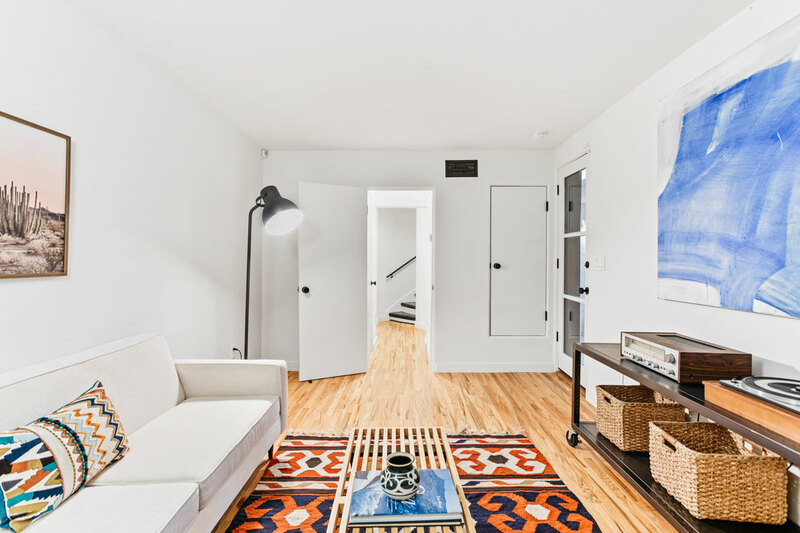 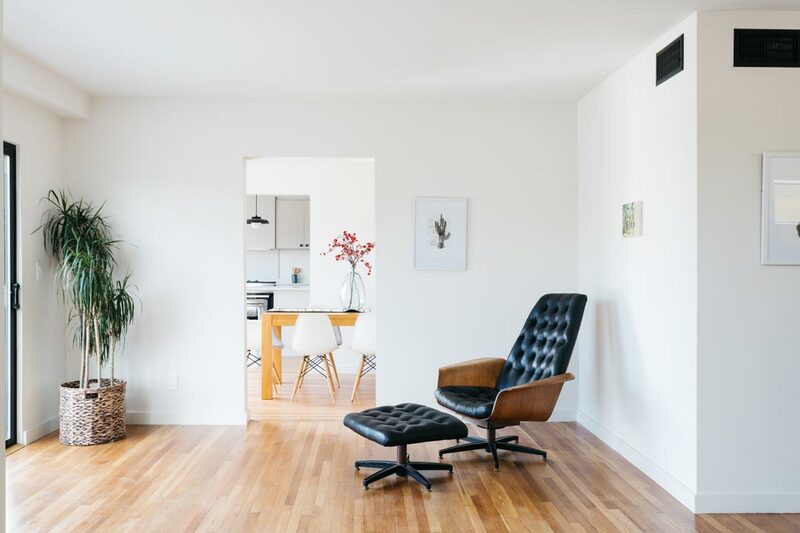 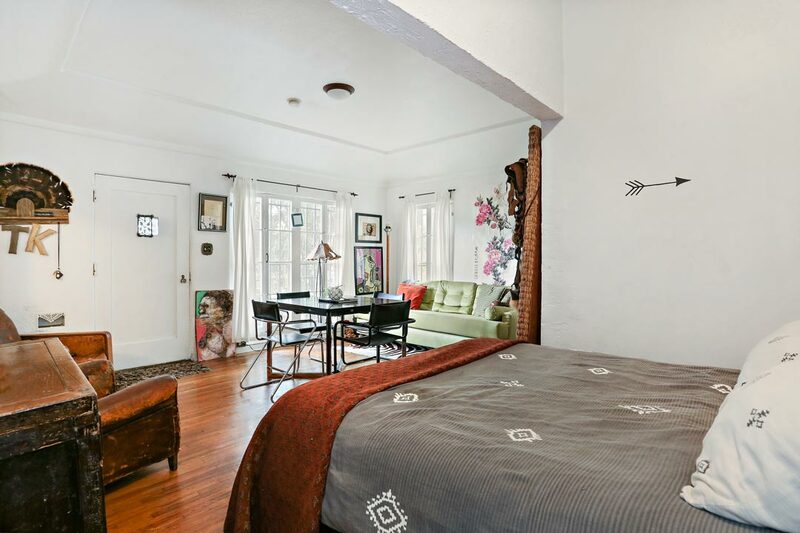 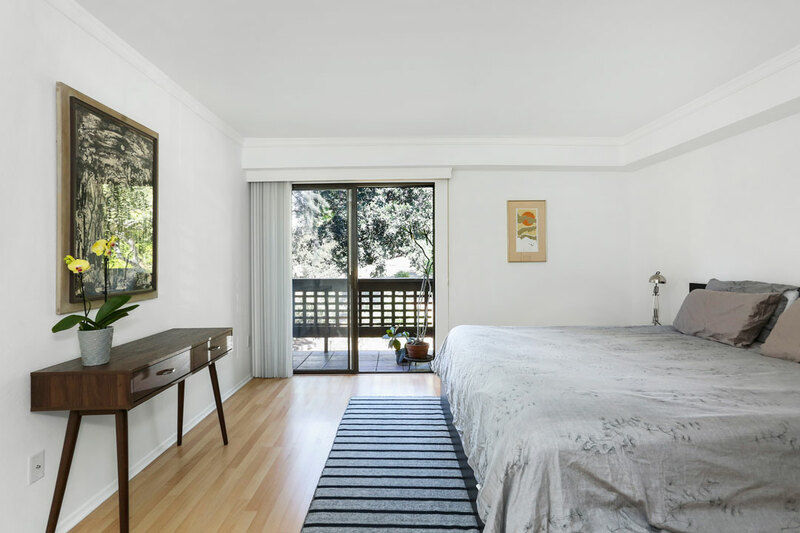 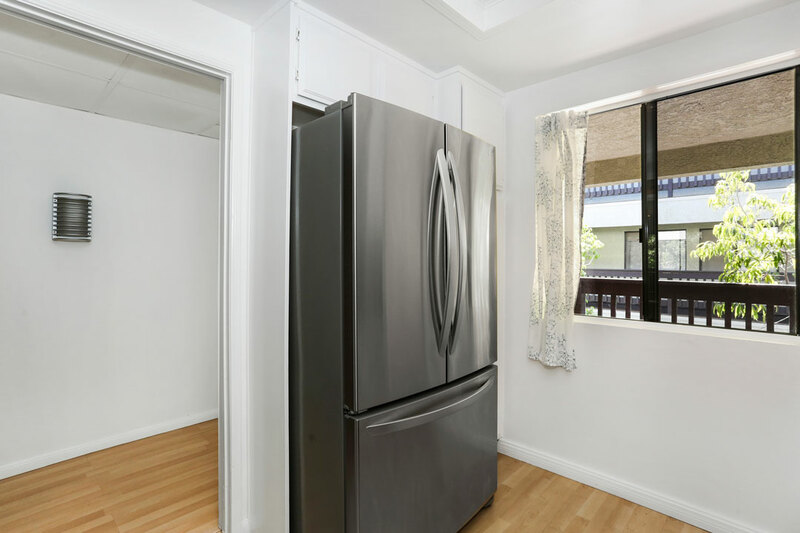 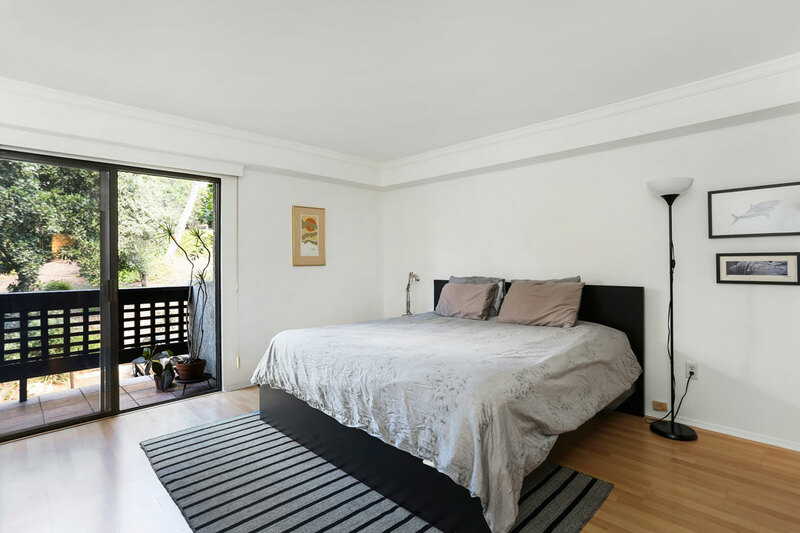 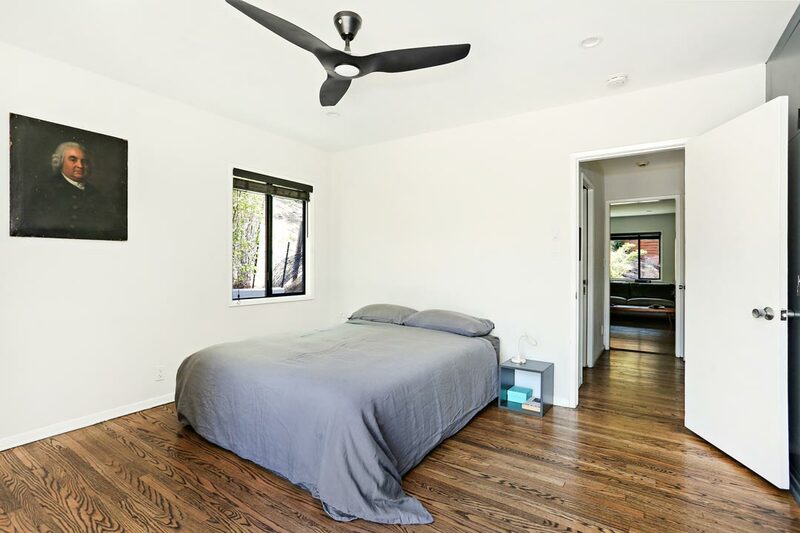 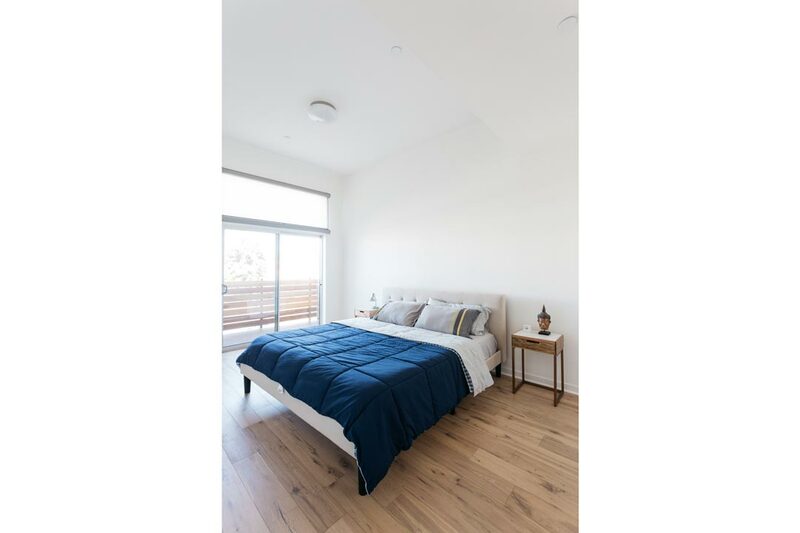 This prime location places you in the heart of Silver Lake with nearby dining and nightlife options including Alfred Coffee, Night Market Song, Hache LA and more. 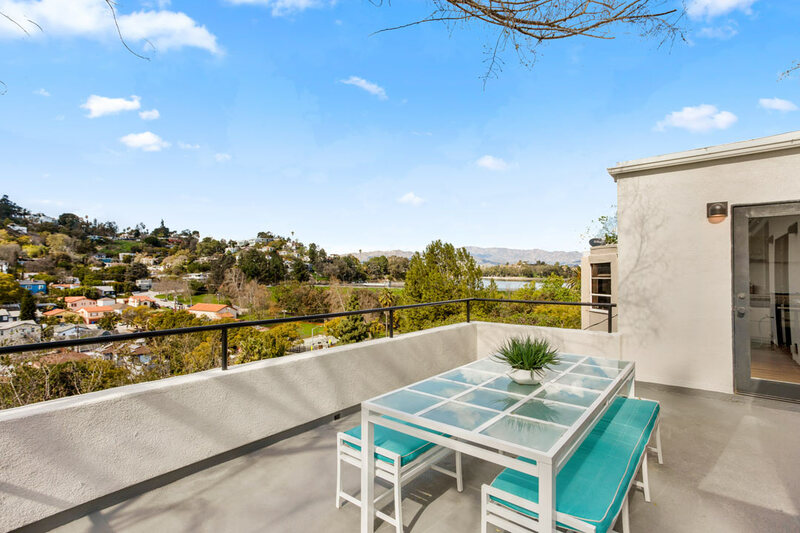 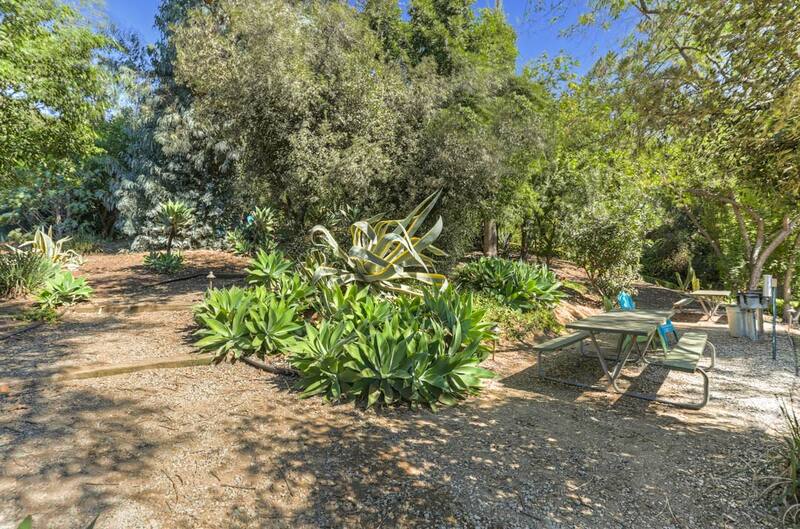 The Reservoir and Dog Park are within easy reach along with Whole Foods 365, Trader Joe’s, Gelson’s and Silver Lake’s twice-weekly farmers market. 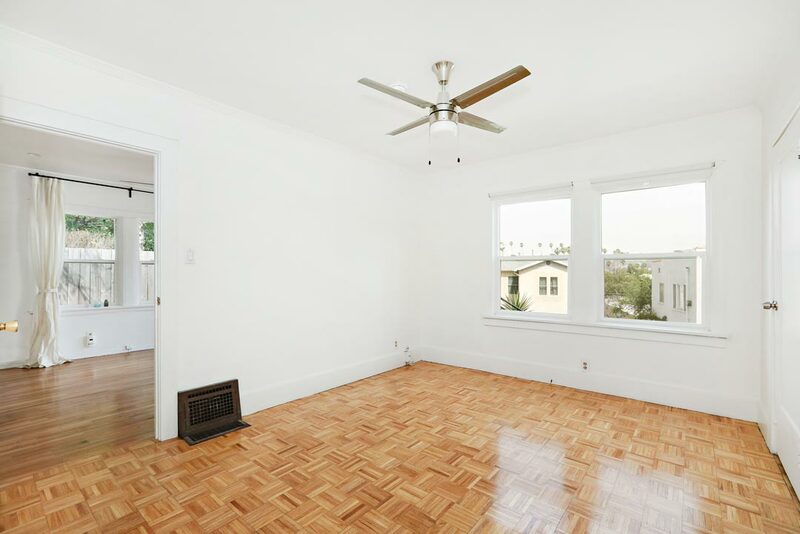 Available for lease: A spacious two-bedroom apartment in a great Silver Lake location. 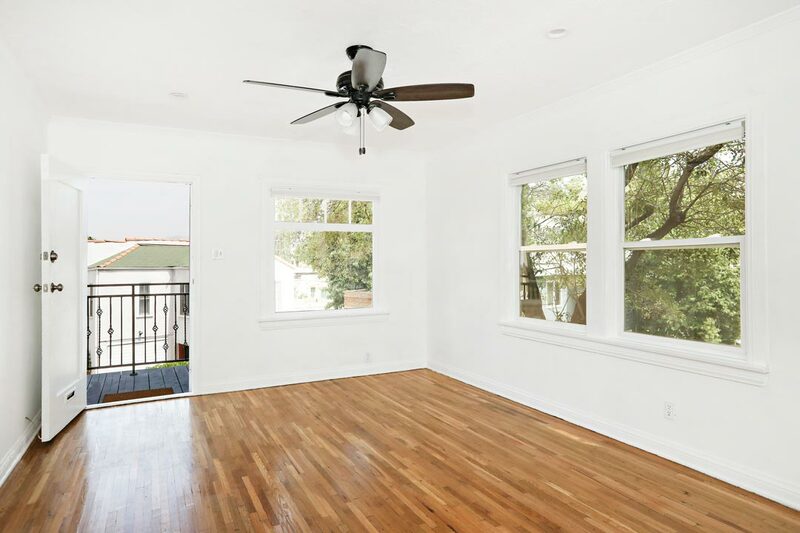 The sunny living room features character details including beautiful wood flooring, decorative moulding and large windows. 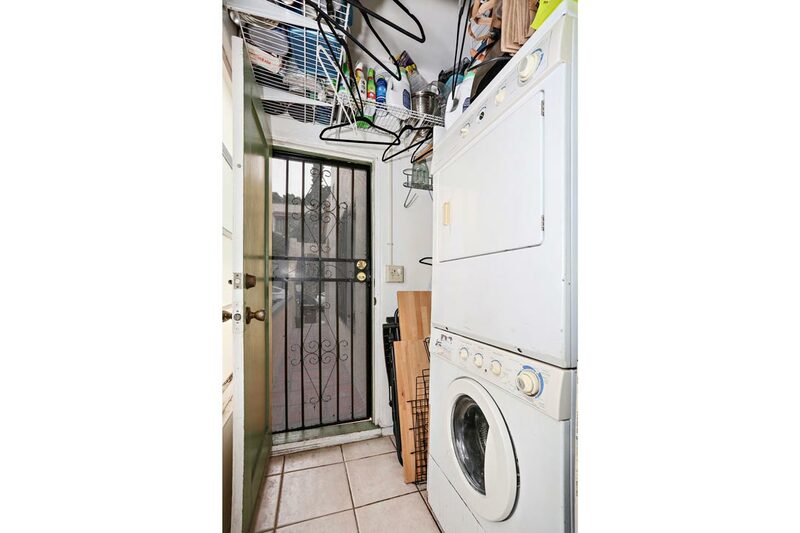 There is also a large storage closet in the hallway. 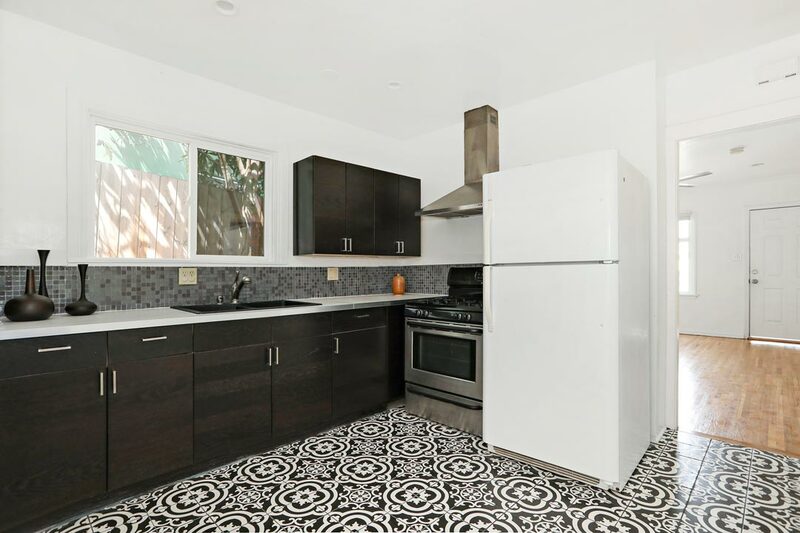 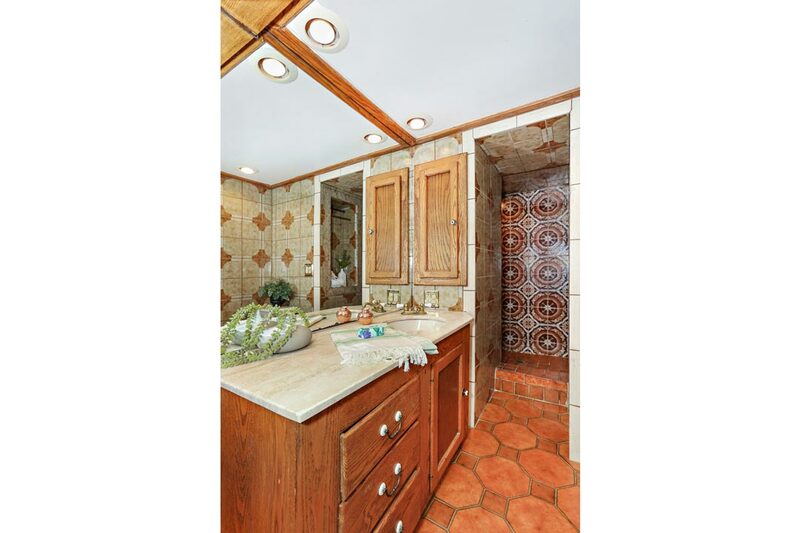 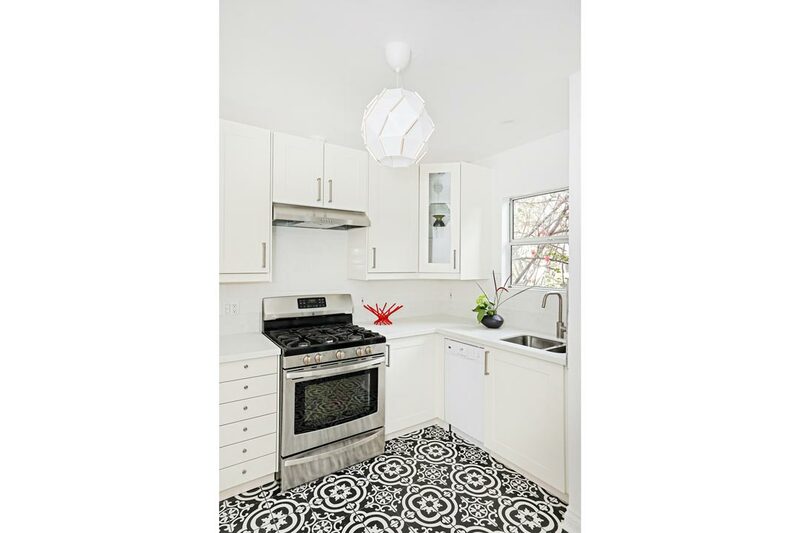 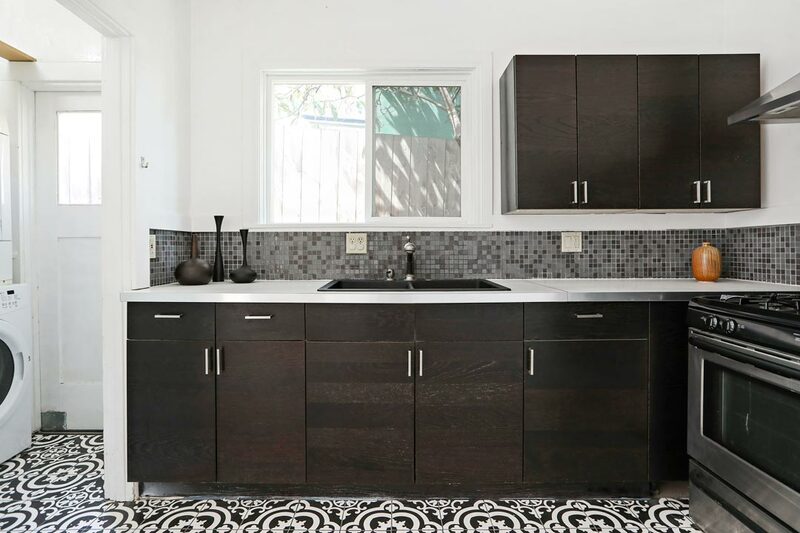 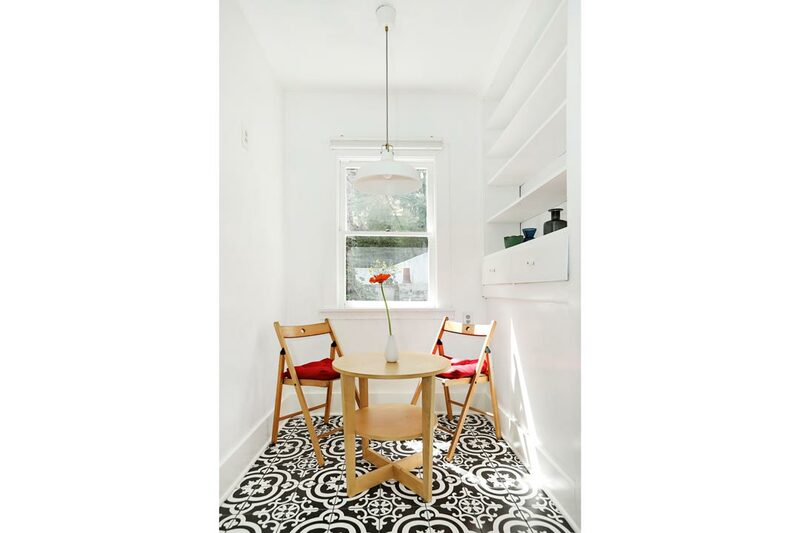 The updated and stylish kitchen has a breakfast nook and cool Spanish tile. 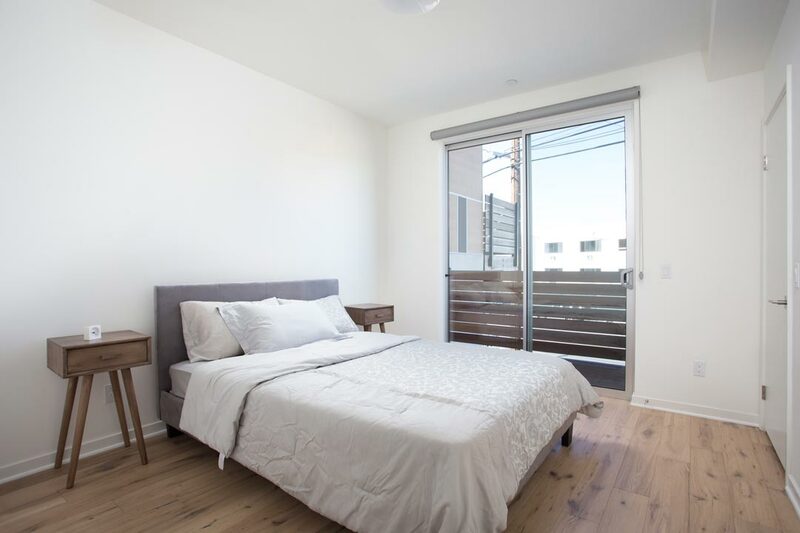 Both bedrooms provide closet space and one has French doors opening to the patio, your perfect spot for morning coffee. 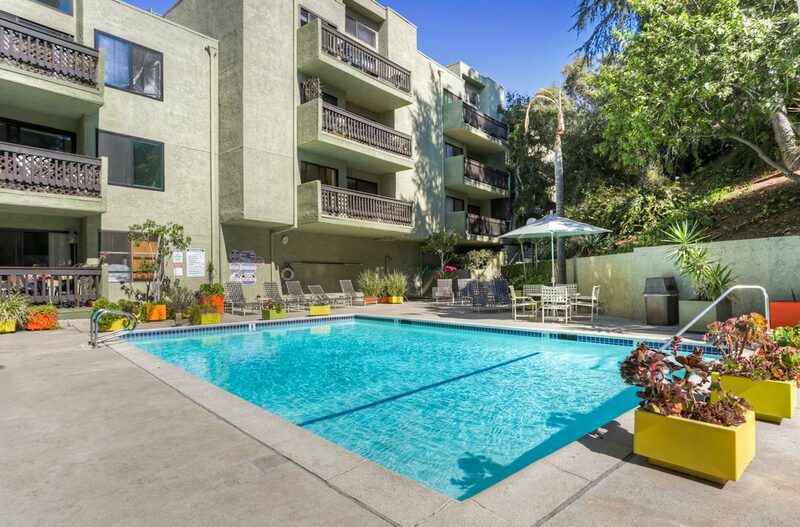 Amenities include air conditioning, washer+dryer, gas range and a designated off-street parking space. 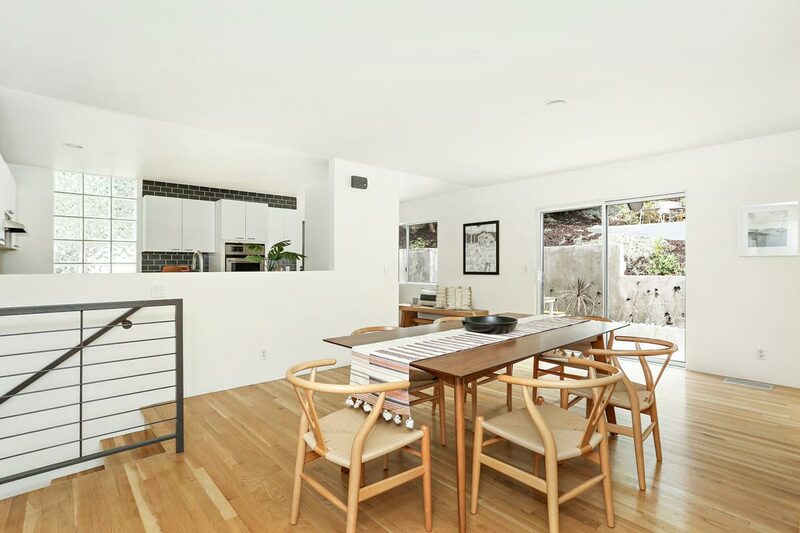 This prime location places you in the heart of Silver Lake with nearby dining and nightlife options including Alfred Coffee, Night Market Song, Hache LA and more. 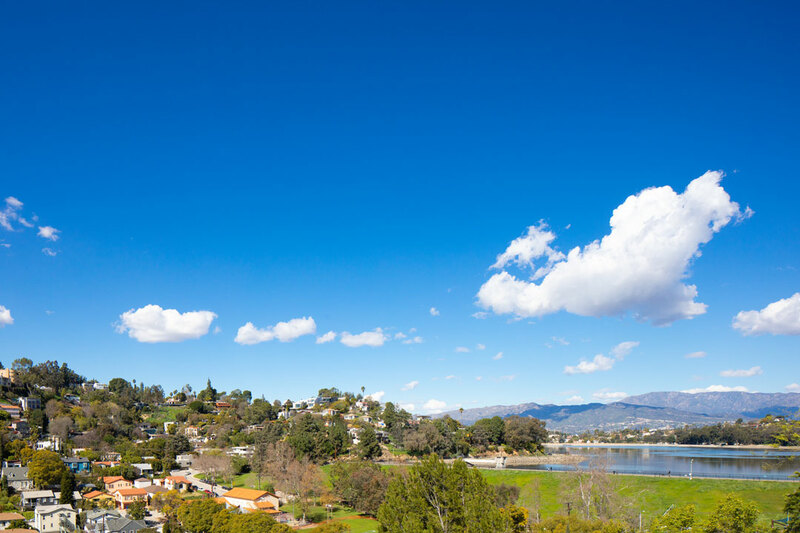 The Reservoir and Dog Park are within easy reach along with Whole Foods 365, Trader Joe’s, Gelson’s and Silver Lake’s twice-weekly farmers market. 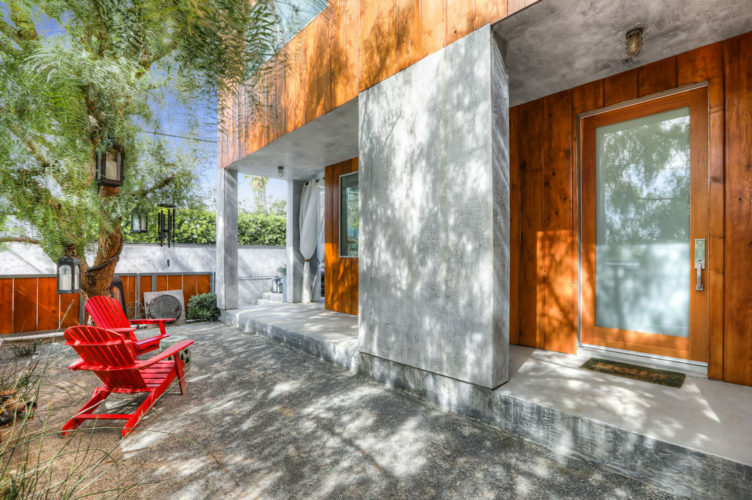 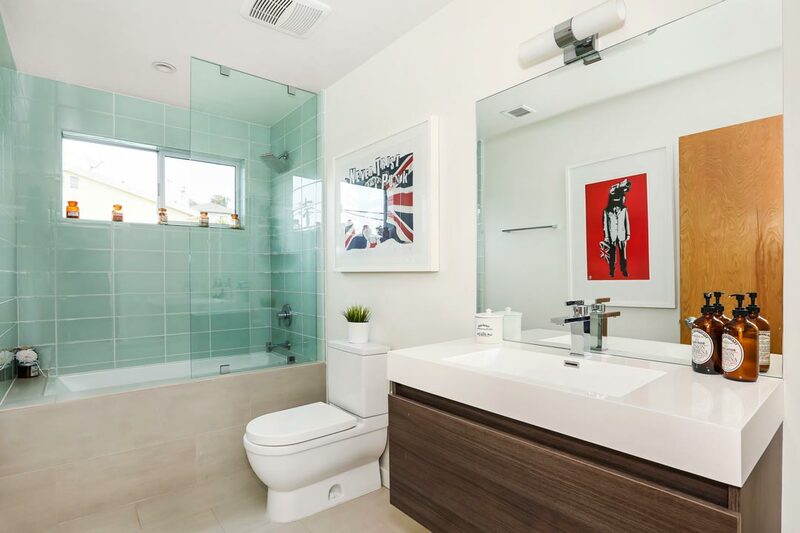 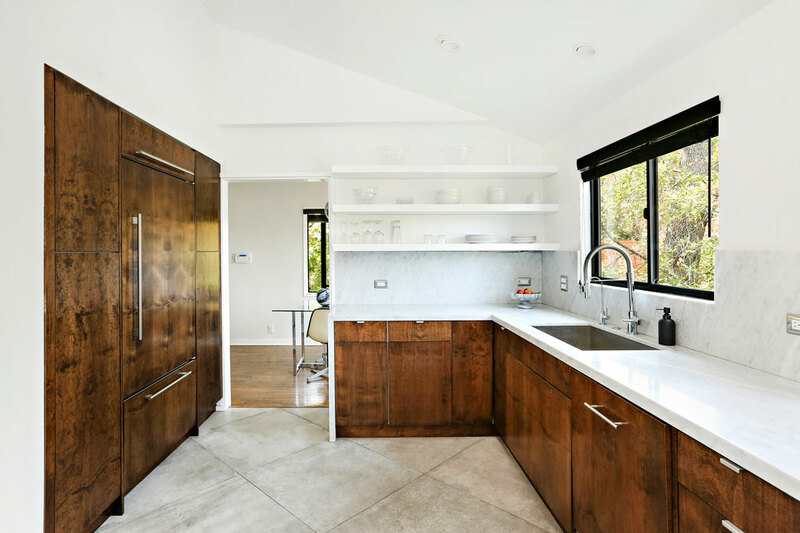 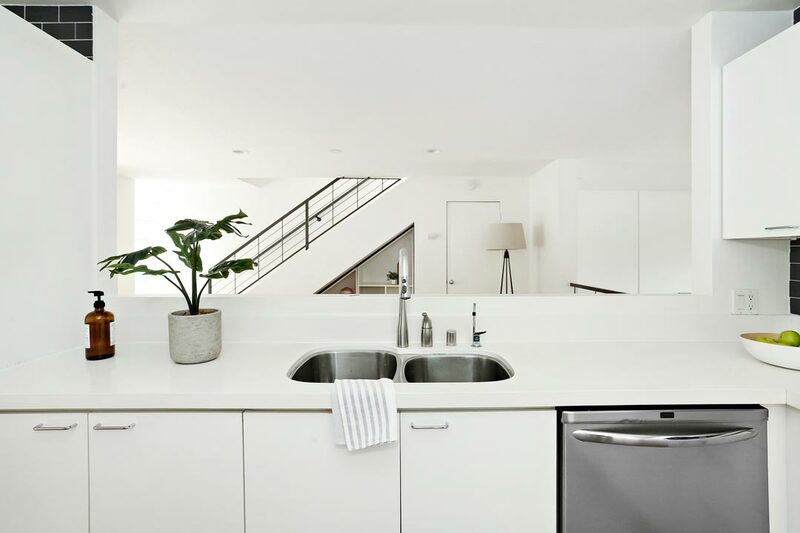 A modern home in prime Silver Lake, designed by Steven R. Hill. 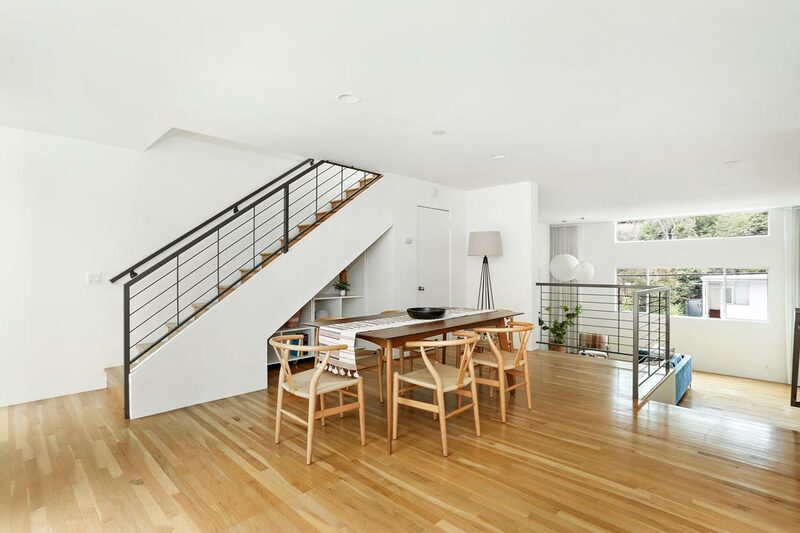 The residence impresses with soaring ceilings, open-rail stairways and clerestory windows gathering abundant natural light. 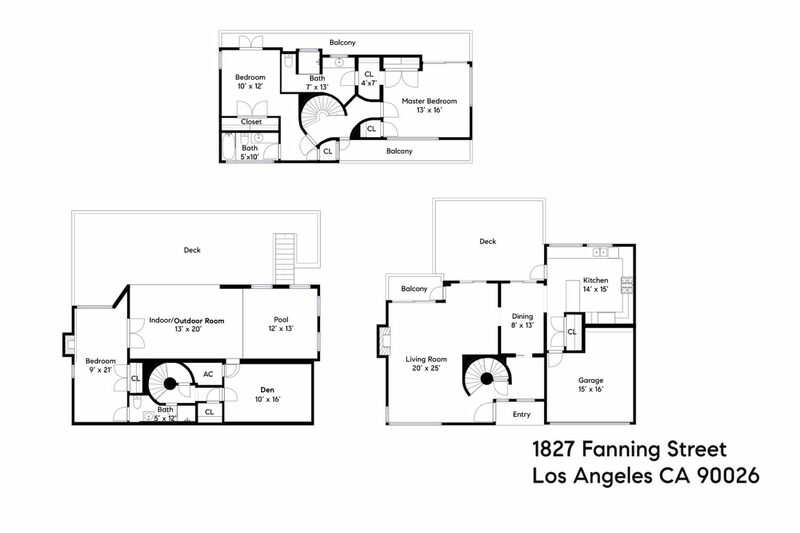 Exquisite design features include Hill’s signature elements of stucco, glass brick and the masterful use of space. 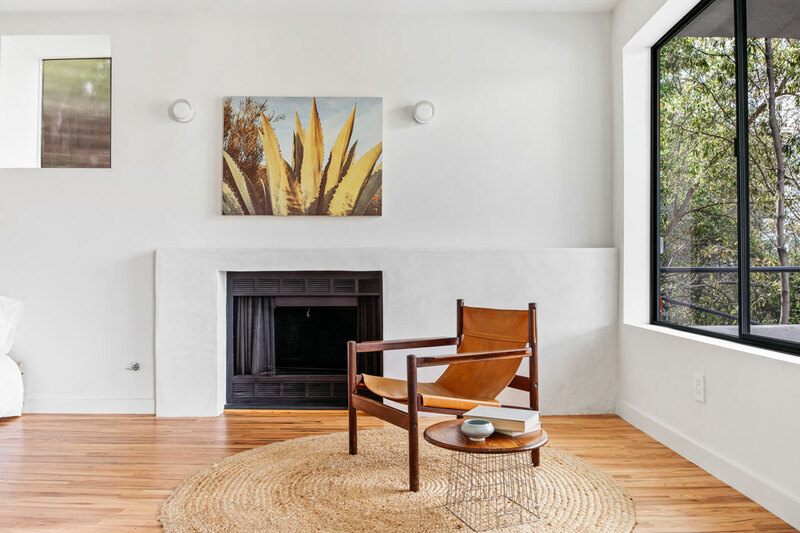 High walls and built-in shelving in the living room provide the perfect showcase for an art collection, anchored by a geometric hearth centerpiece. 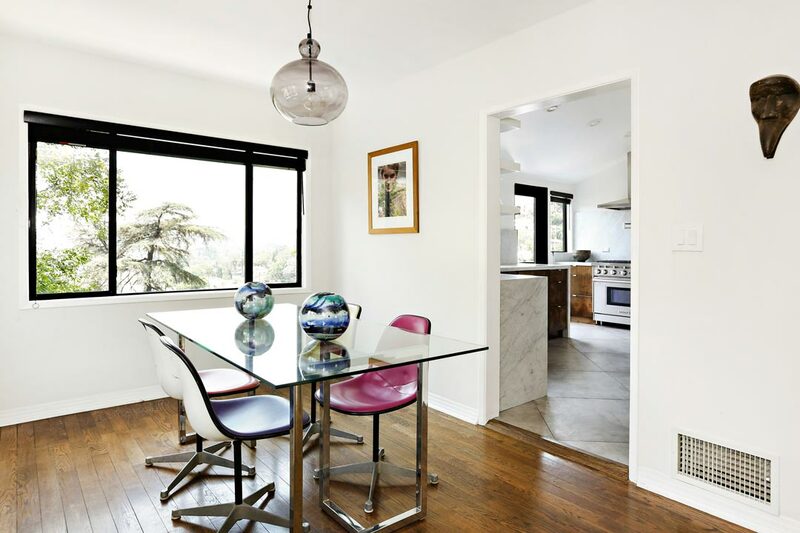 There is formal dining, a breakfast nook and beautifully remodeled kitchen. 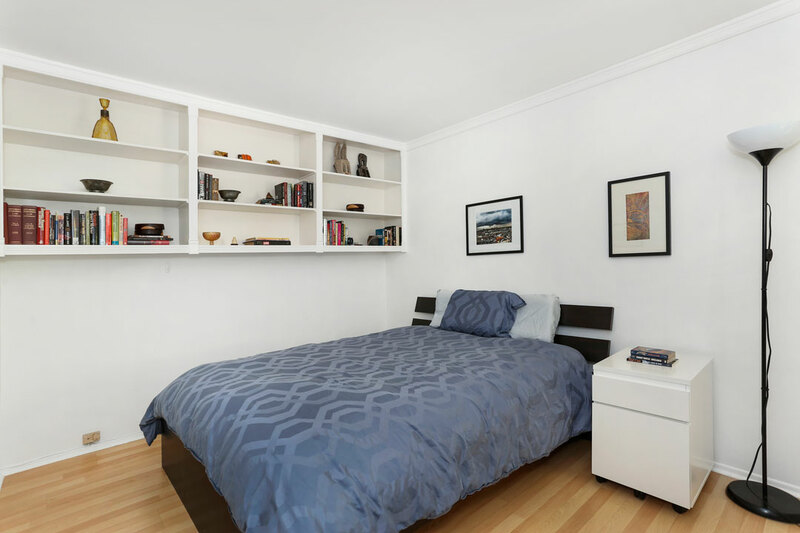 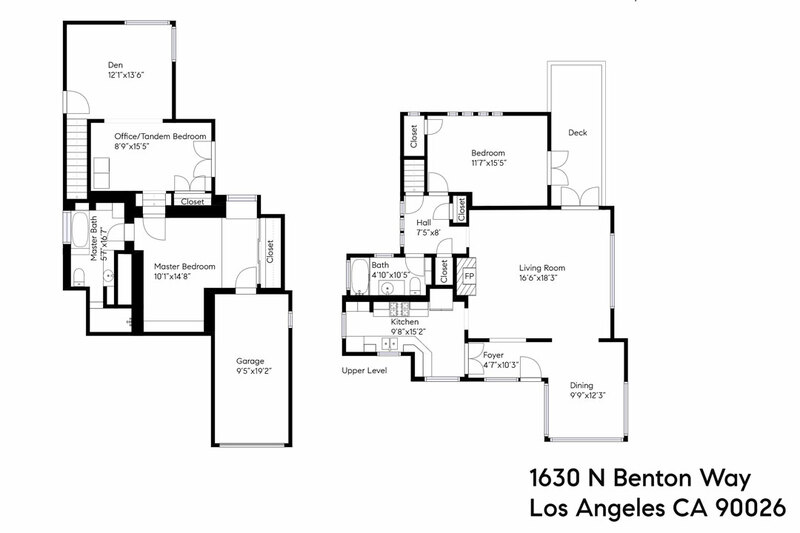 Three bedrooms include a spacious en-suite Master with a walk-in closet and fireplace. 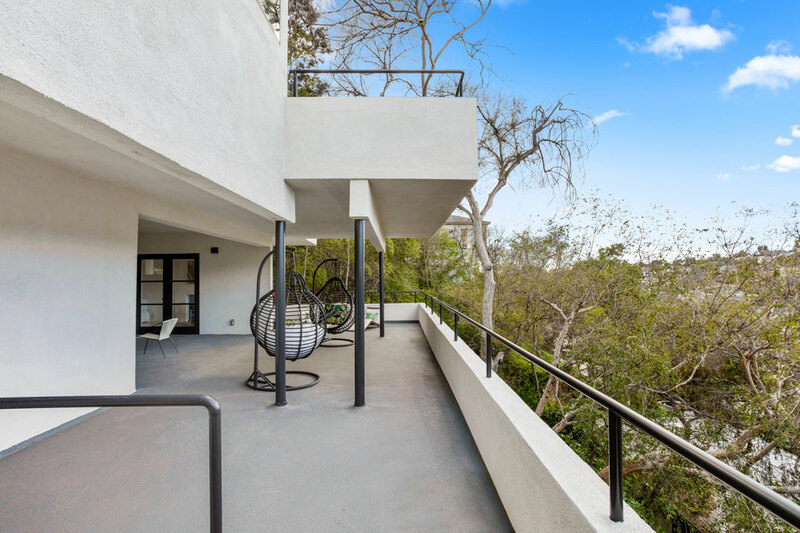 Outdoor access is seamless; the terraced yard provides multiple spaces for entertaining and stargazing along with lovely vistas of the hillsides and city. 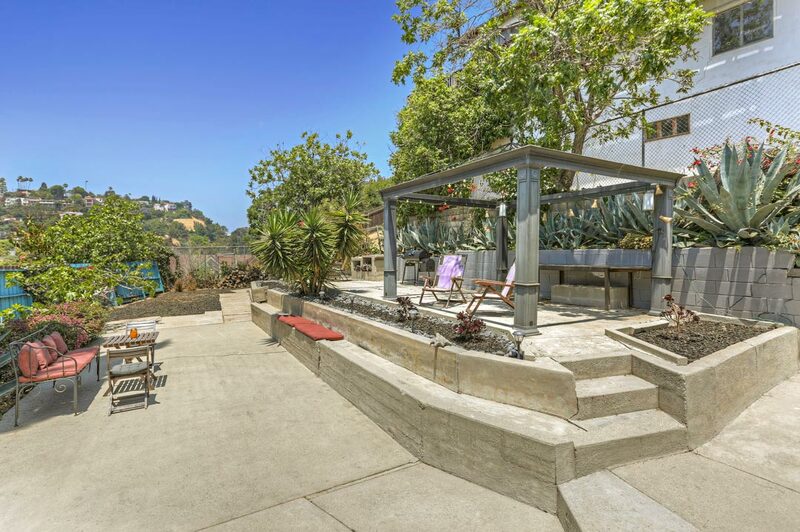 This excellent location is mere blocks from Sunset Junction with dining and nightlife options plus a twice-weekly farmers market. 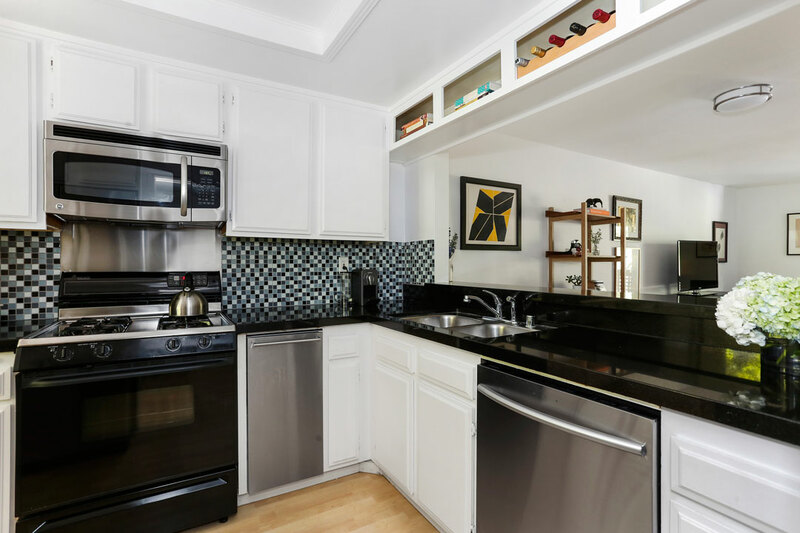 Nearby favorites include LAMill, Alimento, L&E Oyster Bar, Botanica and more.